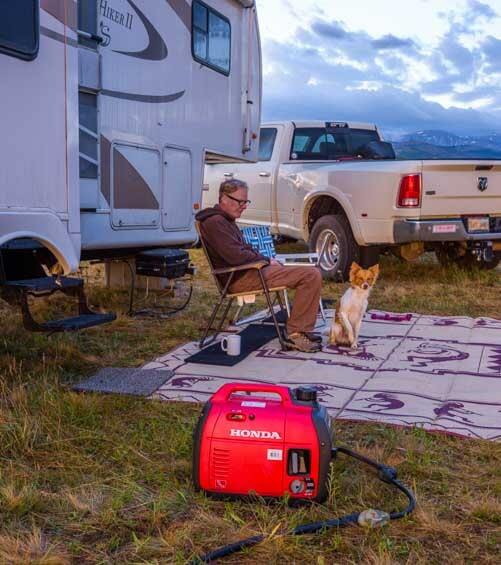 We have been loving the heck out of our Honda EU2200i generator for the last seven months and have already put about 150 hours on it. We live in our RV off the grid on solar power 24/7, and we rely on the sun for 98% of our power needs. However, in the last few months we have experienced an extraordinary amount of wildfire smoke and rain in our RV travels, and that trusty old orb in the sky was nowhere to be seen for weeks on end. 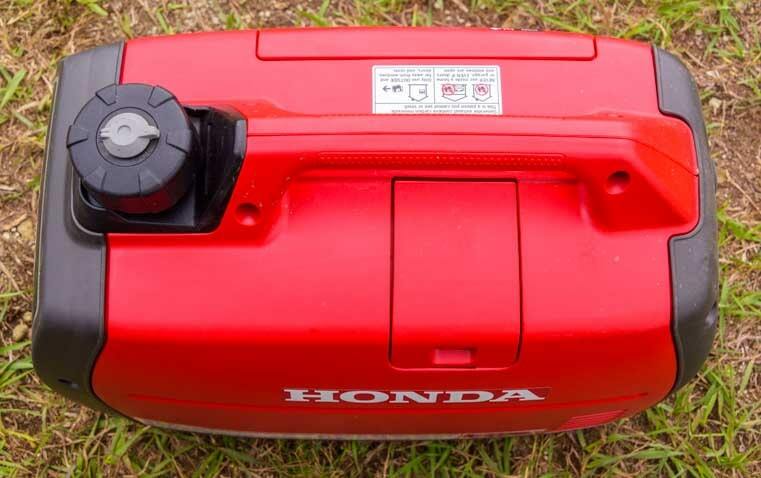 Why A Honda EU2200i generator? In the past we have used a generator only for a few days in mid-winter when the days are really short and storms blow in for a week at a time, limiting the amount of power our solar panels could produce, or for just a few days in mid-summer when the interior temp of our trailer shoots into the 90s and we run our air conditioner to cool down. 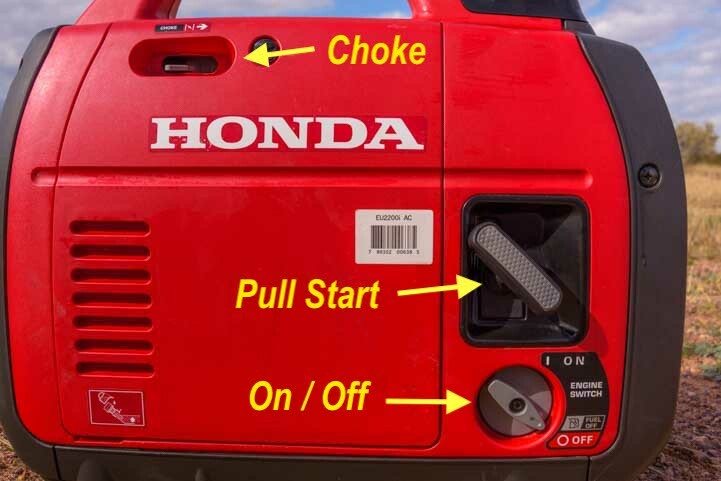 The back side of the Honda EU2200i generator. 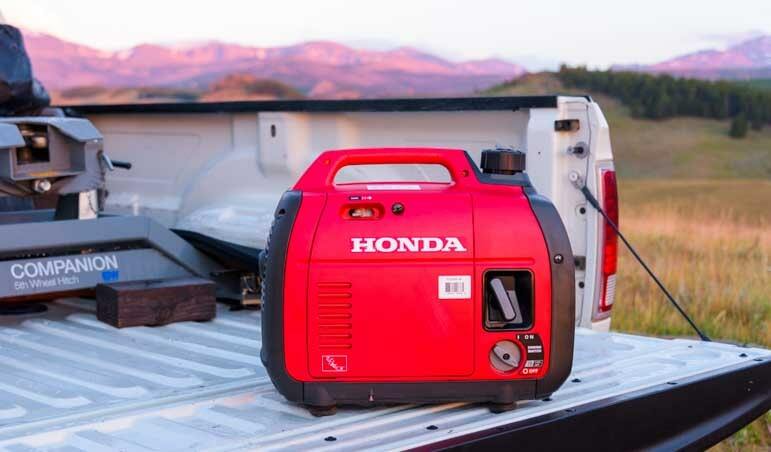 When we decided to get one of Honda’s new and easily carried 2200 watt generators in early May, we didn’t think we’d put it to use right away. We were headed to the cool mountains for a month or so, and we doubted we’d need our air conditioner. But our longer range plans were to go to the Upper Peninsula of Michigan and hang out along Lake Superior where we knew we’d be camping in shady spots under tall trees. Ironically, within a few weeks of getting our new 2200 watt Honda generator, wildfire smoke filled the mountain air, obscuring the sun and preventing our solar panels from being as effective as usual. The wildfire smoke was followed by weeks-long rain storms for the next few months as we traveled from the mountain states to Lake Superior. Oh my, were we happy it was so easy to set up our new little generator to keep our batteries nicely charged despite the dark skies. 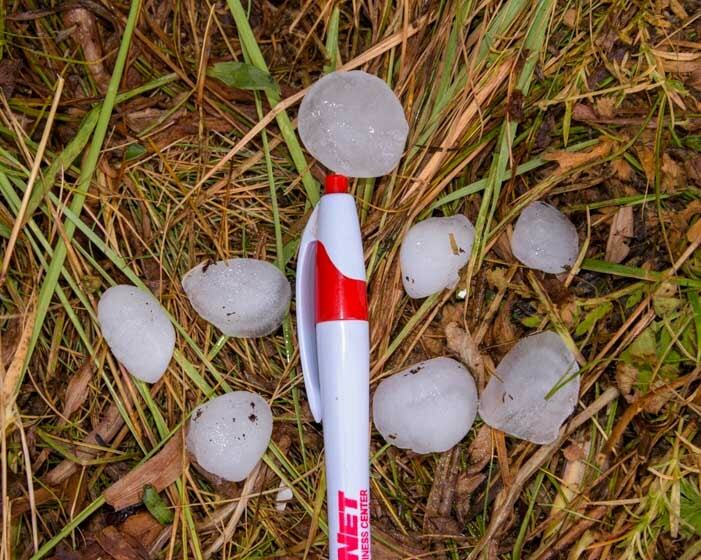 Solar power is great until a storm like this sweeps in! At one point we had to ask ourselves if we had inadvertently done a rain dance by getting this new generator! Just like how one of us always get really sick whenever we put a new bottle of Nyquil in our medicine chest, we wondered if the deluge of smoke and rains came because we now had an easy access generator that could power our lives on a moment’s notice! When storms blew in we got the generator out — and it was easy! 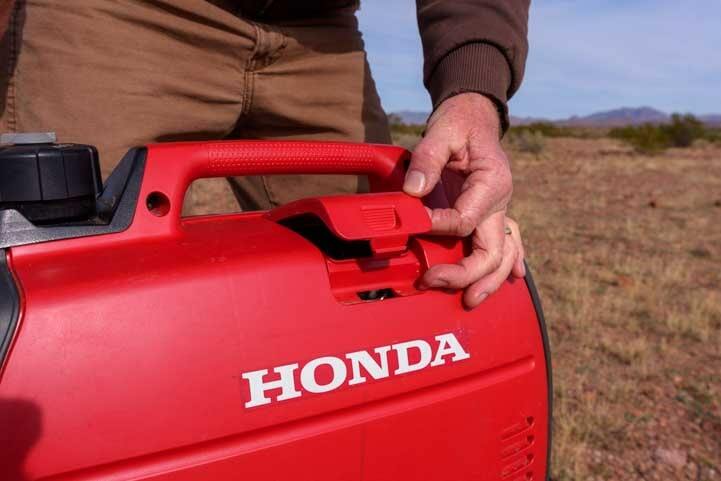 The Honda EU2200i is light and easy to Carry! 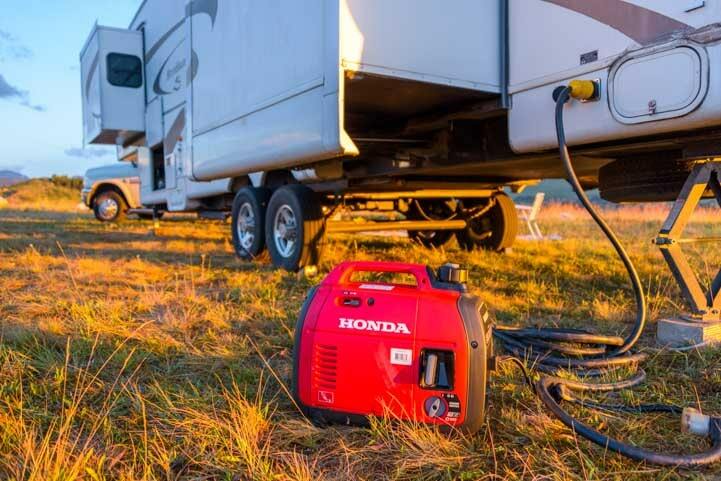 The Honda EU2200i generator is a new and improved version of the much beloved Honda 2000i generator that has been powering the lives of RVers for many years. If you wander through the desert in Quartzsite, Arizona, in January, you’ll see the popular red generators outside of many RVs. It weights just 46.5 lbs., holds just under a gallon of gas and delivers 2,200 watts of peak surge power and 1,800 watts of continuous power. 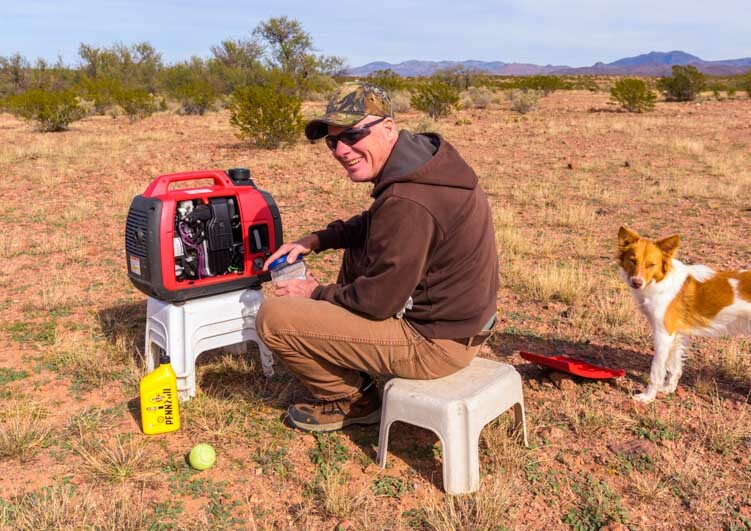 We have had a Yamaha 2400i generator with us since we started full-time RVing eleven years ago, and although it is a great generator, it is unwieldy to store, maneuver and set up. Too often we have looked at each other and said, “We really should get the generator out,” only to decide against it because neither of us felt like going through the hassle. 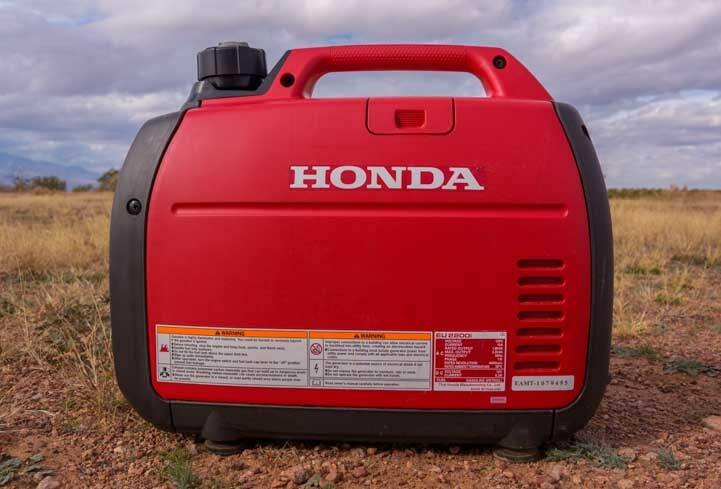 However, the light little Honda EU2200i generator has proven to be so darn easy to grab and set up that we often end up running it in circumstances where we wouldn’t have before. For the moment, it is living in the back of our truck right next to the bigger generator. Either one of us can pick it up with one hand and lift it out of the truck, even while gingerly stepping around the fifth wheel hitch and the rest of the obstacle course in the bed of our truck. Not so with its big brother. Starting the Honda EU2200i generator! 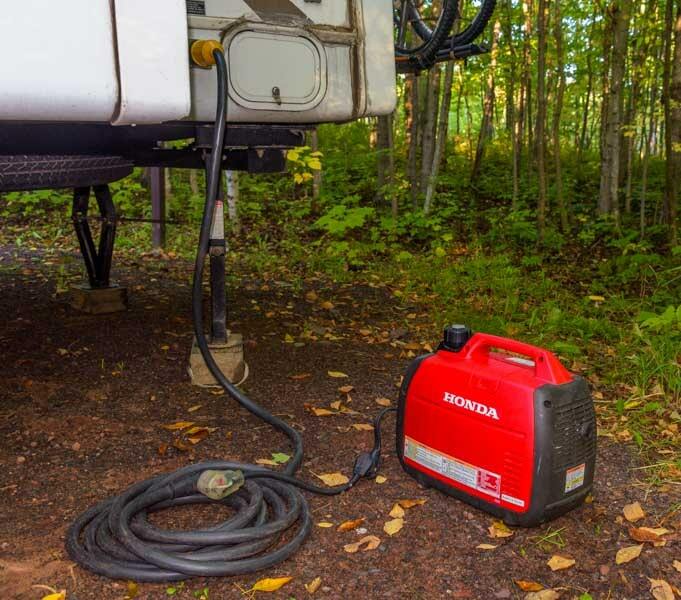 We like to start the Honda EU2200i generator without having it plugged into the RV so it can get a little warmed up before we put any loads on it. The shore power cord is plugged into the trailer, but we don’t plug the other end into the generator until the generator is actually humming along. 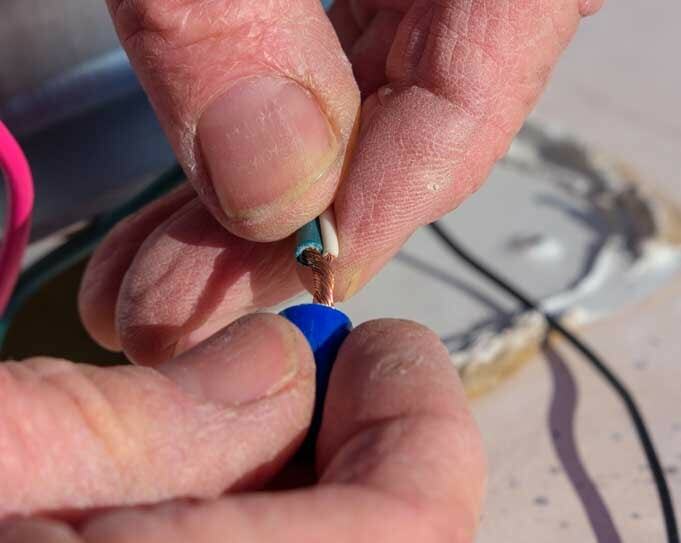 We keep these two adapters on hand because it gives us the flexibility to connect the RV’s shorepower outlet to either a 15 amp power source or a 30 amp power source. 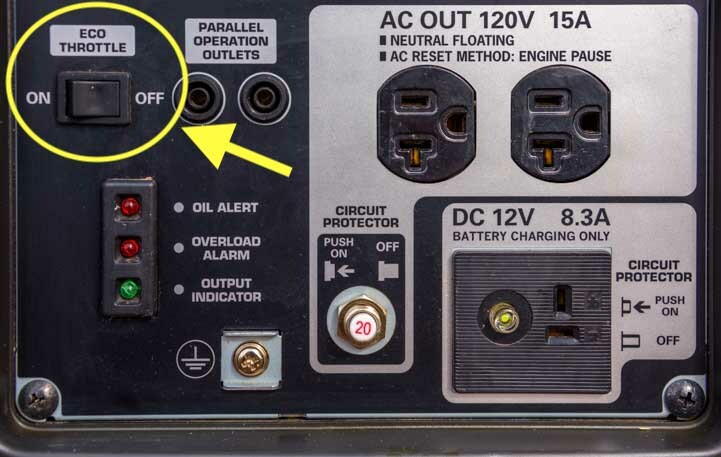 However, you can also go directly from the 50 amp outlet on the RV to the 15 amp outlet on the generator and skip dragging out the heavy shore power cord by using a 15 amp Male to 50 amp Male adapter. Then pull the pull start cable and away you go. First point the gray dial to “On” to vent the gas cap. Mark painted the “On” and “Off” labels to make them easier to see. 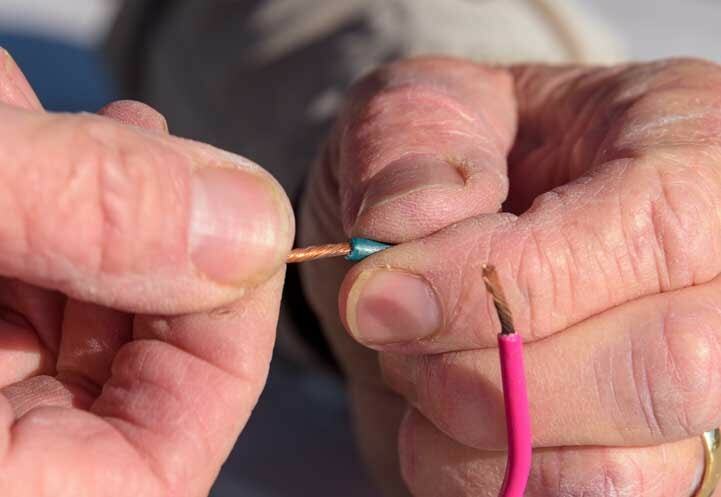 Then close the choke and set the generator switch to “On.” Now you’re ready to pull the start cord. Shortly after the generator roars to life, slowly open the choke (move the switch to the left). We like to position the generator so the exhaust goes away from the trailer. If there are other people camped in the vicinity, we also like to place it somewhere in our campsite that it is as far from their campsite as possible so we don’t annoy them when we run it. If it is raining out, we put it under one of the slide-outs so it doesn’t get wet. Sometimes these locations are not optimal for pulling the start cord and getting the generator going (especially crawling under a slide-out!). But this little Honda generator is so light it is easy to maneuver it to wherever we want to place it, even after it is running. All set up and purring away. 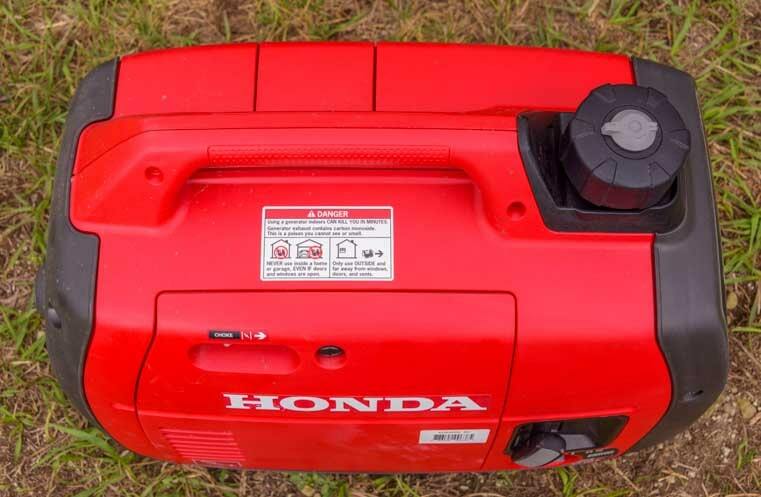 One of the really nifty features on the Honda EU2200i generator is the Eco Throttle. This is located on the “business end” of the generator in the upper left corner. Turning it on lowers the RPMs of the generator so it doesn’t use as much gas and runs more quietly. 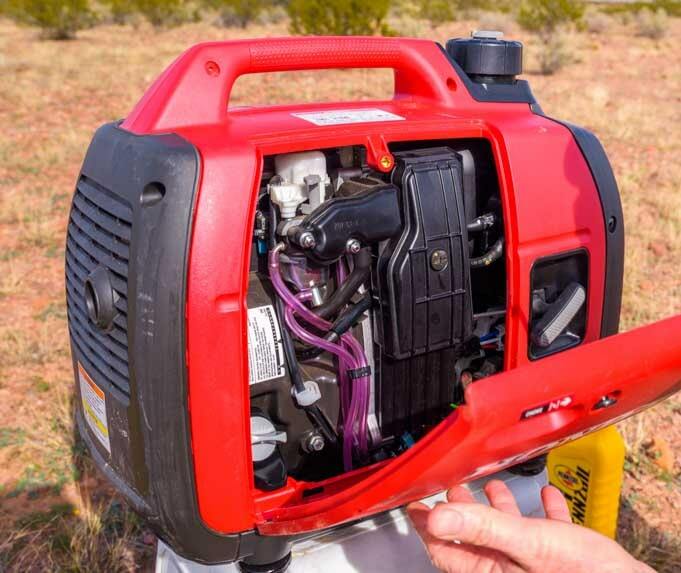 If we are going to run the generator for a number of hours primarily to charge the batteries and do other things that put just a small load on the generator like using our laptops, running the lights at night, or watching a movie on TV, we keep the Eco throttle turned on. We tested the generator to see how long it would run if we filled the 0.95 gallon gas tank before it ran out of gas. We had it in Eco mode and used our laptops and other small things while it was running. It ran for 9.5 hours! We don’t usually run the generator for nearly that long. As I’ve described in our article about what happens when you run solar power and shore power simultaneously, the best time for solar powered RVs to run a generator is in the morning hours. 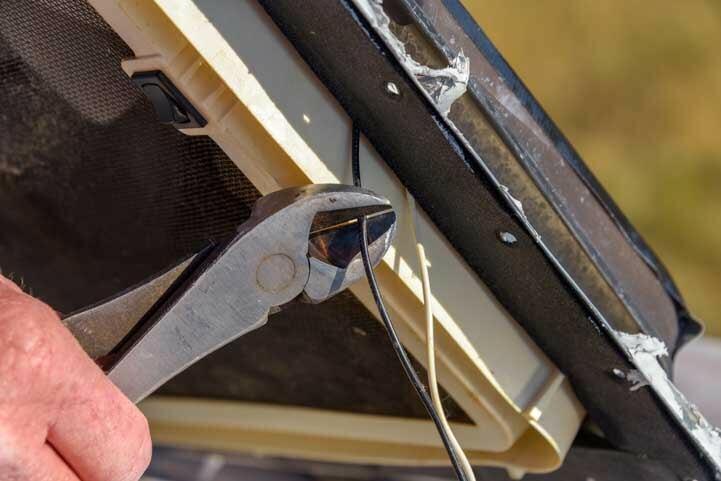 This helps get the batteries sufficiently charged so they can easily reach their charging (Absorb) voltage under solar power alone once the generator is turned off. This gives them more daylight hours to complete the Absorb stage before the sun goes down. 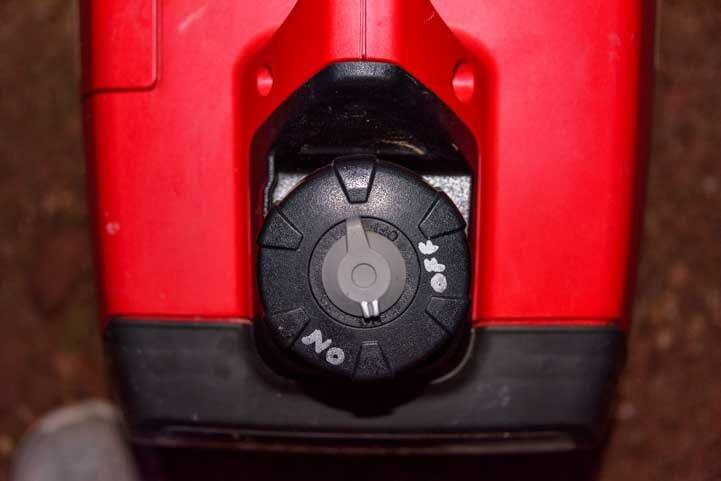 The Eco Throttle switch allows the generator to run more efficiently and quietly when loads are light. Eco mode is our default with this generator, both to save gas and to hear the generator’s quiet purr instead of its louder roar. In Eco mode it is as quiet as our Yamaha 2400i generator, but when it is not in Eco mode it is a little louder. 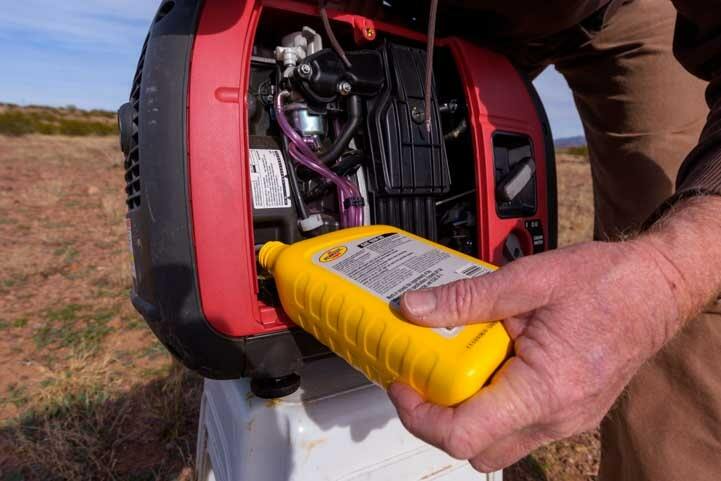 If you suddenly place a big load on the generator when it is in Eco mode, it will temporarily go into higher RPMs to provide the required power. If we turn on the toaster while in Eco mode (our toaster is an 800 watt model), we can hear the generator rev up while the toaster is making toast. As soon as the toast pops up, the generator idles back down. If we do the same thing in non-Eco mode, the generator is already humming along at a fast pace, and it doesn’t need much of a surge to operate the toaster. If the generator is in Eco mode and we use the microwave (ours is an 1100 watt model), the generator has a slight lag time as it first senses the heavy load and then revs up to provide the necessary power. There is an audible drop in tone and dimming of the lights on the microwave for a second or two before the generator roars to meet the challenge. We’re not sure this momentary dip in power is good for the microwave, so if we plan to use it we prefer to have the generator running in non-Eco mode first. 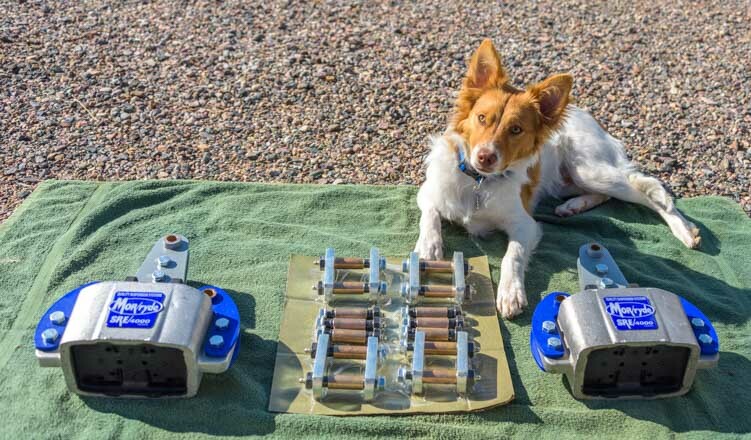 Can it power an RV air conditioner? We have a 15,000 BTU air conditioner on our 36′ fifth wheel trailer. 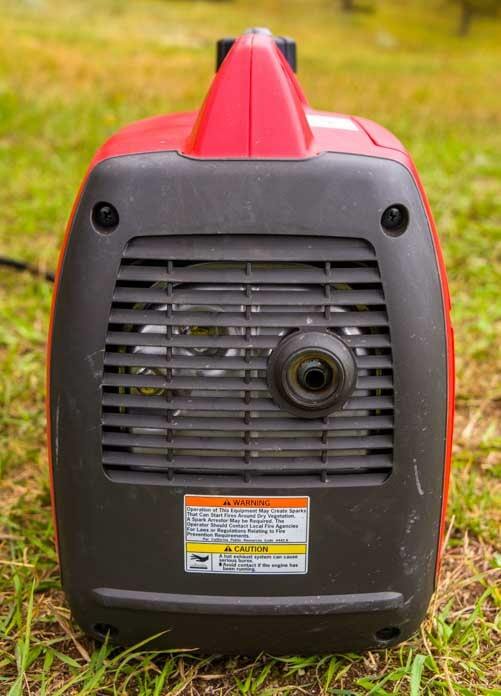 With some coaxing (i.e., warming up the generator, then turning on the Coleman air conditioner’s fan and finally turning on the air conditioner itself), our Yamaha 2400i generator can handle the air conditioner’s initial power surge and run the it for hours on end without a hitch. We were hoping the much lighter and smaller Honda EU2200i might be able to run it too. However, the generator’s 2200 watts max power is not quite enough to handle the surge when the air conditioner starts. It is likely it could power a 13,500 btu air conditioner (standard on smaller RVs) just fine. 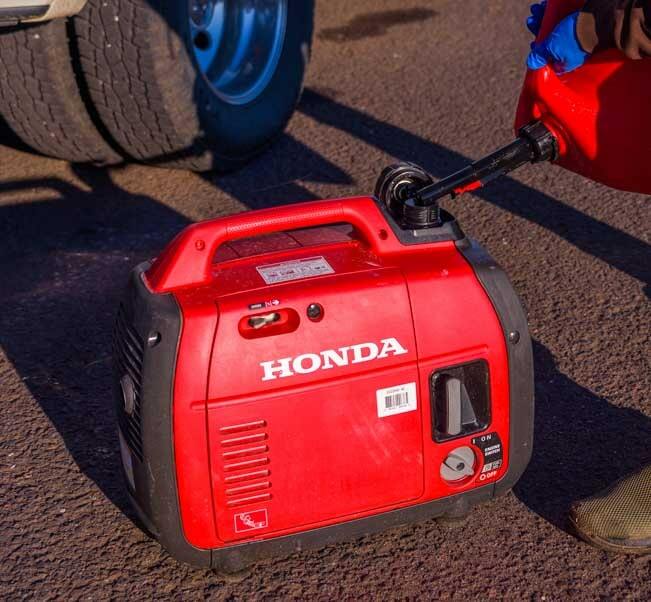 The Honda EU2200i generator is designed to work in parallel with a twin generator and connector cables, giving you 4,400 watts of peak power, more than enough to run a 15k BTU air conditioner. You can probably run the microwave at the same time with that kind of juice! The wonderful thing about this setup is that the two generators are a lot smaller than one big 4.4kw generator would be. 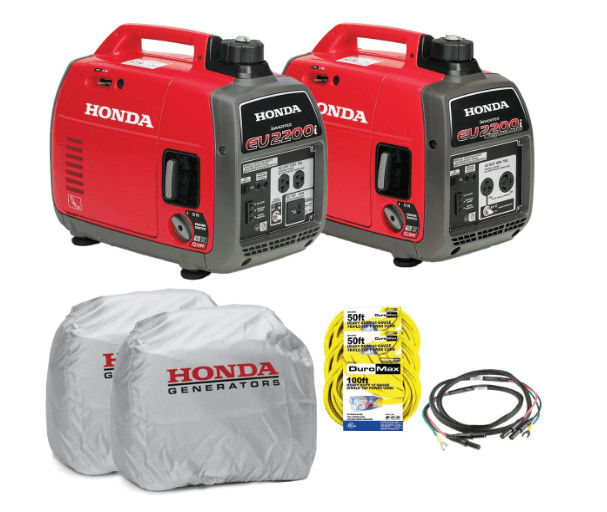 Honda EU2200i + EU2200ic Companion Generator Parallel Combo Kit with covers for each. The hardest part about putting gas in a generator is fiddling with the child-proof, spill-proof, idiot-proof gas can. Government regulators have obviously never used a gas can in their lives, and we’re quite sure a lot more gas has been spilled on our precious environment because of the newfangled user-unfriendly spouts than ever was spilled using the trusty old gas can spouts of days gone by. Good luck with the gas can spout! Easy access on the top of the generator for gassing it up. 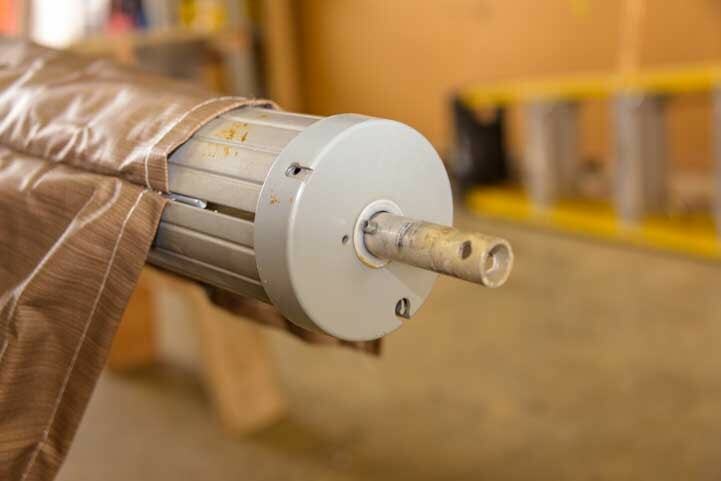 We’ve been adding Seafoam Motor Treatment to the gas in the generator. This fuel stabilizer cleans the carburetor, keeps the engine clean, and we find it makes it easier to start. When we cruised Mexico in our sailboat, we used it in the outboard motor for our dinghy and were very pleased with the results. 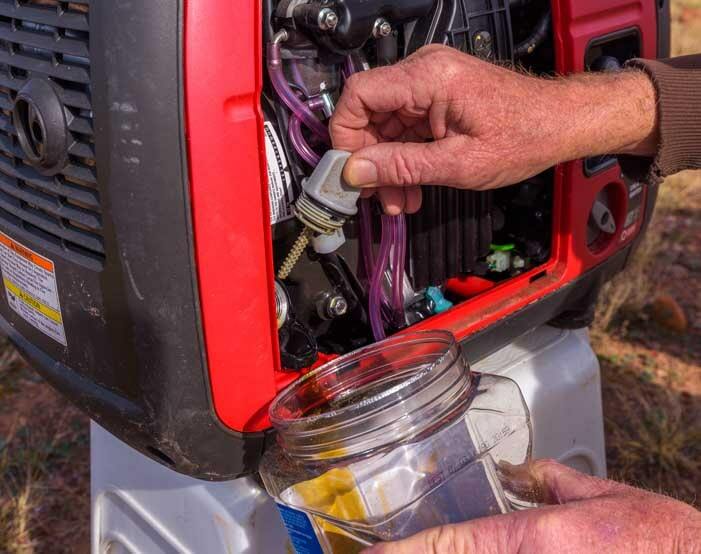 Changing the oil on the Honda EU2200i generator is a snap. First find a pleasant place to do it. Mark likes to elevate the generator onto some kind of platform so it is easy to drain the old oil out of the bottom. As always, Buddy likes to supervise. Changing the oil doesn’t take long, but doing it in a pretty place makes it more fun. 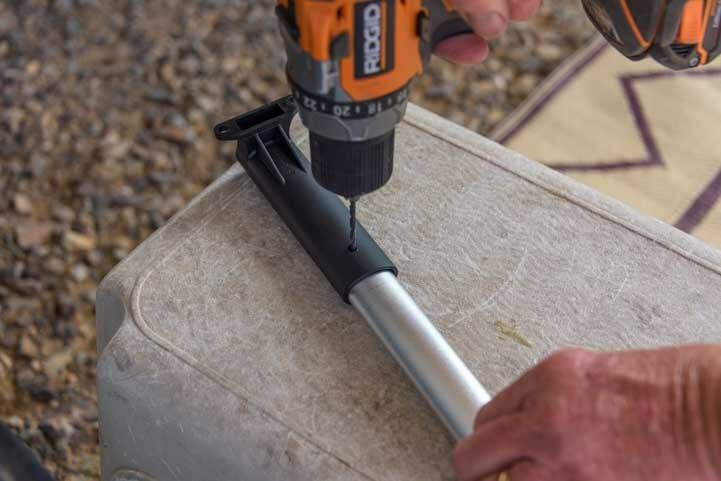 The first step is to unscrew the single screw that holds the front panel on the front of the generator and remove the panel so you have full access to the heart of the machine. Access the heart of the generator via the side panel on the front. 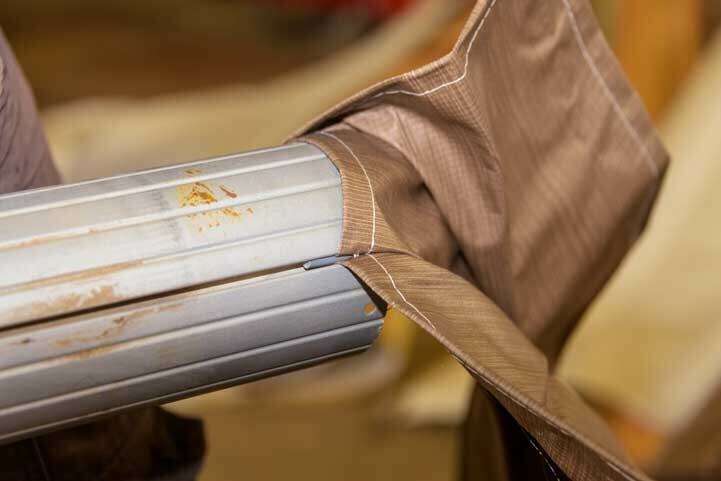 Once it’s unscrewed, the side panel lifts off easily. 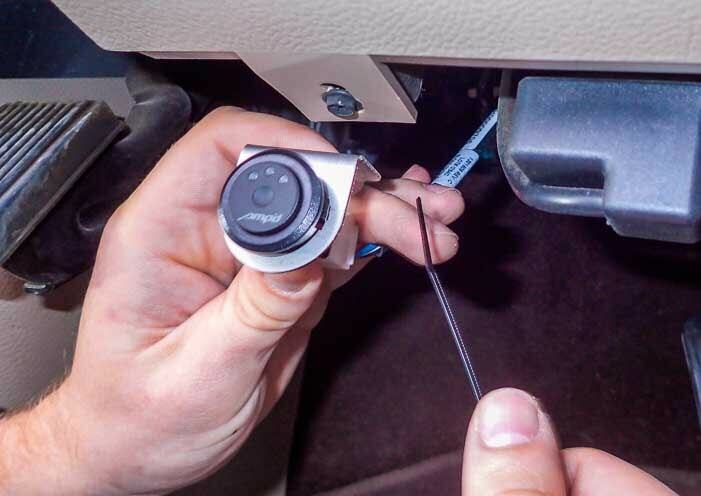 To check or change the oil, simply unscrew the dipstick in the lower left corner. 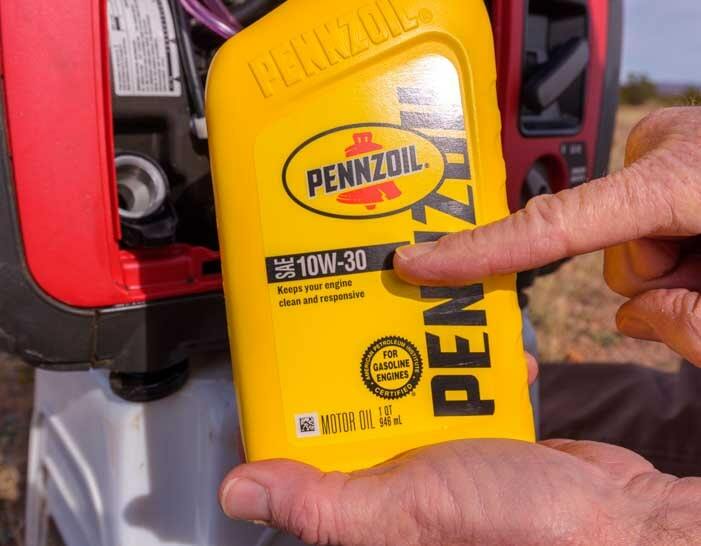 If you are just checking the oil, make sure the oil level fills the spout and is clear. Honda recomments changing it every six months or 100 hours of use (keep track of the hours of use in a log book). The dipstick is in the lower left corner. Unscrew the dipstick to check the oil and/or to change it. 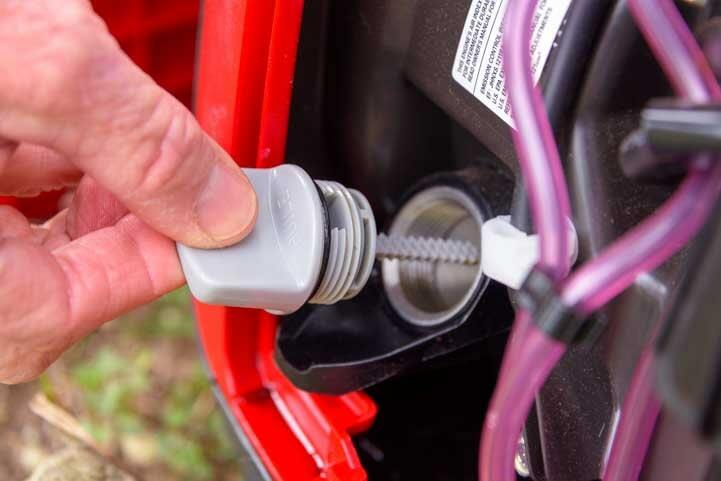 When changing the oil, hold a container of some kind below the spout. Any container that can hold 14 ounces of liquid is fine. 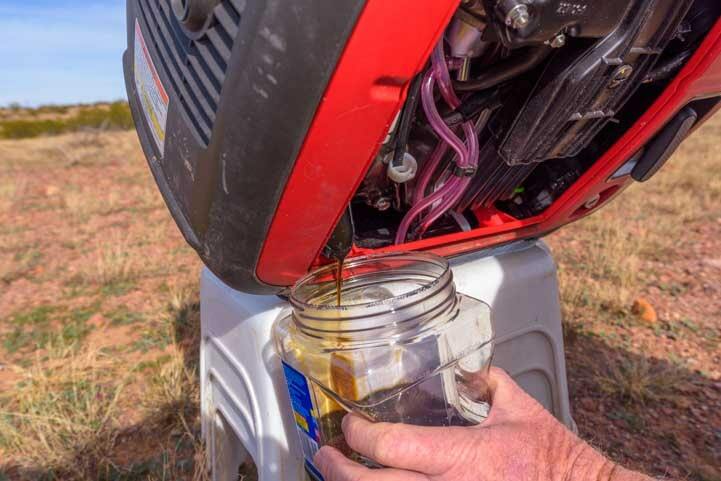 Or you can drain the oil into an oil drain pan and then, after the new oil has been put into the generator, pour the old oil into the container that held the new oil. In the case pictured here, Mark used an old plastic peanut jar with a screw top lid. Drain the oil into an easily sealed container that holds at least 14 ounces. To get all the oil out, tip the generator slightly towards you. Tip the generator towards you to get out every last drop. 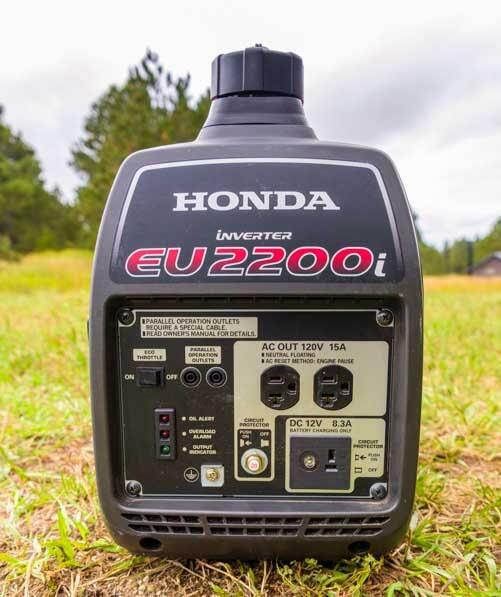 The Honda EU2200i generator uses SAE 10W-30 oil. Once the old oil is completely drained out, pour the new oil in. 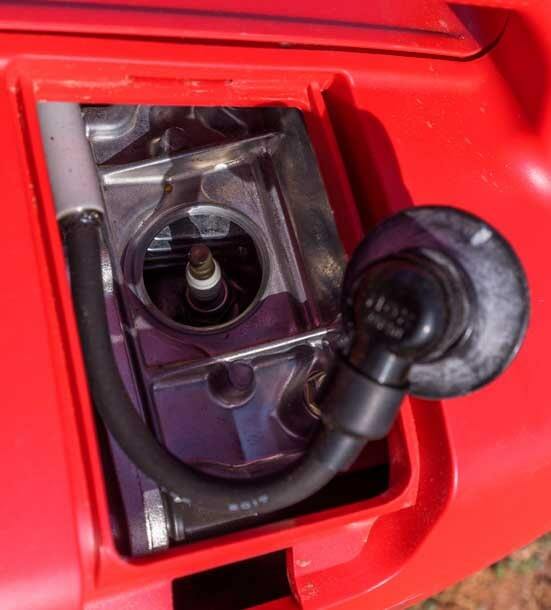 The oil reserve is properly filled when the oil comes right to the edge (with the generator sitting level). Once it’s full, screw the dipstick back in and tidy up any drips with the rags. The generator takes 14 ounces of oil and, of course, oil is sold in 16 ounce bottles. 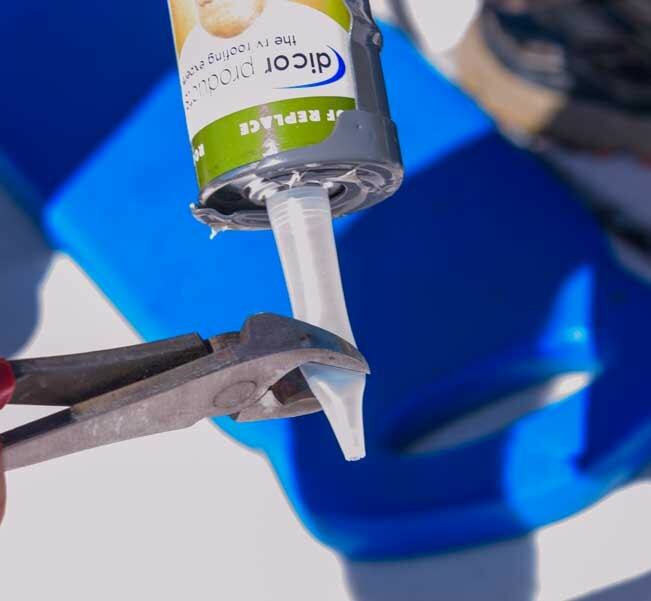 You can save the last two ounces for other odd jobs around your RV in one of these classic oil cans. Grandpa will be proud! Since the front panel of the generator is off, now is a good time to inspect the air filters. 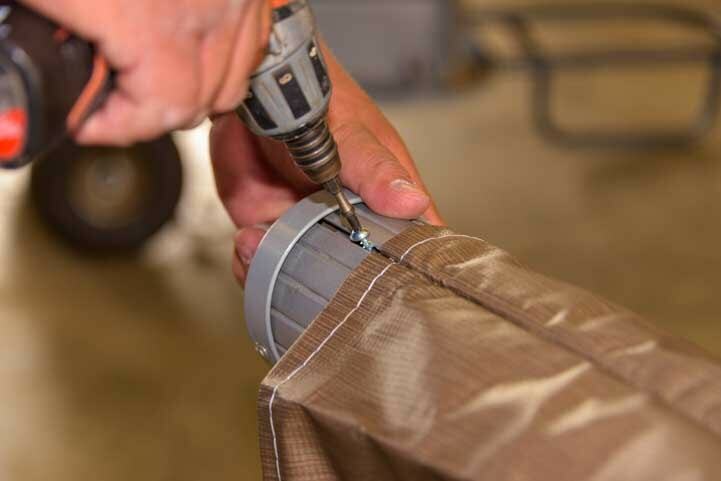 To access the air filters, unscrew the screw holding the access panel in place. There are two small air filters inside. Each one is a small piece of foam. If they’re dusty and dirty you can clean and re-oil them. 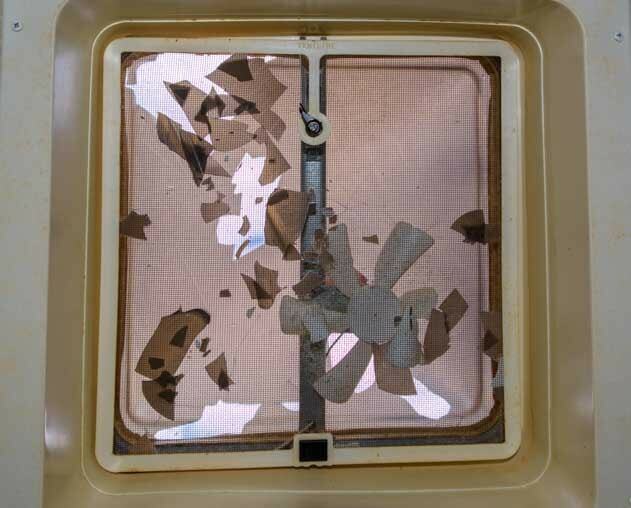 If they are brittle and have started to fall apart, you can replace them with Honda’s air filter replacement kit. Once the front panel on the generator is buttoned up again, this is a good time to check the spark plug. 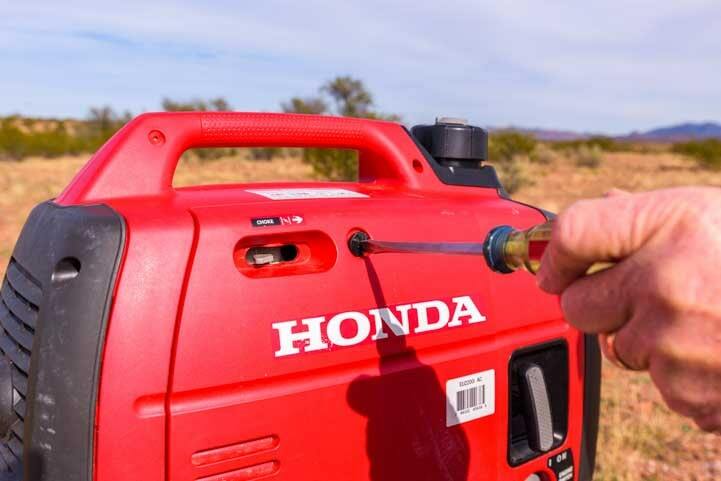 The Honda EU2200i generator’s spark plug is located in a small compartment on the top next to the handle. The cover slides off easily. Inside, the spark plug is covered by a spark plug cap. 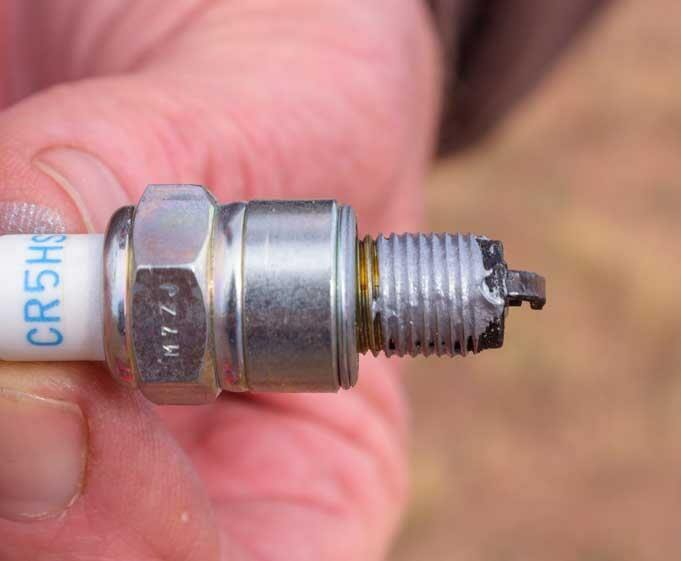 Simply pull the cap off to reveal the spark plug underneath. 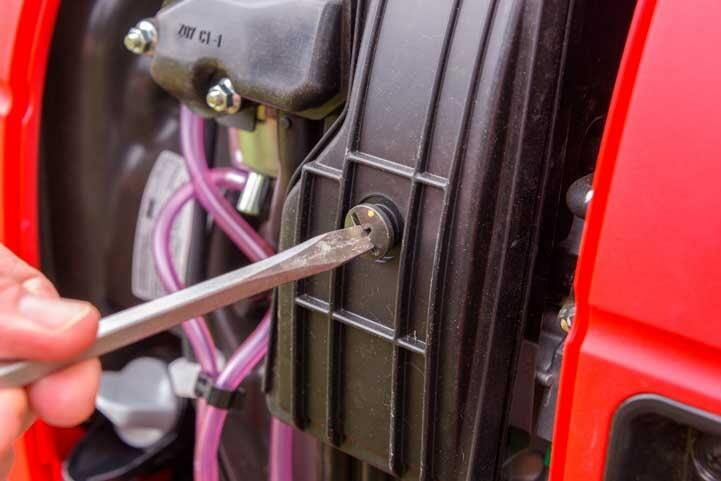 To remove the spark plub, use a 5/8″ spark plug socket and ratchet plus 3/8″ drive extension. 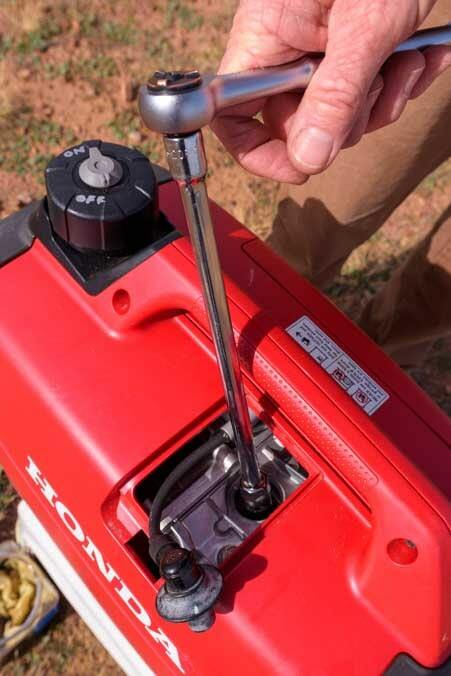 The spark plug is quite close to the generator handle, so a 5//8″ spark plug socket with an integral 3/8″ drive on a swivel extension could be very handy. 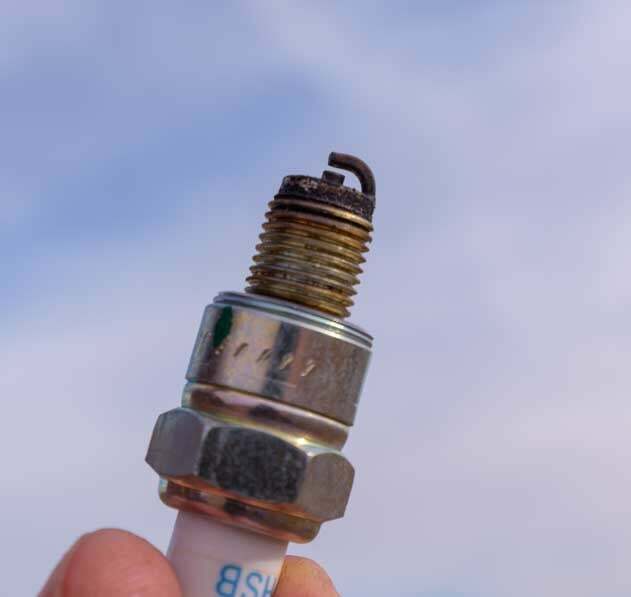 The spark plug is the NGK CR5HSB. 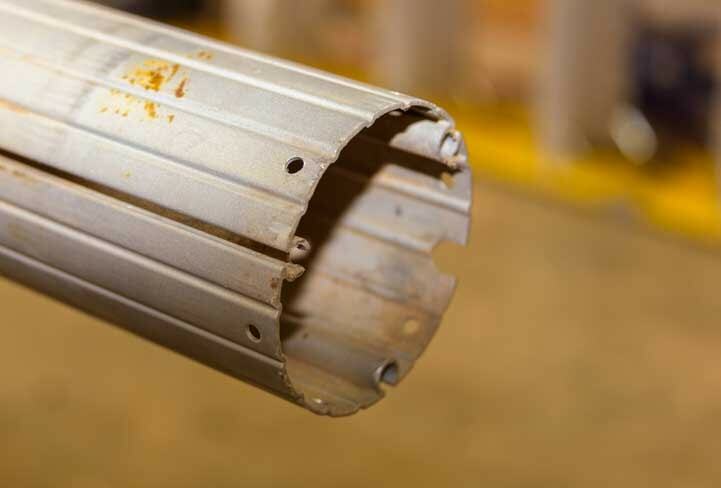 Inspect it with a spark plug gap tool. The gap should be 0.24 to 0.28 inches which is equivalent to 0.6 to 0.7 mm. 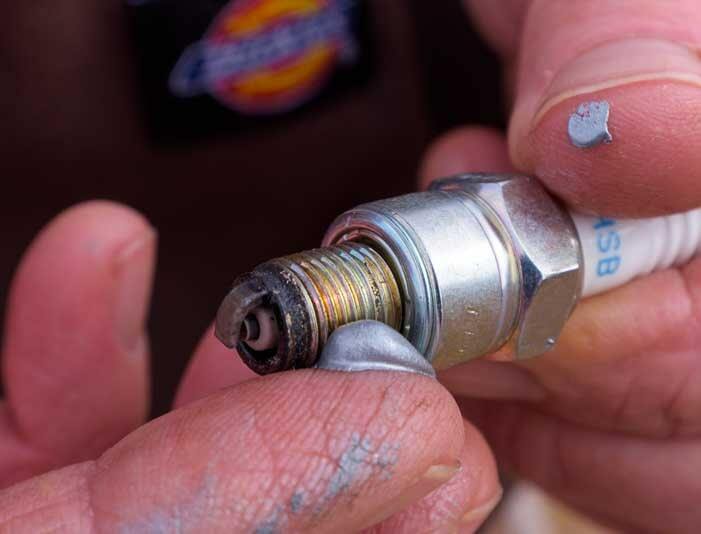 Before placing the spark plug back in the generator, spread a thin layer of high temperature anti-seize lubricant on the spark plug threads. 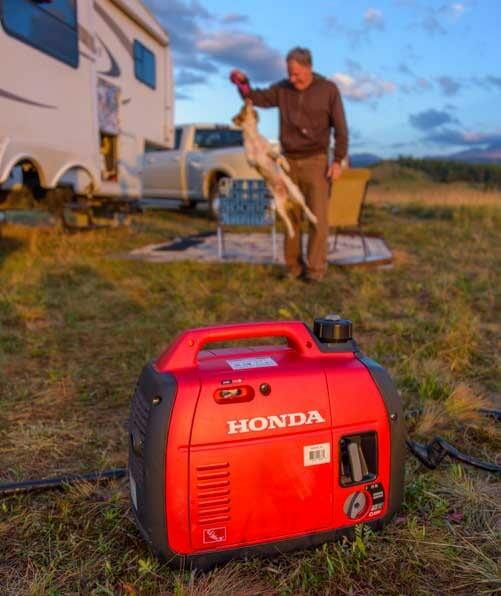 If you are looking for a lightweight generator that can run for many hours on end and power all of the appliances in your RV that require less than 2200 watts to operate (in our case, this is everything except our 15k BTU air conditioner), the new Honda EU2200i generator is a great choice. Hopefully if you buy one, you won’t inadvertently inspire the rain gods to dump weeks of rain on you like we did!! 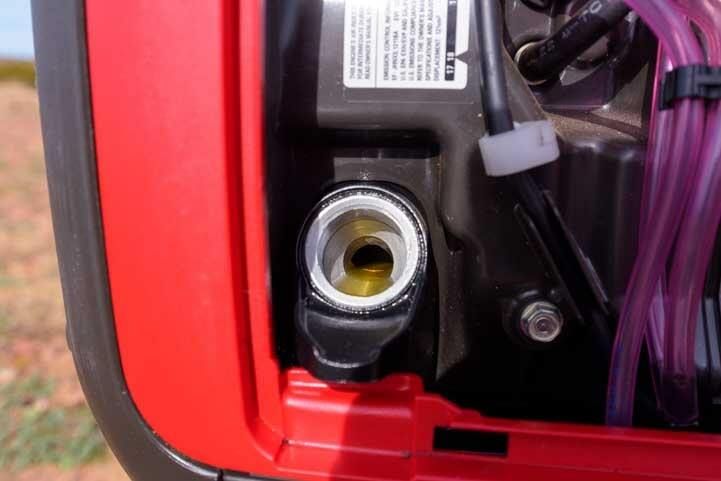 Note added March 24, 2019 – 200,000 Honda 2200i units have been recalled for a leak in the fuel valve. You can schedule a free repair at a Honda authorized dealer. There is more detailed info from Honda about the specific units affected at this link. Companion Parallel Combo Kit – 4400 watts of easy to maneuver power! 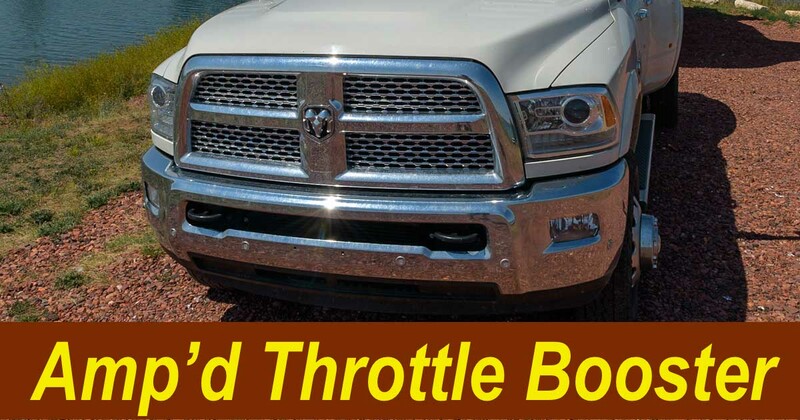 August 2018 – We absolutely love our 2016 Dodge Ram 3500 Dually truck, and we recently installed an Amp’d Throttle Booster on it. 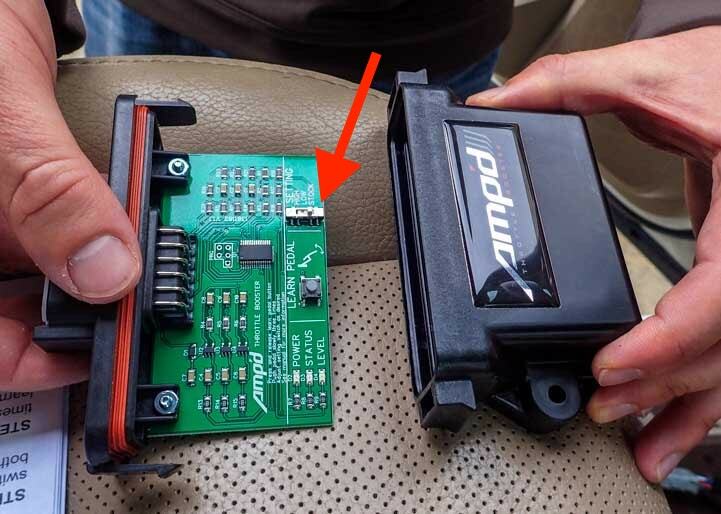 This small electronic unit decreases the occasional throttle lag you feel when you depress the accelerator pedal by increasing the throttle sensitivity and responsiveness. On older vehicles the accelerator was connected to the carburetor with a cable, providing a physical connection between the action of your foot depressing the accelerator and fuel flowing to the engine to make the vehicle go faster. On newer vehicles electronic signals do the job instead, and occasionally there is a slight lag between depressing the accelerator and fuel flowing to the engine. 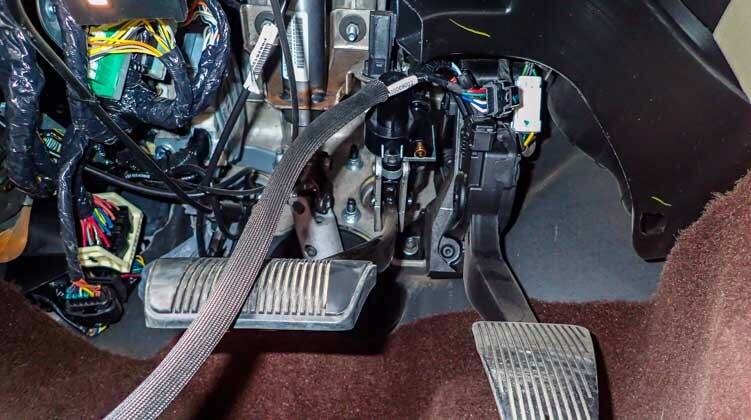 This is sometimes referred to as a “dead pedal” kind of sensation, and it can be a little frustrating to hit the gas and not have the vehicle jump in response right away. 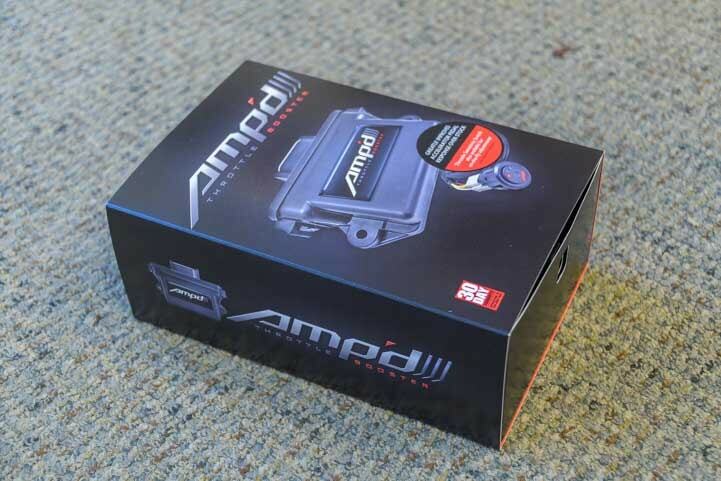 The Amp’d Throttle Booster allows you to increase the throttle sensitivity by slightly raising the voltage. There are three sensitivity settings along with a Stock setting that doesn’t increase the voltage at all. 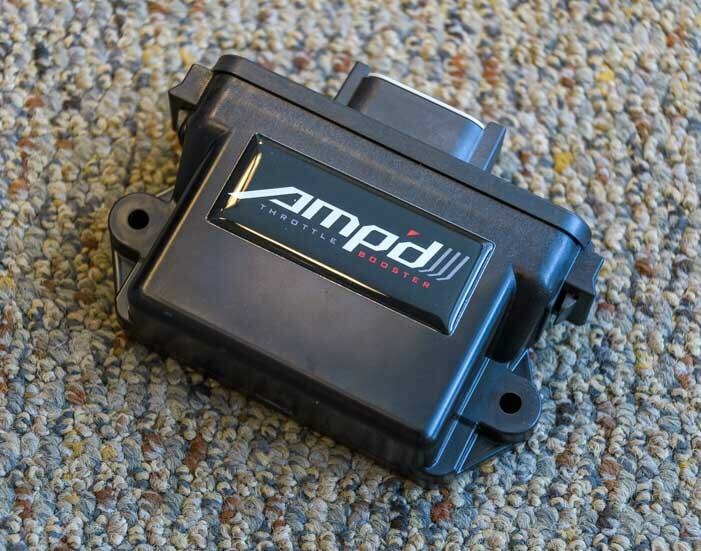 The Amp’d Throttle Booster is a small product that comes in two parts: the booster unit itself and a wiring harness. One end that connects to a selector switch that gets mounted on the dashboard (labeled “A” in the photo). 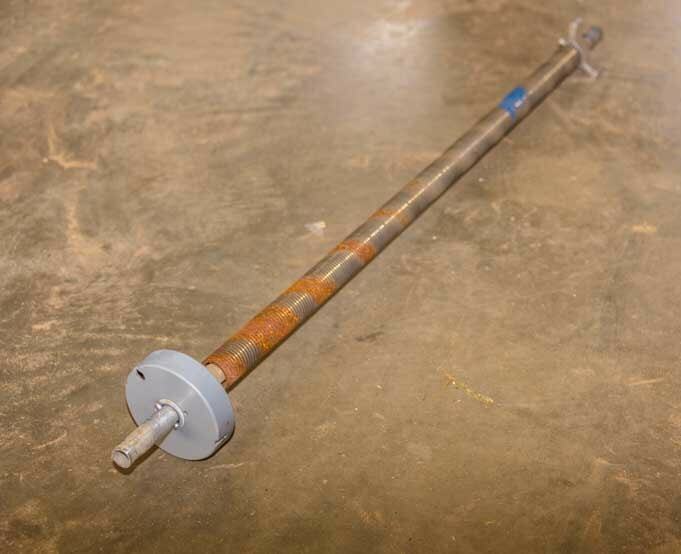 One end that connects to the booster (“B”). One end that has a Y connection that connects to two points under the dashboard (“C”). 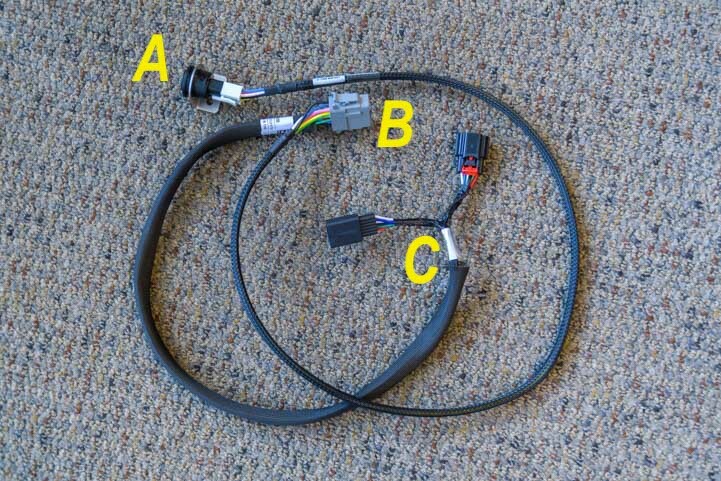 The wiring harness has three ends. C = Both connectors connect under the dashboard. The installation took 17 minutes, but allow a little bit more for reading the manual, etc! 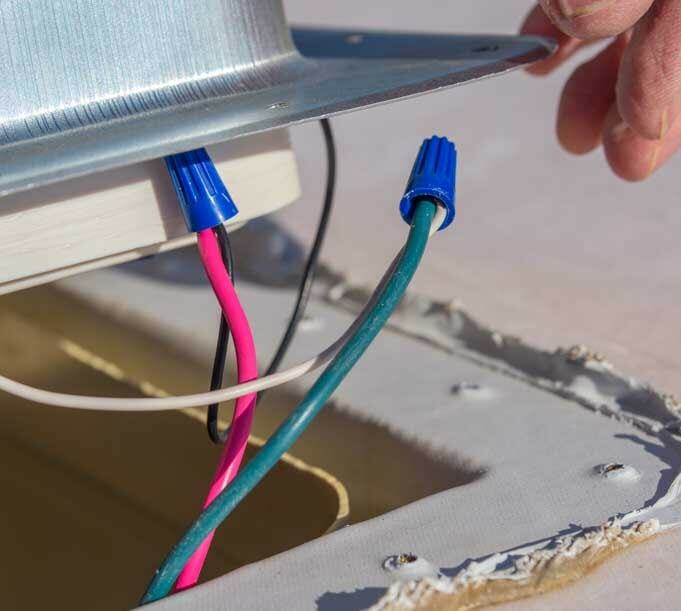 The first step was to connect the pair of connectors at the Y end of the wiring harness to the corresponding connectors under the dashboard. These two connectors are keyed, so you can’t connect them backwards or accidentally plug them into the wrong spots. 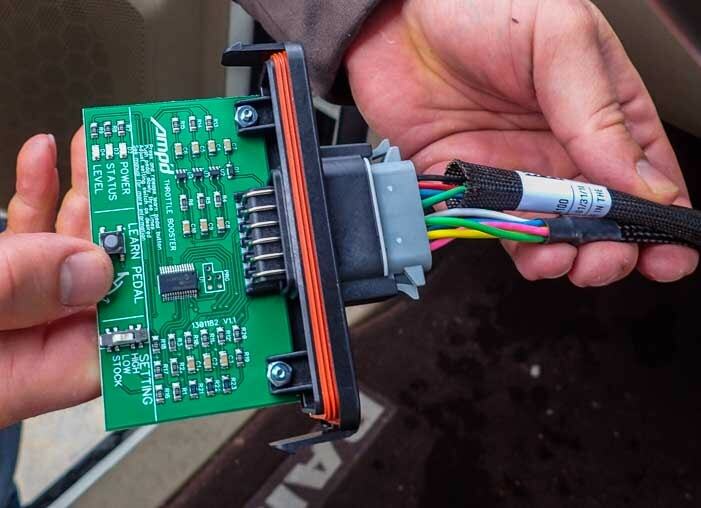 Working under the dashboard was a tight fit, so I have a link to the Amp’d Throttle Booster manual at the end of this article to give you the nitty gritty about each connector and where it is positioned under the dashboard both for the Ram trucks and for other brands and model years. First connect one of the two ends of the Y on the wiring harness to the corresponding connector under the dashboard. Connect the second of the two connectors at the Y end of the wiring harness under the dashboard. Both connectors are in place (only one is visible). 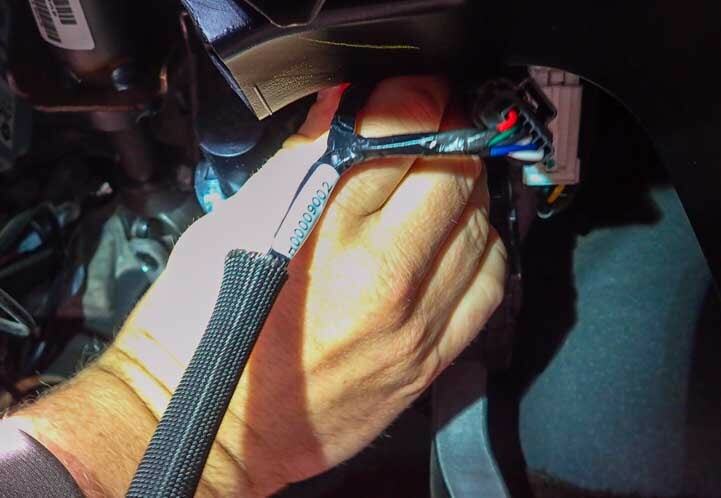 It’s tight under there but the connectors are keyed to make it easier. We got the kit that includes the dashboard mounted selector switch. If you don’t buy this external switch there is a switch right on the circuit board inside the Amp’d Throttle Booster unit that has two sensitivity settings, Low and High. 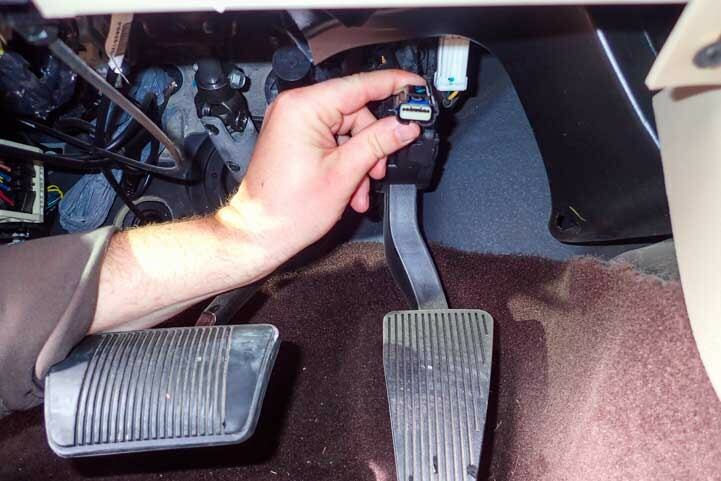 Regardless of whether you get the dashboard mounted selector switch or rely on the circuit board switch instead, the next step is to set up the Amp’d Throttle Booster so it can learn the throttle response of your truck’s accelerator. To begin this learning sequence (and to access the circuit board’s selector switch), simply unscrew the outer casing. Access the Amp’d Throttle Booster circuit board and go through the Learn sequence by removing the outer casing. The red arrow shows the location of the circuit board selector switch. It is set to Stock (Off). Then attach the wiring assembly to the connector on the Amp’d Throttle Booster unit and follow the sequence of steps given in the manual to enable the throttle booster to learn the throttle response of the truck’s accelerator (this involves depressing the accelerator pedal a few times and monitoring some LED flashing lights on the circuit board). Plug the wiring harness into the connector on the Amp’d Throttle Booster unit. Then mount the selector switch on the dashboard. One handy location is on the plastic tab at the bottom of the dashboard that holds the dashboard in place. 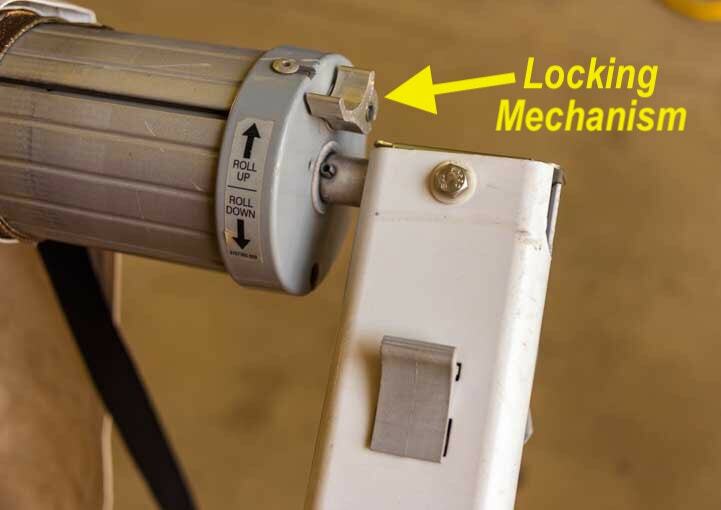 Simply remove the existing screw, position the mounting bracket and screw it back in. Mount the selector switch on the dashboard and tidy up the wiring harness with tie wraps before tucking it under the dashboard. 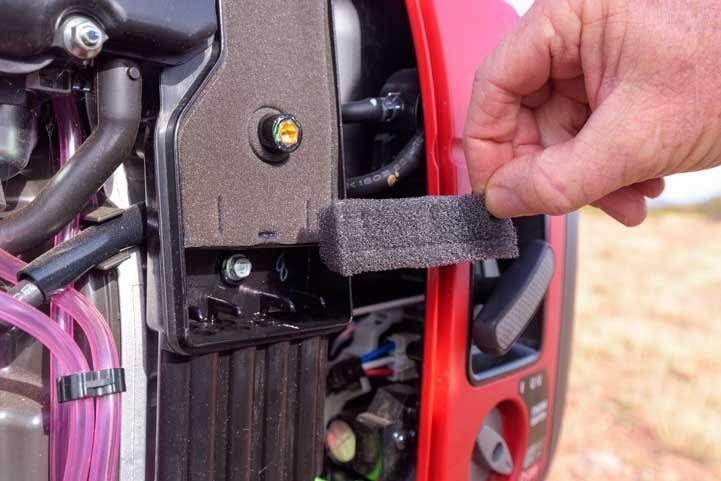 Once it’s mounted, tuck the harness assembly and the Amp’d Throttle Booster unit up under the dashboard and secure them in place with zip-ties. Finished. The selector switch is easy for the driver to reach. 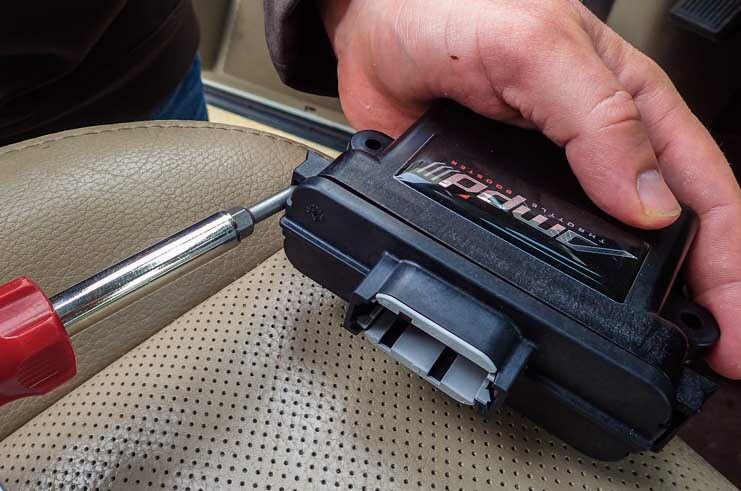 After the installation of the Amp’d Throttle Booster, Mark tested it with the truck in Park. He put the selector switch to Stock (Off) and revved the engine. The he did the same thing at each of the three settings: Low (50% sensitivity increase), Medium (75% increase) and High (100% increase). At each increased setting the engine responded faster to his foot depressing the accelerator pedal — as expected. 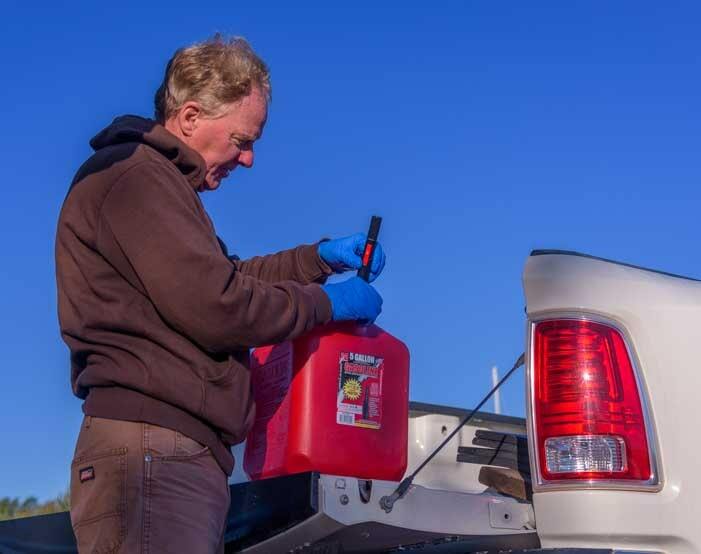 Mark has been driving with the Amp’d Throttle Booster installed on the truck for the last 5,000 miles, and he’s found he likes it best at the High setting (100% increase) which is where he keeps it set all the time. He finds he notices the improvement a lot when passing people and also when driving in the mountains as well as when he’s in stop-and-go traffic. Without the booster he sometimes finds that on a steep incline or when “gassing it” for whatever reason, he’ll depress the accelerator and then have a moment or two of no response from the engine before it kicks in. With the booster on High, the truck reacts and accelerates much more quickly. We also have an Edge Juice with Attitude engine tuner on the truck, and Mark finds that the two work together well. He puts the engine tuner in Level 2 (Towing) and leaves it there most of the time. This improves the engine’s power when it’s towing our trailer. Whenever we’re going to be driving the truck without the trailer attached for a long drive or for a few days of in-town driving, then he puts the tuner in Level 1 (Economy). This improves the fuel economy significantly. Our truck has about 35,000 miles on it now, and we’ve owned it for two and a half years . For anyone wondering how many miles they might drive in the full-time RV lifestyle, there you have it — we’ve averaged 14,000 miles a year since January 2016, about half of that towing our trailer and half of that driving without our trailer hitched up. 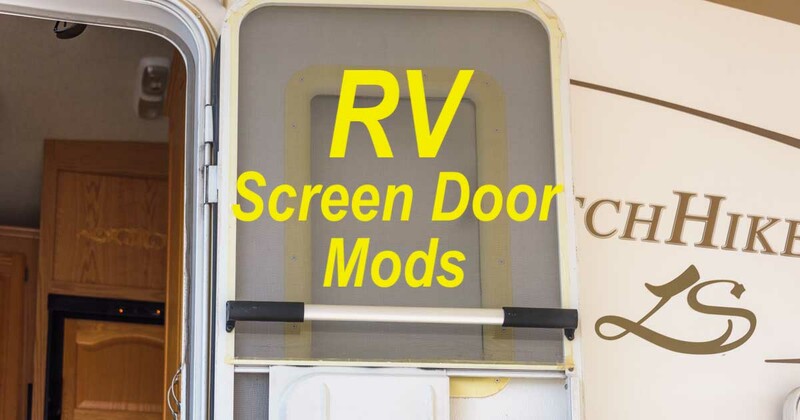 We have recently made two upgrades to our RV screen door. 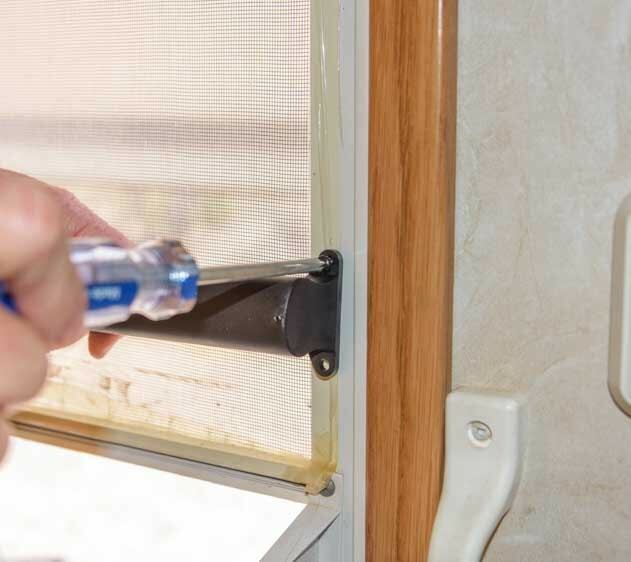 Combined with our annual screen door shrink-wrapping project (explained here), that makes for three easy DIY RV screen door modifications we’ve done. Who knew you could do so much to a silly screen door?? 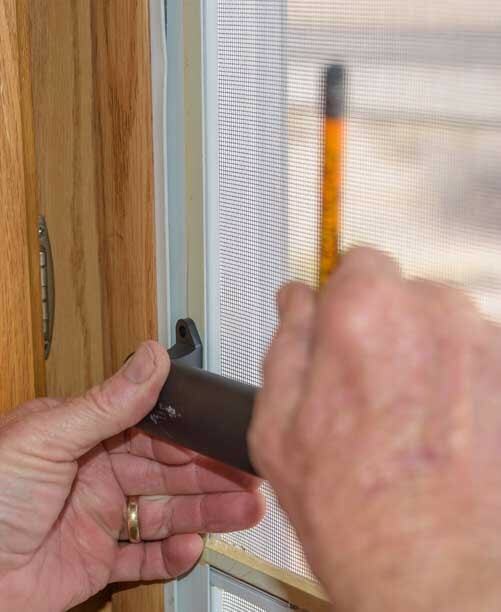 Although we’ve been in and out of our RV door countless thousands of times over the last decade of traveling full-time, we had never installed one of those handy grab handles that crosses the door’s mid-section. Until this week! 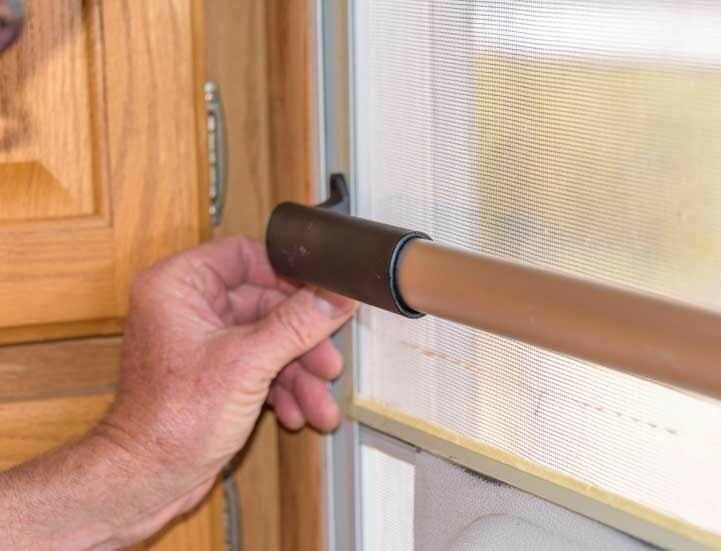 Grabbing the screen door when it’s being whipped out of your hands by the wind is nearly impossible without one of these grab bars, and when we saw one of these handles on a friend’s fifth wheel trailer, we just had to have one. 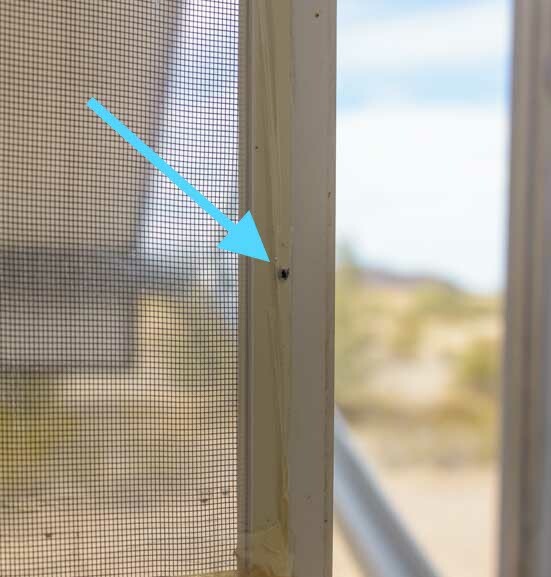 First, after holding the handle up to the door at various heights to decide where to mount it, he drilled a hole in the RV screen door frame and then screwed one end of the handle into the door frame. 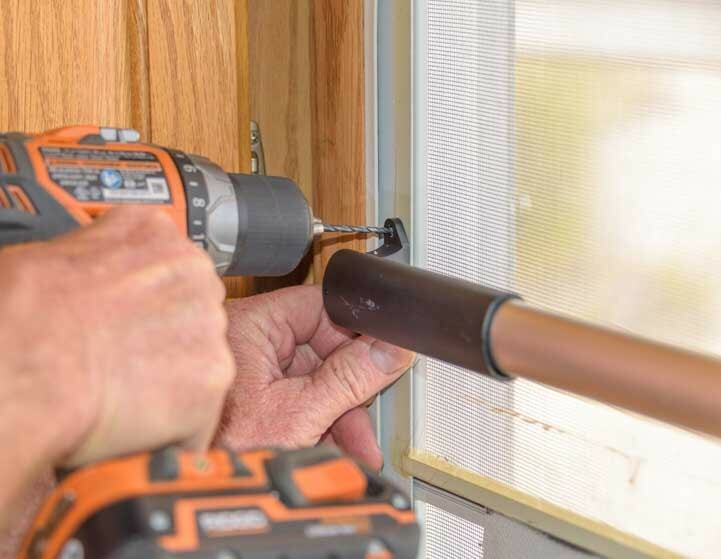 Drill a hole in the door frame to hold the handle in place. 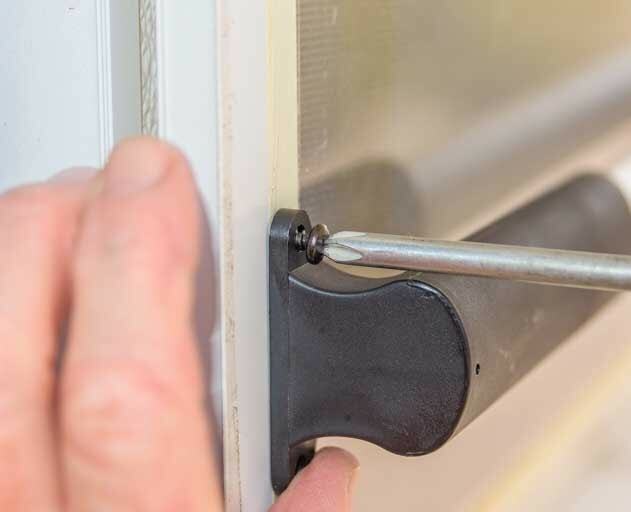 Screw the handle to the door with just one screw at first. Then he held the handle in place on the other side of the door frame and put a level on it to ensure it was level. Then he used a fine pointed Sharpie pen to mark the location on the door where the handle would be screwed in. Position the other end of the handle so it is level and mark the door frame where the hole must be drilled. 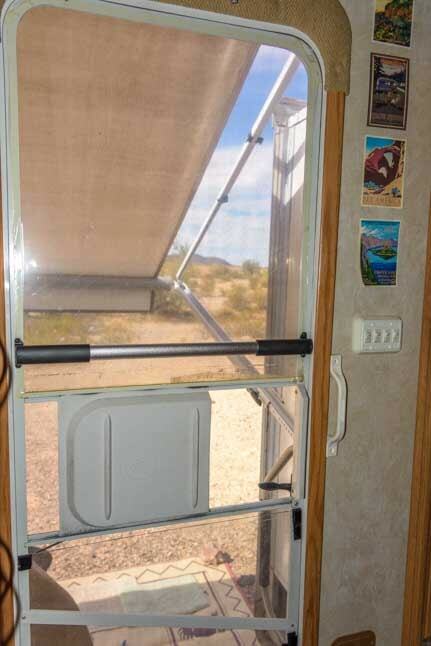 The grab handle expands and contracts to fit the width of various RV screen doors, so he adjusted both ends of it to get it to the proper width and also have an equal amount of the aluminum center part extending into the two plastic ends (rather than having it shoved far into one plastic end and barely dangling in the other). 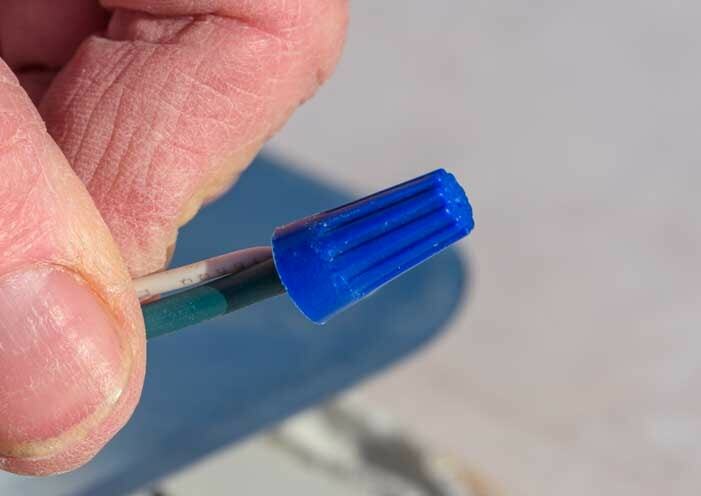 Once he had it positioned correctly, he marked the aluminum center part with a pencil mark at each end where the plastic ends would be permanently screwed in. 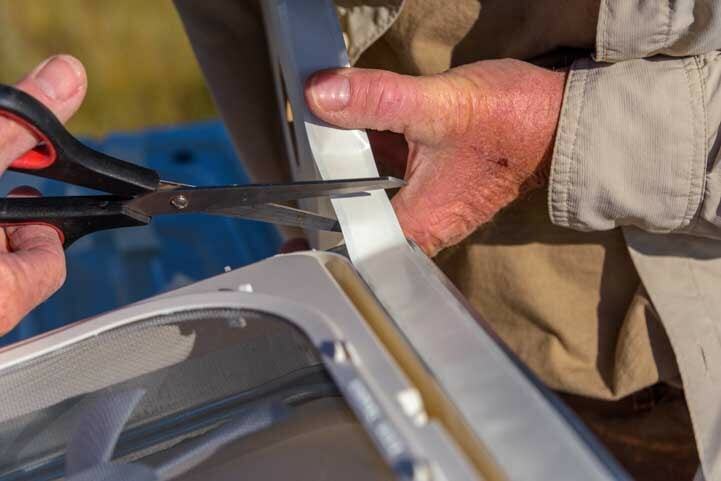 Expand the handle and center the aluminum centerpiece between the ends. Then mark the aluminum with a pencil. 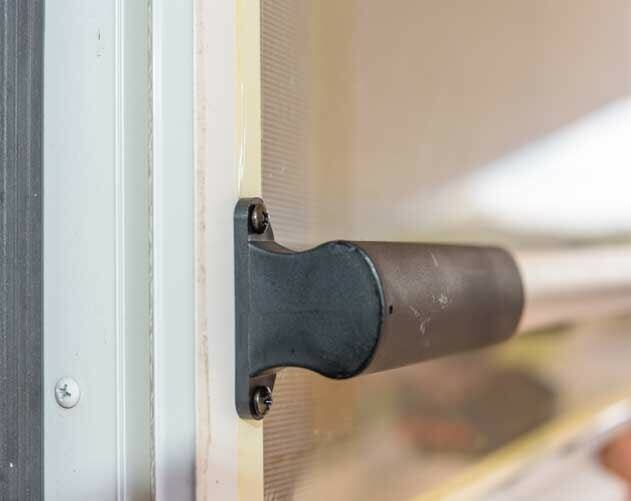 The handle can be extended and retracted, so this step centers the aluminum between the ends and marks where the ends should be permanently positioned. 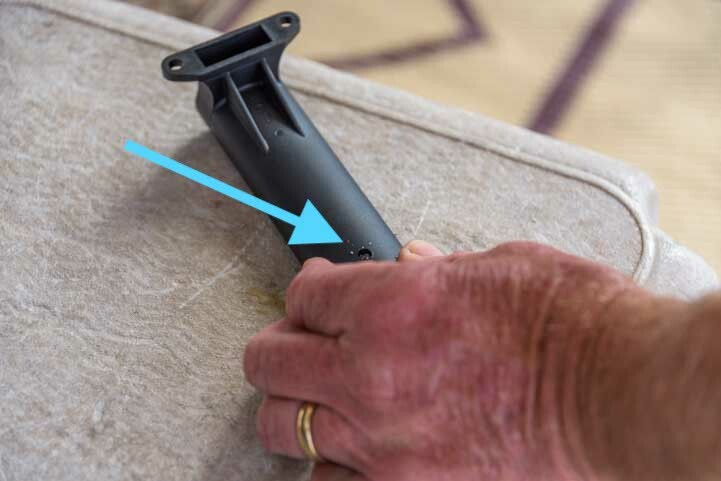 Then he unscrewed the one screw that was holding the handle to the door frame and removed the handle from the frame so he could screw in the two handle ends. On the back of each plastic end of the handle there is a pre-drilled hole so the plastic ends can be screwed to the aluminum center piece. On the back of the handle each plastic end has a hole in it. 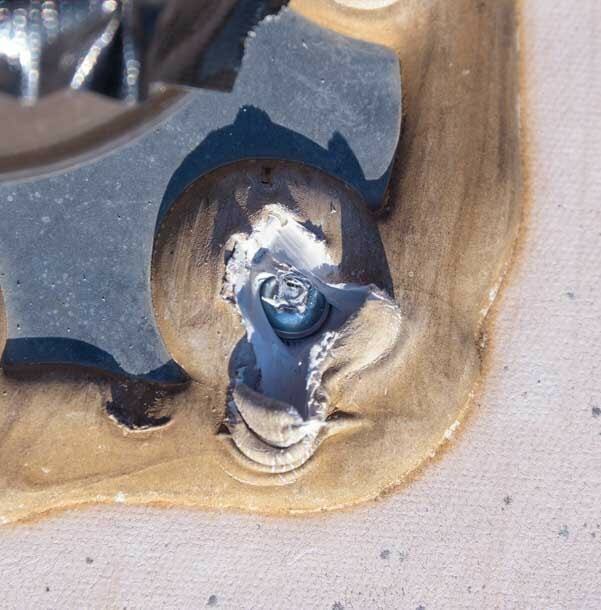 With the aluminum piece in the proper position according to the pencil marks he had made, he drilled a hole in the aluminum and then screwed the plastic end piece on. He did this at each end. Now the handle was fixed at the proper length to span the width of our door. 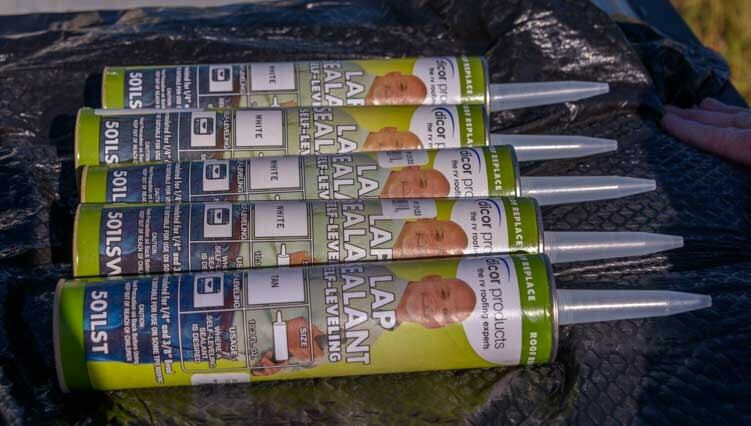 Drill the aluminum strip so the end cap can be screwed into it permanently. Next, he drilled a hole in the door frame where he had made the mark with the fine pointed Sharpie. Drill the hole in the frame where you put the Sharpie mark. Then he screwed the handle to the door frame and then repeated the process for the lower hole on each side. Screw the handle onto the door frame. There are upper and lower holes in each endcap. We’re really happy with this new grab handle. 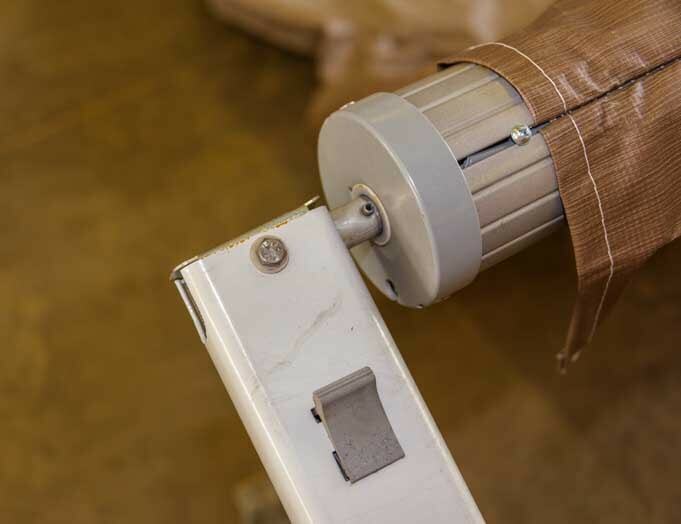 It strengthens the flimsy door a bit and is great to grab onto when opening and closing the door! 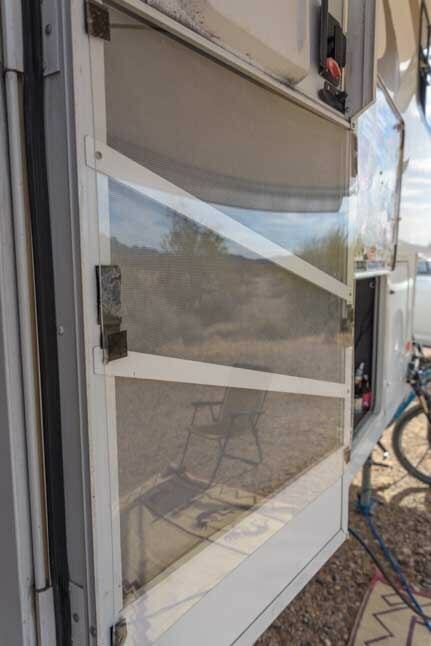 The other mini-project we did recently on our RV screen door was to replace the lower shrink-wrap film with a sheet of 1/8″ plexiglass. We recently acquired an adorable puppy, and all it took was one swipe of his paw at the door to rip the shrink-wrap film we’d had on there for months. 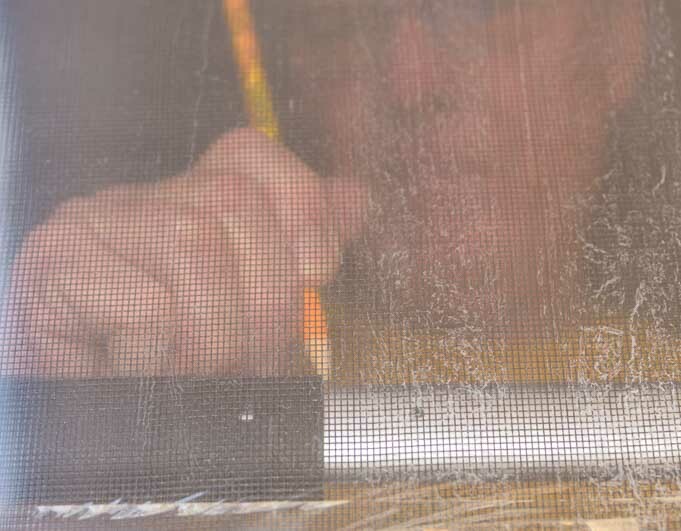 So Mark got a big sheet of 1/8″ clear plexiglass and cut it to fit the screen door. Of course, Buddy insisted on supervising this project. Mark used a straight edge and a utility razor blade to score the plexiglass. Then he bent it along the edge of a table to snap it. 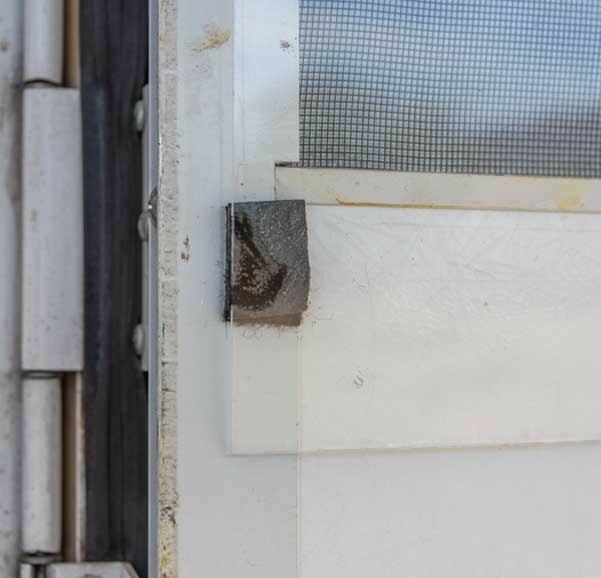 Then he took short strips of industrial strength velcro tape and placed the hooked half on the plexiglass and the matching fuzzy half on the door frame so the hooks wouldn’t grab things as we go in and out of the door when we remove the plexiglass later. The lower half of the door has a clear plexiglass sheet mounted on the frame with velcro. You can see our patio reflected in it. Hey, where’s the Supervisor?! Cut short strips of velcro and put the matching halves on the plexiglass and door frame. 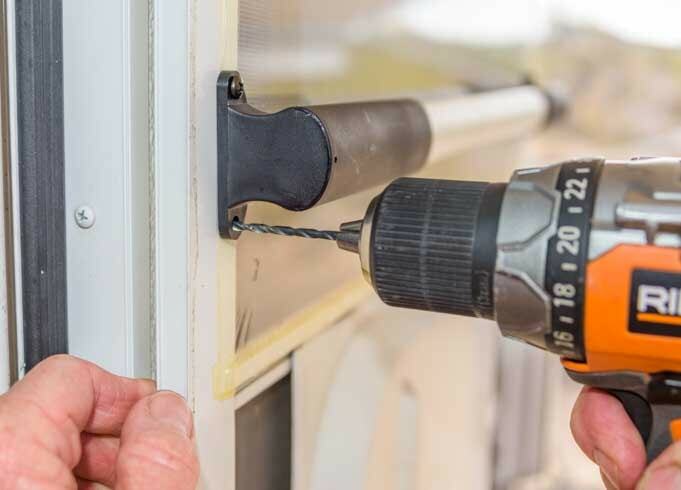 The beauty of using velcro to mount the plexiglass on the door frame is that once the warm weather of summer rolls around we can remove it and let the cool breezes flow through the door. Or, perhaps we’ll just leave it up in case Buddy decides to paw at the screen. 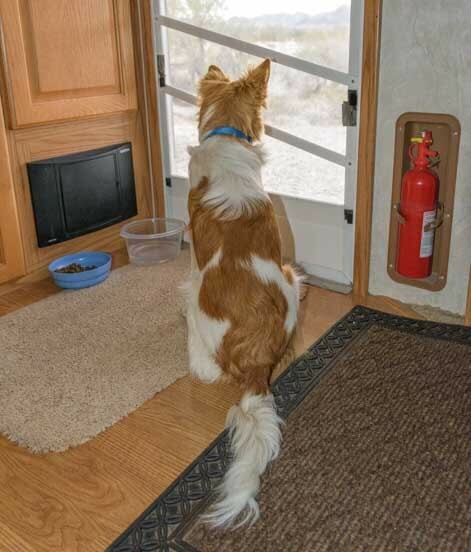 We can remove the shrink-wrap from the upper half of the door and enjoy the cool breezes up there and leave the plexiglass on the bottom to protect the screen from the mighty Watch Dog. Ta Da! Our original shrink-wrap is still on the top half, the nifty grab handle is in the middle and the puppy-proof plexiglass is on the bottom half. When the project was finished the Supervisor reappeared. Buddy loves his new plexiglass window in the door! 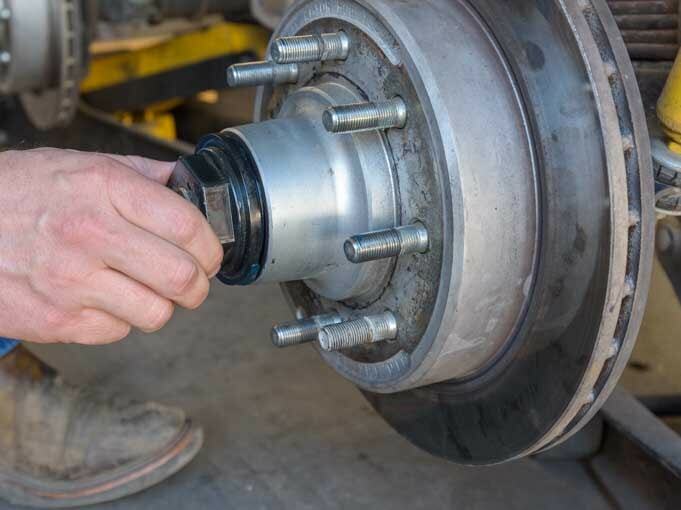 Repacking the wheel bearings is an important annual maintenance task for a fifth wheel trailer, especially one that is lived in full-time like ours. 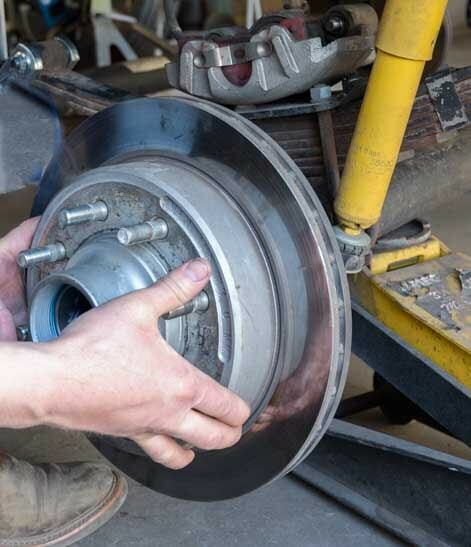 This is also a good time to inspect the bearings and brakes. The first step is to jack up the trailer and remove the wheels. 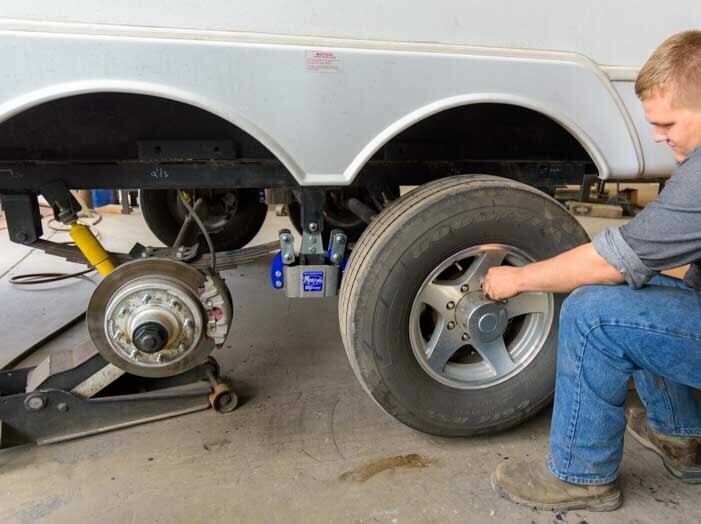 After jacking up the trailer, remove the wheels. 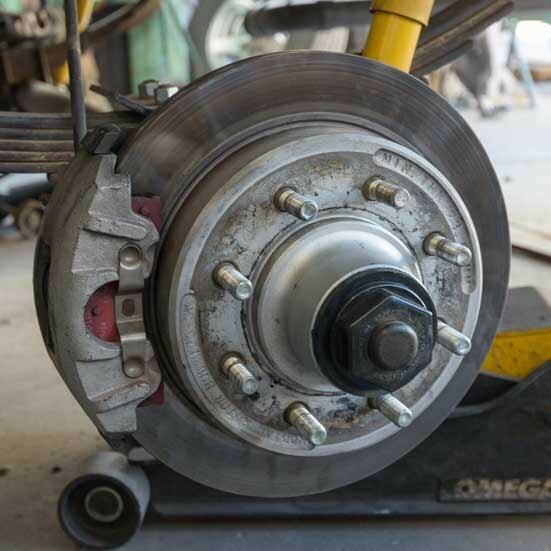 A few years ago we did a disk brake conversion on our fifth wheel trailer, upgrading from the factory installed electric drum brakes to electric over hydraulic disk brakes (you can read the details about what was involved in doing this phenomenal and highly recommended upgrade here). 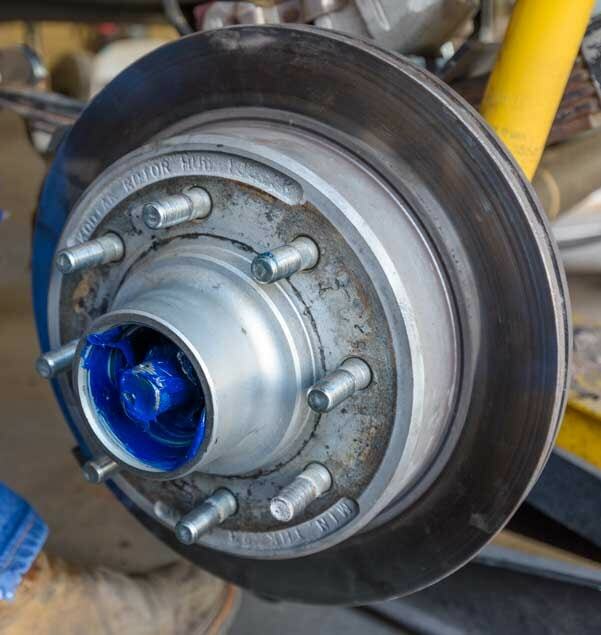 So, behind each of our wheels is the disk brake rotor and brake caliper. 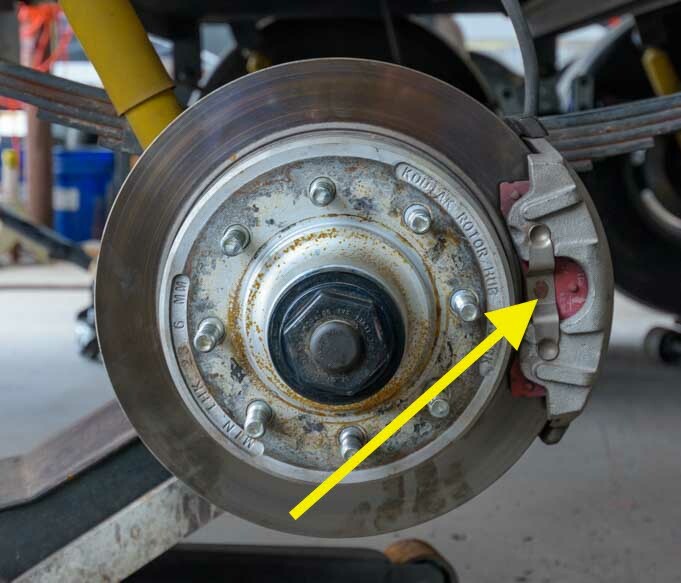 Inspect the rotor and disc brake pads. 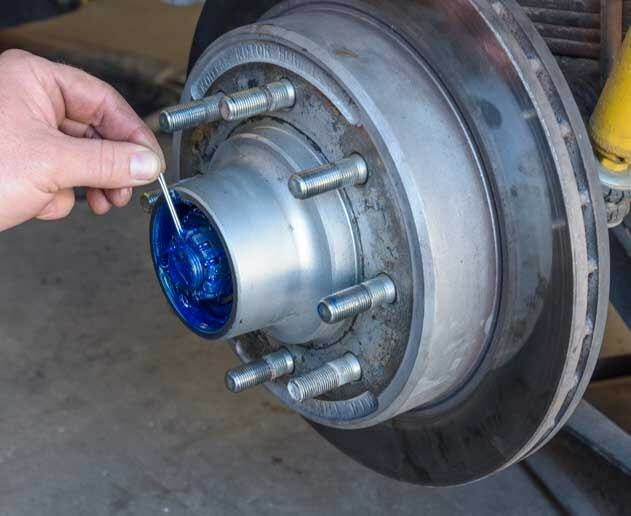 The first step for repacking the wheel bearings was to remove the brake caliper and inspect the brake pads and check out the braking surface on the rotor. All looked good. 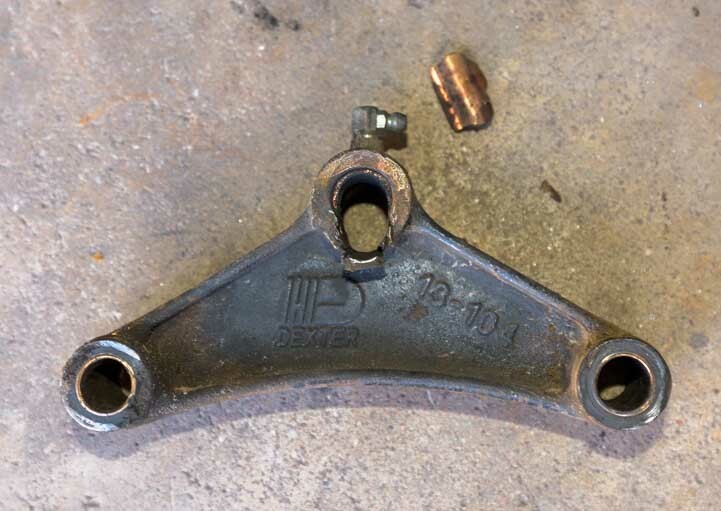 Then the brake caliper was moved out of the way. Next, the grease cap and cotter pin were removed. Then the castle nut holding the bearings and the disk rotor in place was unscrewed. Gently pulling the rotor out about an inch and then pushing it back in released the outer bearing so it could be removed. Then the rotor was pulled off the axle spindle which revealed the inner bearing, allowing it to be slid off the axle spindle. 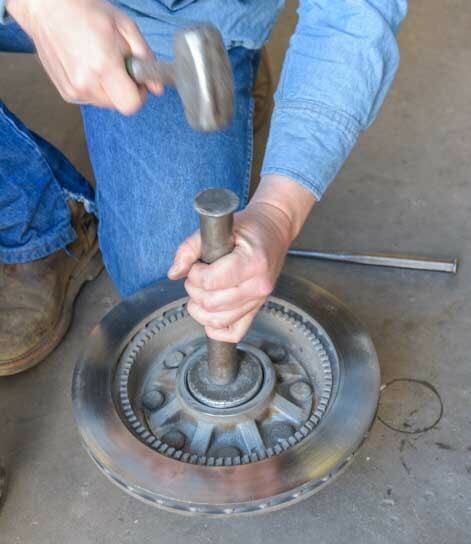 Remove the cotter pin and castle nut, then the inner and outer wheel bearings and then pull the rotor off the axle spindle. The axle spindle is full of grease. 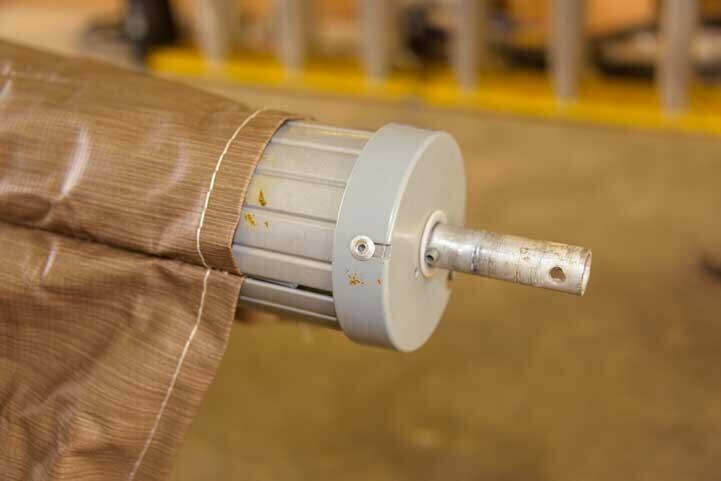 Using shop towels, the grease was wiped off the axle spindle. 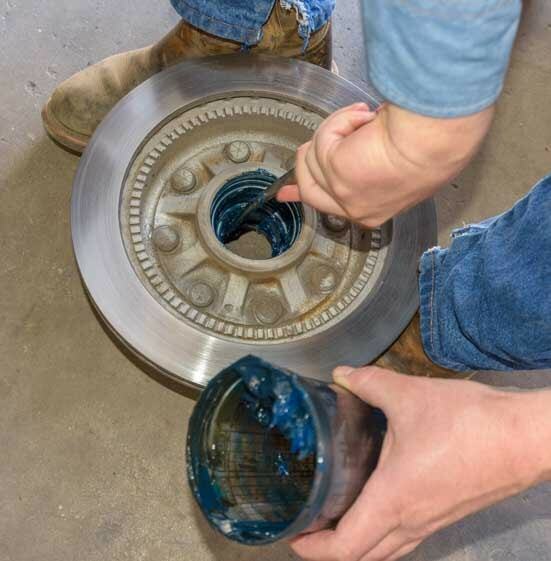 Wipe the old grease off the axle spindle. 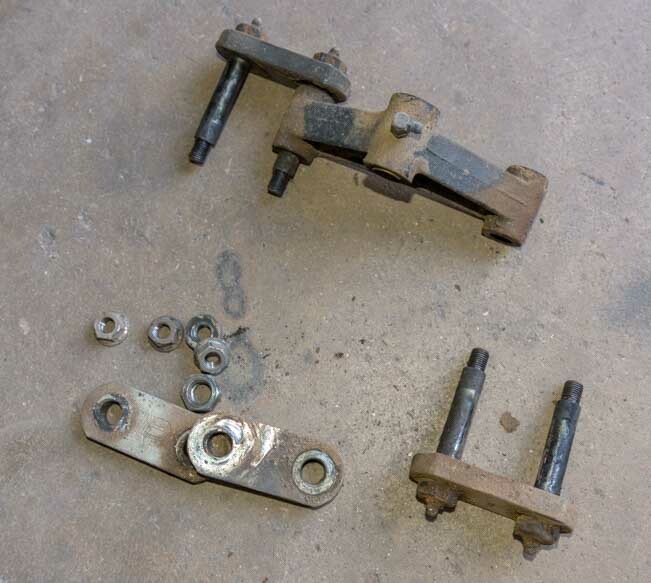 The inner and outer bearings, D-shaped spindle washer, castle nut and grease cap were then wiped clean of grease. 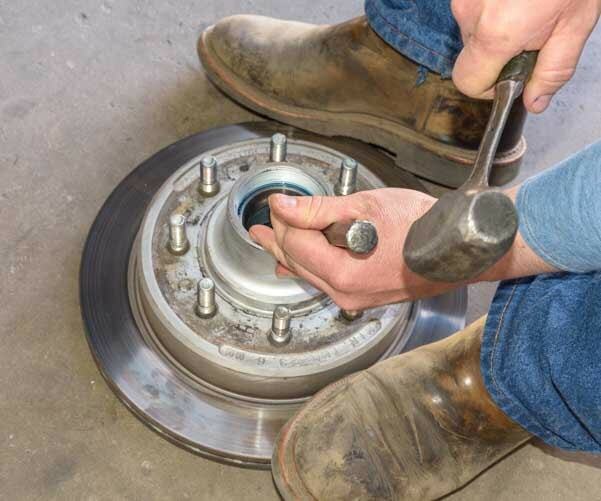 Wipe off and inspect the outer and inner bearings, the D-shaped spindle washer, the castle nut and the grease cap. It turned out that one of our wheel bearings was slightly scored, showing early signs of wear. We decided to replace it. 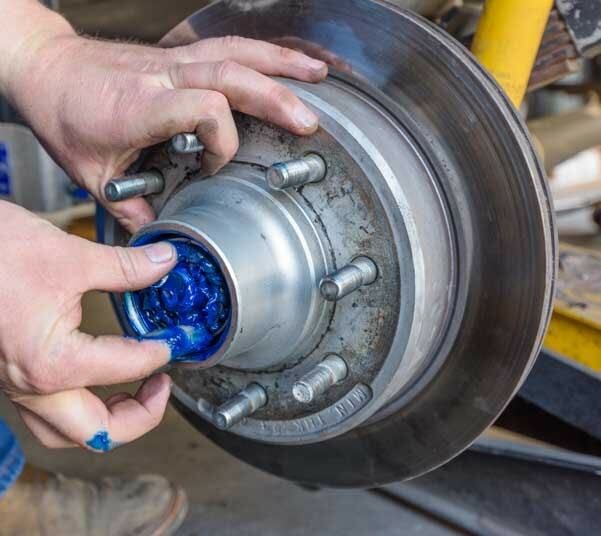 Wheel bearings come in a bearing and race assembly, so the race would be replaced too. 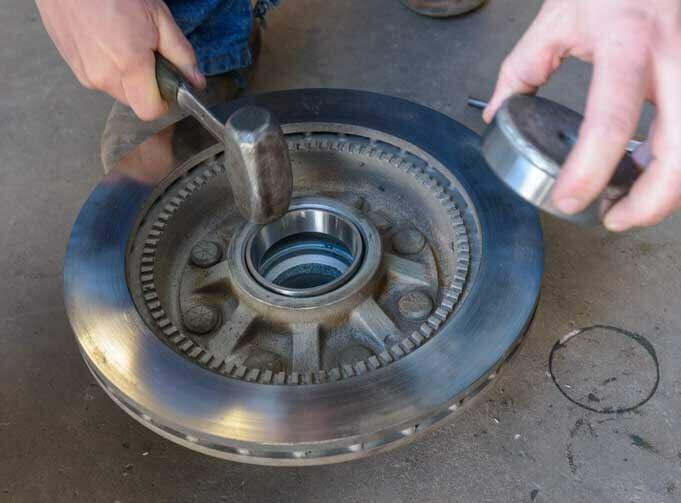 Finding worn parts before they become a problem is one of the reasons that greasing the wheel bearings is an important annual task. 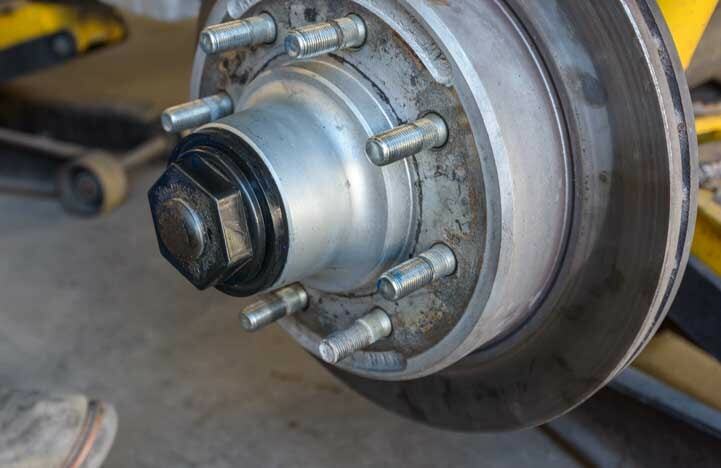 Even if a trailer has EZ-Lube bearings, it is still important to remove the bearings periodically to inspect them so they can be replaced before they fail on the road. 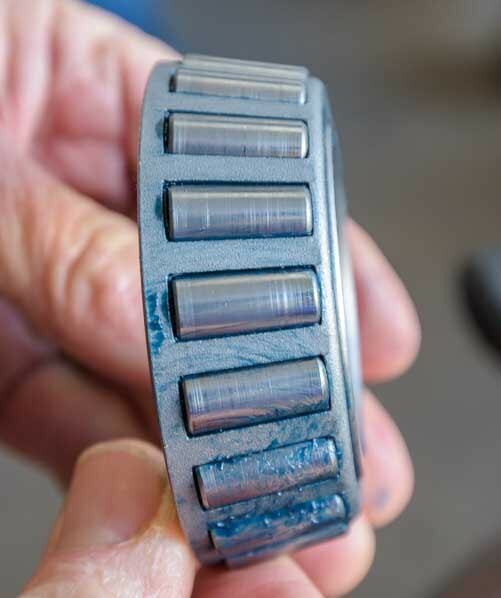 One of our wheel bearings showed signs of wear — light scoring marks on each bearing. 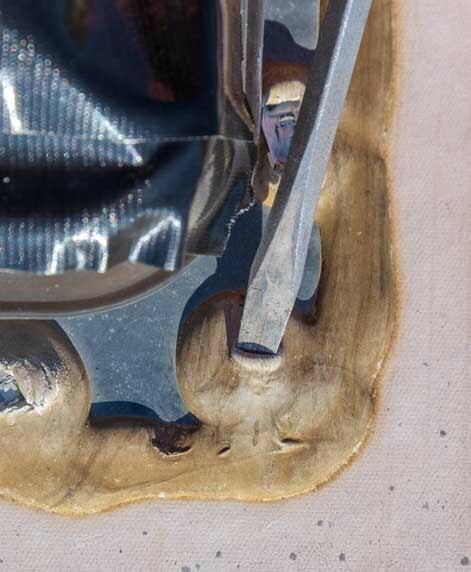 First, the grease needed to be removed from the inside of the hub. It was scraped out and then wiped out with a shop towel. 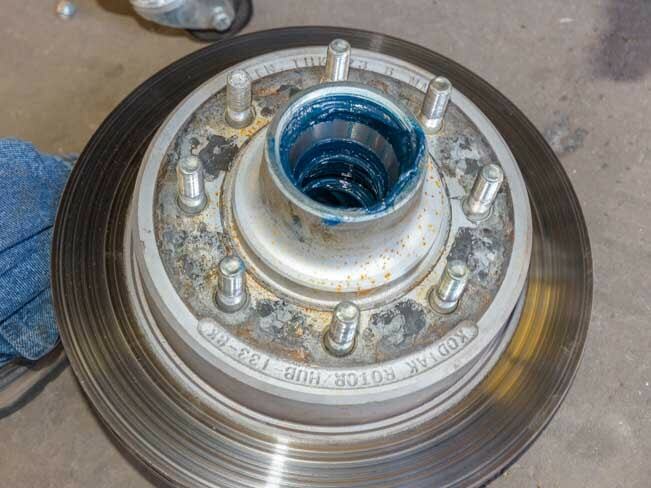 Remove the old grease from the rotor. 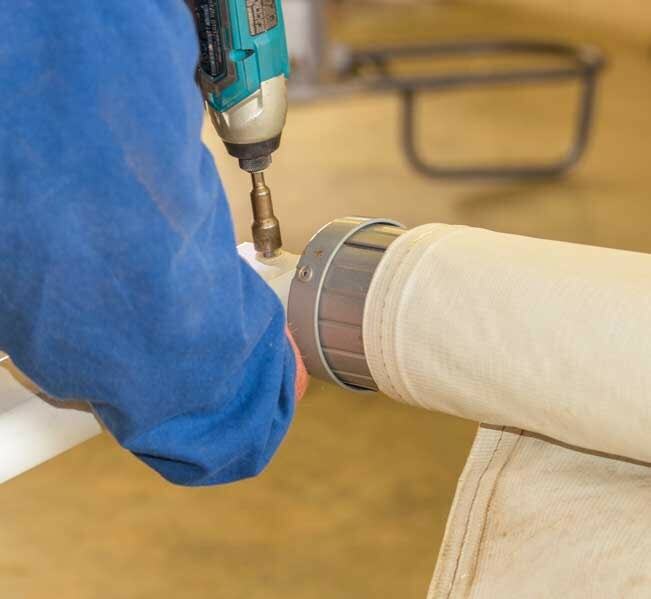 After scraping the grease out, wipe the area down with a shop cloth. Then the old race was knocked out and the new race was set in place. Knock out the old bearing race. Set the new race in place. The race was lightly tapped in place to make sure it was square. Then, using a race setter, the race was tapped securely into place. Tap in the new race. Next, the rotor with the greased inner bearing was mounted back on the spindle. Place the rotor back on the axle spindle. Newly greased bearings and spindle. Then the castle nut was screwed on and hand-tightened. A new cotter pin was put in place and bent over to hold everything securely. Put a new cotter pin in place and bend it over. Then the grease cap was screwed back on. Screw in the grease cap. Presto. Three more wheels to go! 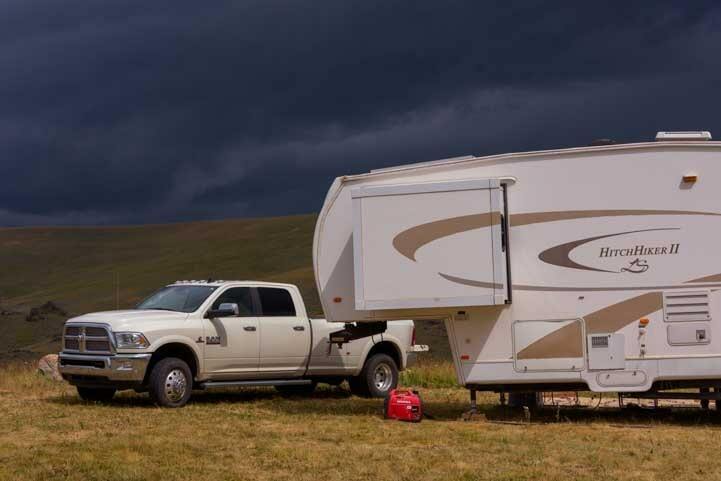 What features are most important in a fifth wheel trailer you’ll be living in full-time? 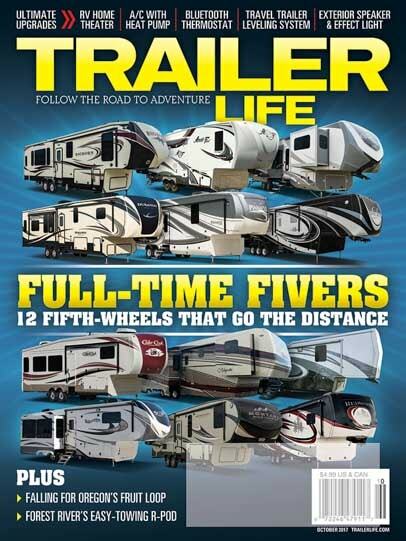 That’s a big and interesting question, and Trailer Life Magazine recently assigned me the very fun task of surveying the fifth wheels on the market today and selecting twelve models that would make a good home on the road. The results of my review are featured as the cover story of the October 2017 edition of Trailer Life Magazine. But you’ve also gotta look at the nuts and bolts underneath the rig, and that’s what this blog post is about. 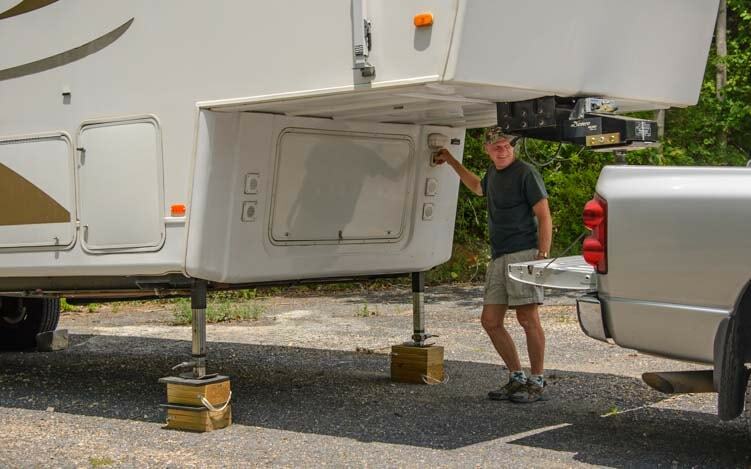 Whatever fifth wheel you buy, there is no need to break the bank. 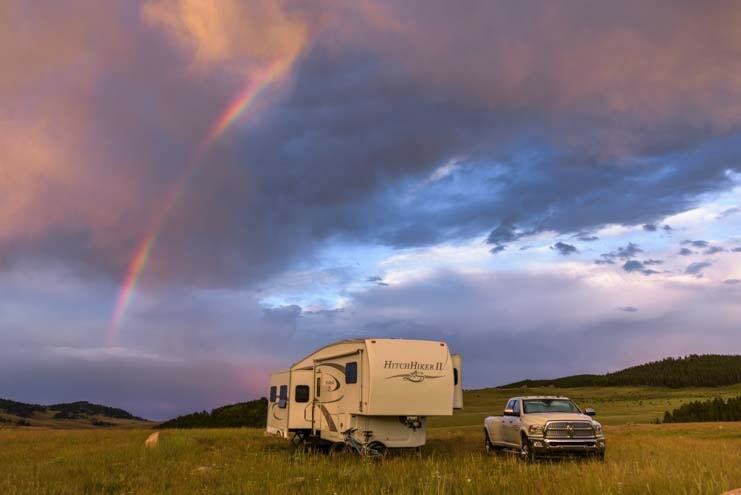 Obviously, higher quality trailers cost a lot more than lower quality trailers do, but life on the road is a thrill no matter what kind of rig you live in, and if you can’t afford the top of the line, you’ll still have just as much fun as those who can. Also, sometimes going with a used trailer, especially at the outset, beats buying new. 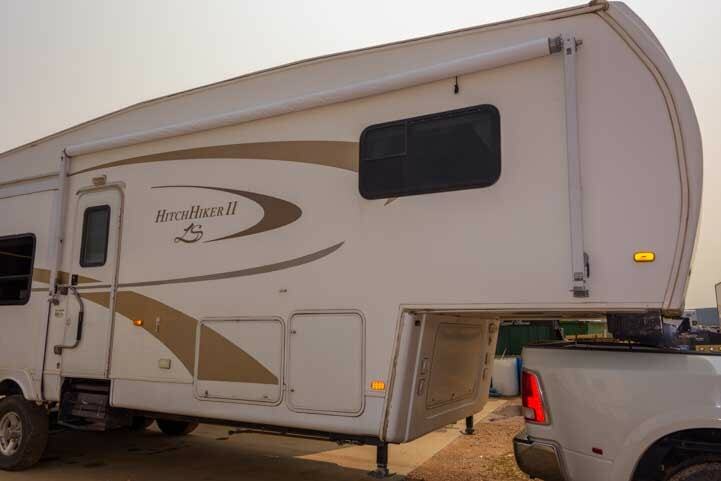 There are lots of used fifth wheels of all ages for sale all over the country. We have met a couple and a single fellow living full-time in older fifth wheel trailers that cost them less than $5,000. They were very happy with their rolling homes and were thrilled to have the freedom of a life on the road. Likewise, we met a couple who had lived in a popup tent trailer for four years, a couple who had lived in a tiny half-ton pickup camper for two years and we met a young pair of mountain bikers who had just moved out of their tent home of the last 18 months and into a 17′ travel trailer a few weeks before we camped near them. If you can’t afford the latest and greatest, it is still very possible to be a full-time RVer and live a champagne lifestyle on a beer budget! 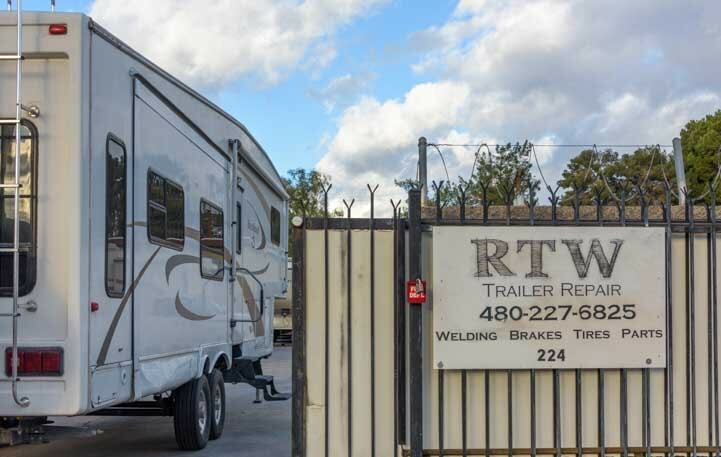 However, my Trailer Life assignment was to look over the many brand new fifth wheels on the market, find twelve models that spoke to me, and highlight some of the things that I think are important when shopping for an RV that will be lived in 24/7/365. For reference, we have pics and specs and a description of the fifth wheel trailer we live in at this link. 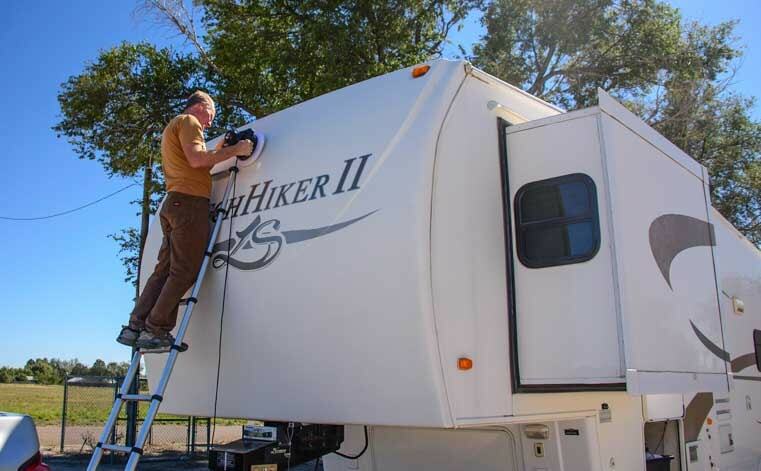 If you haven’t done much RVing yet and you are planning to move out of your current home and set off on a life of adventure on the road, the best way to figure out what features you need and want in your full-time fifth wheel is to get some practice RVing first. I can’t state strongly enough the value of buying a cheap little RV and going and having some fun on weekends and vacations before jumping into the full-time RV lifestyle. This is especially true if you’ve got a year or more to go before you will actually start full-timing. 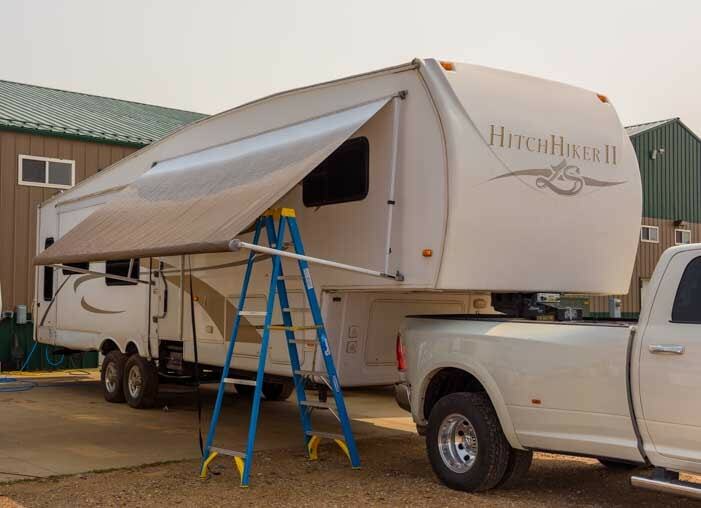 Nothing is better than hands-on experience, and you can use the little rig as a trade-in on your full-time RV. The minimal amount of depreciation is a great investment in your own personal education in the RV lifestyle! Here is a blog post about that. 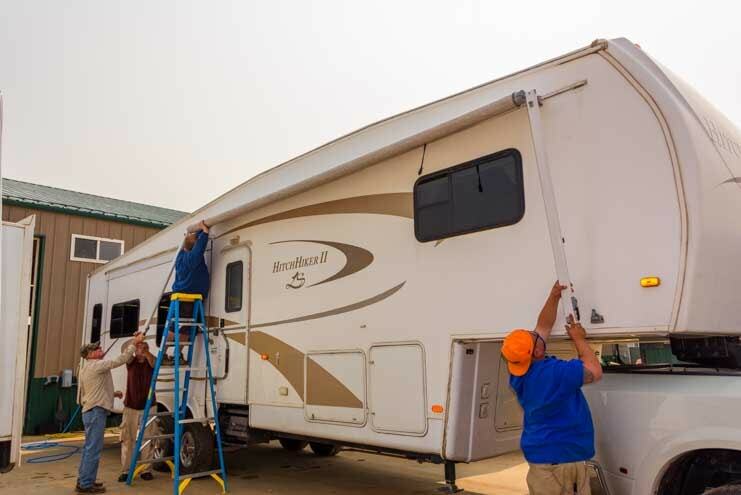 So what DO you look for in an RV when you are replacing your sticks-and-bricks house? After all, the the most important factor is no longer Location, Location Location! 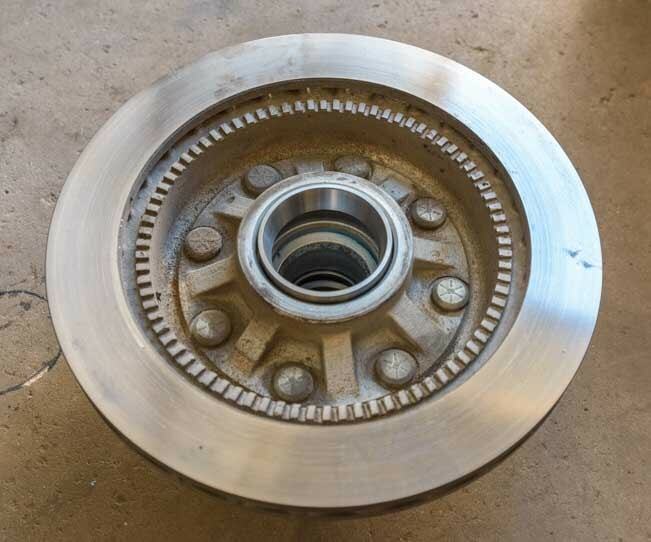 Different folks look for different things, but here’s what we look for whenever we check out a new fifth wheel at a dealership (which we do frequently!). The first thing we look at is the trailer’s Cargo Carrying Capacity. 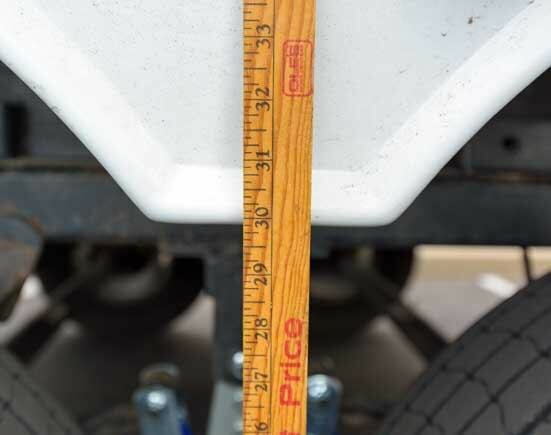 This is the amount of weight the trailer is designed to carry safely and legally. Trailer manufacturers are required to post a sticker on the exterior of the front end of the trailer on the driver’s side that indicates what the CCC is. That is, the Cargo Carrying Capacity is the Gross Vehicle Weight Rating less the sum of the Unloaded Vehicle Weight and the propane weight. However, it is much more common for manufacturers to calculate CCC as simply the GVWR less UVW and not count the propane weight as part of the equation. This is also known as the NCC (Net Carrying Capacity). The propane weight is only 40, 60 or 80 lbs, depending on whether the two propane tanks are 20 lb., 30 lb., or 40 lb. tanks, so it is not that important whether it is included in the calculation of CCC or not, and it is easy to see why the terms CCC and NCC are often confused and used interchangeably. 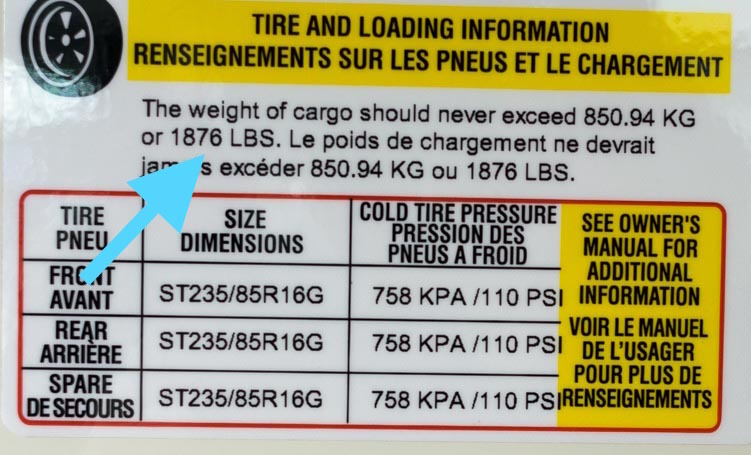 In addition to stating the CCC on a sticker on the trailer, the manufacturers are also required to have a sticker indicating how much the fresh water in the trailer weighs when the fresh water tanks are full. One gallon of water weighs about 8.35 lbs. or 3.785 kg. Fresh water is officially considered to be cargo, so if the trailer is towed with its tanks full, then the CCC available for everything else (food, clothes, tools, barbecue, bikes etc.) is reduced by the weight of the fresh water weight as stated on the sticker. 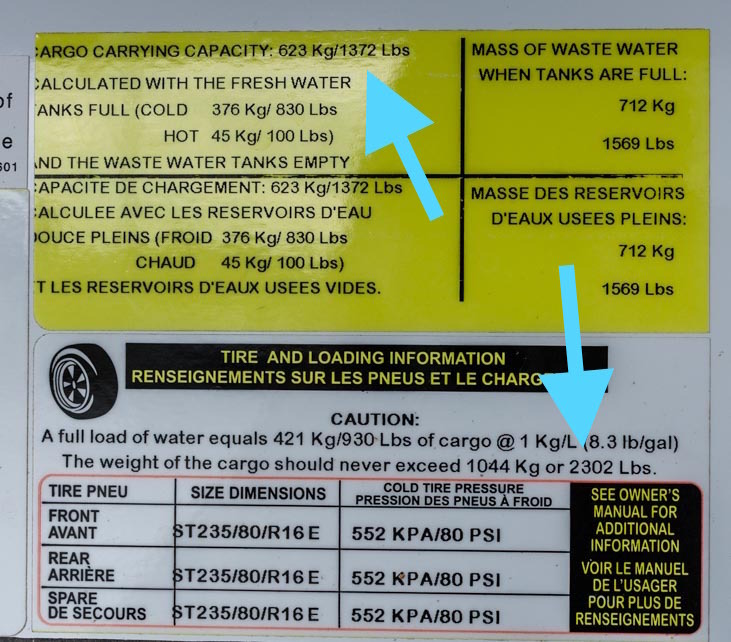 This detailed sticker shows the weight of the fresh water tanks when full (830 lbs in the fresh water tanks and 100 lbs in the hot water tank) PLUS it shows the weight of the Black and Gray waste tanks (1,569 lbs.) AND it shows the cargo carrying capacity of the trailer with water tanks both full (1,372 lbs) and empty (2,302 lbs). If the trailer doesn’t have the official CCC stated on a sticker, it’s usually possible to find the GVWR and UVW values on a spec sheet and simply subtract UVW from GVWR. 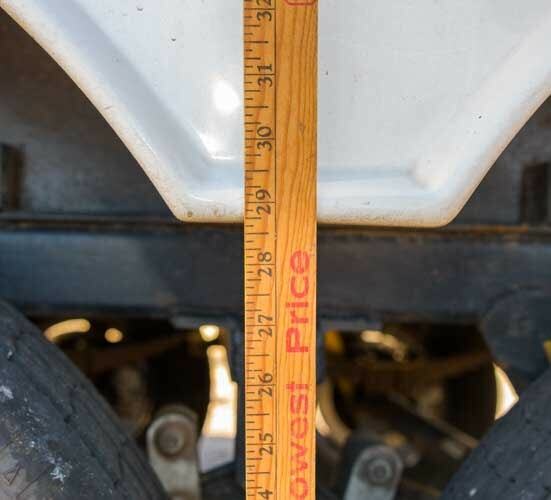 This simple calculation of GVWR – UVW is the easiest way to compare the carrying capacity from one trailer to the next, so that is what we like to go by when we are making a direct comparison. So how much should the Cargo Carrying Capacity be for a fifth wheel trailer that’s used as a full-time home? In our experience, the nearly 3,500 lbs. of CCC on our trailer is barely enough. Because we boondock all the time, we travel with our fresh water tank and hot water tank full and our gray and black tanks empty so we can stay a maximum length of time at our next destination. Other folks may find they can get away with less, but to us, if you are shopping for a big trailer to live in full-time, a CCC of less than 3,000 lbs. is going to be insufficient in the long run. 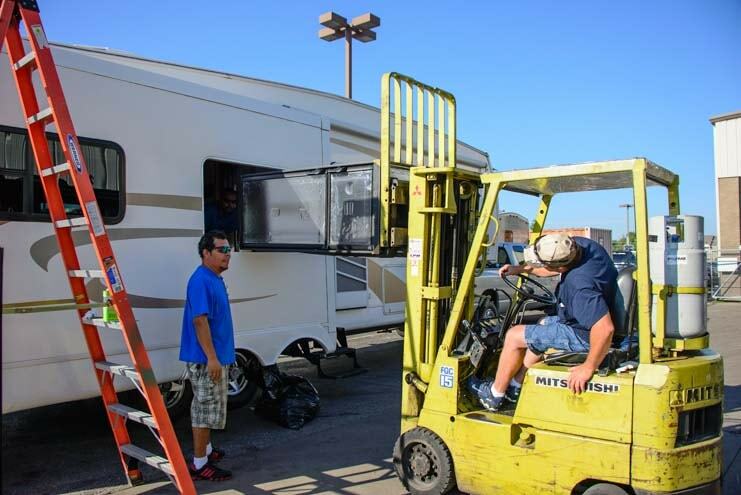 If you are shopping for a fifth wheel toy hauler, then you’ll need 3,500 lbs. for your stuff plus more for the weight of your toy(s). Interestingly, the manufacturers often provide a lot more storage space in their fifth wheel trailers than the CCC of their trailer can reasonably support. Our cabinets and shelves aren’t even full, and we are still at the maximum limit for CCC in our trailer. A much simpler sticker on another trailer shows a Cargo Carrying Capacity of 1,876 lbs. By implication this does not include any water weights because all liquids in the tanks are cargo. So, just because a trailer you are looking at has voluminous shelving, a big pantry, and two huge closets, you won’t necessarily be able to fill all that space and still remain at or below the CCC of the trailer. Another surprise is that smaller trailers frequently have larger carrying capacities. This can be seen in a single product line when a manufacturer uses the same frame for several models. The smallest and lightest model built on that frame will obviously have more carrying capacity than the largest and heaviest one. We also saw it in dramatic fashion when we compared a tear drop trailer and a toy hauler on a dealership lot once (blog post here). One caveat to keep in mind if you overload your trailer is that you risk being found liable if you are in an accident with a fatality and it is discovered your rig was over its weight limit. This is true both if the truck is too small for the trailer and/or if the trailer itself is loaded beyond its capacity. 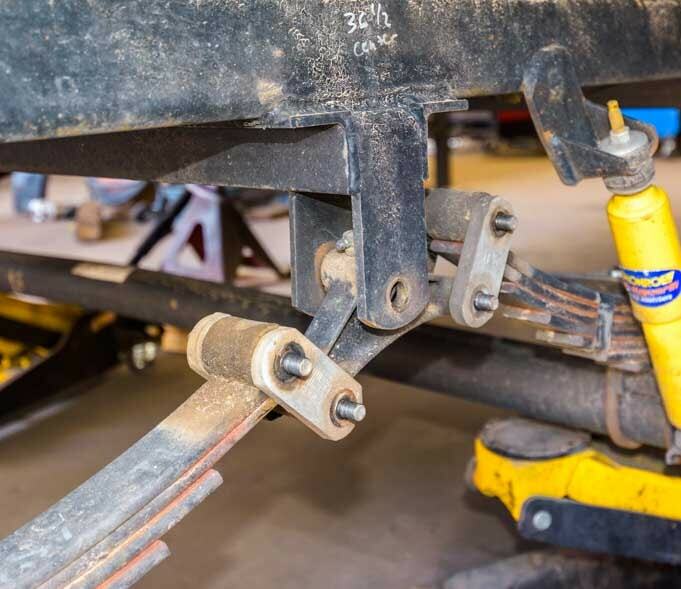 The foundation underlying a fifth wheel trailer consists of the frame, axles, tires, suspension, landing jacks and brakes, and although this is not the glamorous part of the trailer, it is arguably the most important. 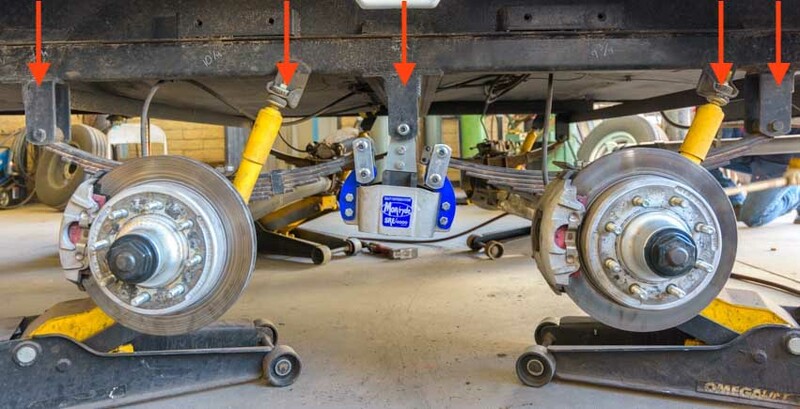 It is possible to upgrade some of these components to improve the overall unofficial GVWR and CCC of a trailer and to improve its stopping power as well. 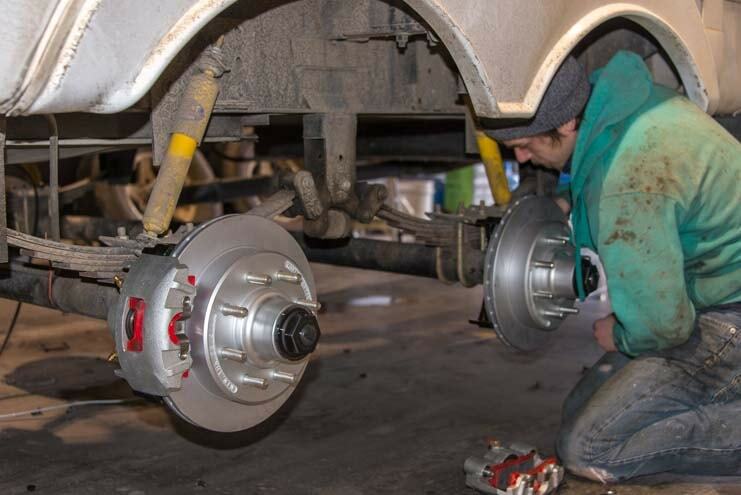 The axles, tires and suspension can all be replaced with beefier parts, and if the trailer has electric drum brakes, these can be upgraded to electric over hydraulic disc brakes (described in detail here). 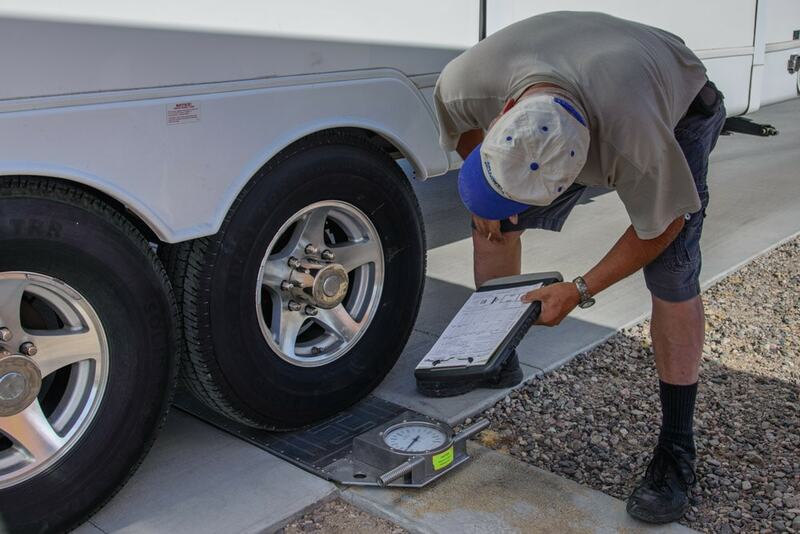 RVers are encouraged to weigh their rigs on a regular basis to ensure that they are staying within the official GVWR for their unit. We weigh ours every year or two. 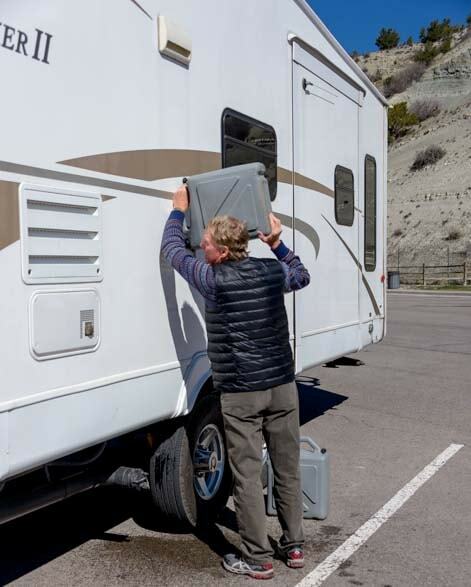 Escapees offers the very thorough SmartWeigh program at several of their RV parks across the country, and we describe our experience with that program at this link: “Making Weight” With Your RV. It is important to note, however, that just because you’ve got bigger axles, better rated tires and beefier suspension, you won’t “officially” have a new GVWR. The trailer will support its payload better, but in the case of a horrific accident, if the GVWR value is referenced and your trailer is somehow found to have been over that weight, you may be considered liable. 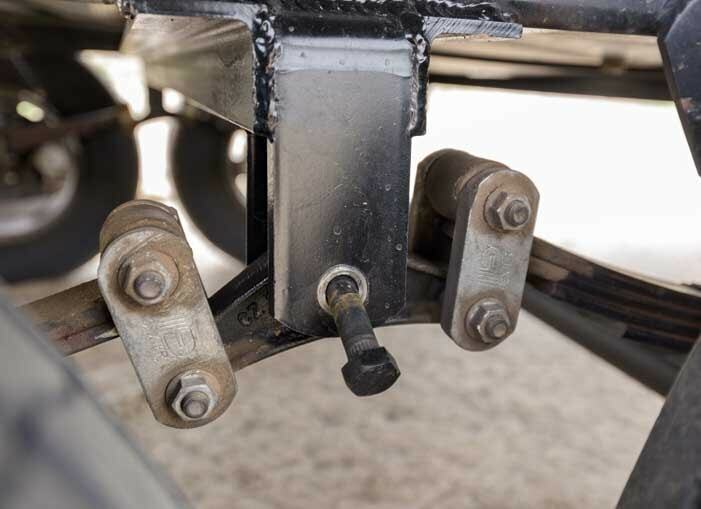 The next thing we look at in a trailer is the frame and axles. 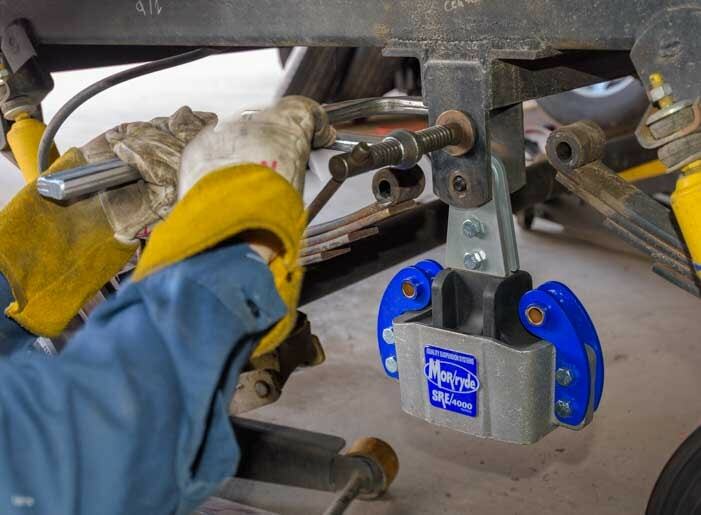 Almost all trailers are assembled on frames built by Lippert Components. A few manufacturers build their own frames in-house. 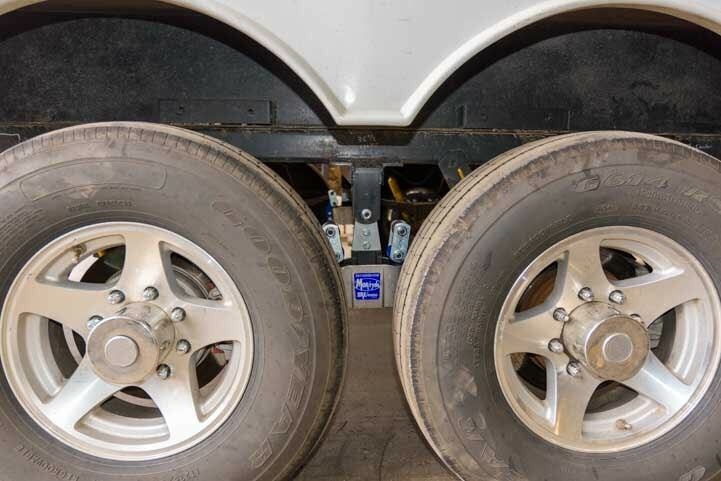 Most fifth wheels are also built on Lippert axles. 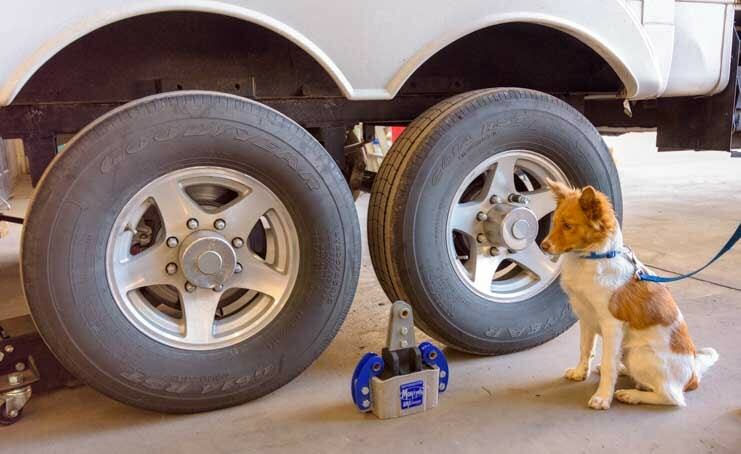 The highest end fifth wheels are built with axles made by Dexter. They advertise the fact and consider it to be a premium feature. 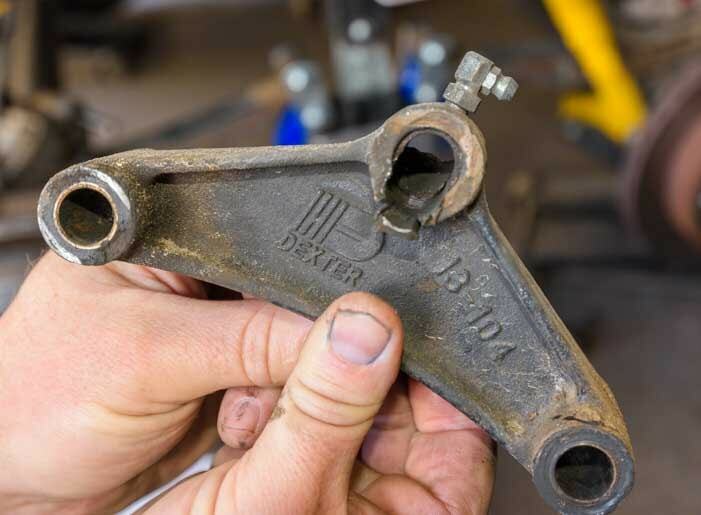 In some cases Dexter axles are an option, and some buyers simply replace their axles after making their purchase. Both of our Lippert axles have failed. The first time was in Nova Scotia. We could tell because our tires began wearing very strangely and very very fast. We limped to Maine to have the rear axle replaced with another Lippert axle. 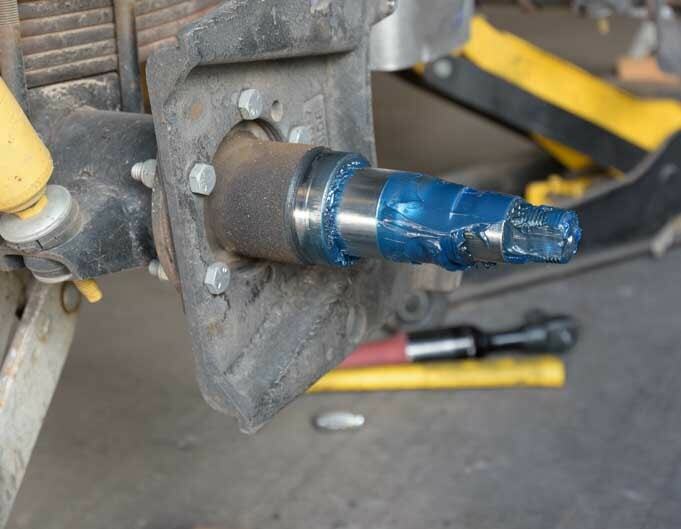 We replaced one of our trailer axles in Bangor Maine. Fortunately, our extended RV warranty saved the day financially, but the time lost and overall frustration of having a big failure on the road was not fun. (Blog post about that experience here). The second time was when our front axle failed in Arizona, and again, the tell-tale sign was bizarre tire wear on the trailer tires. 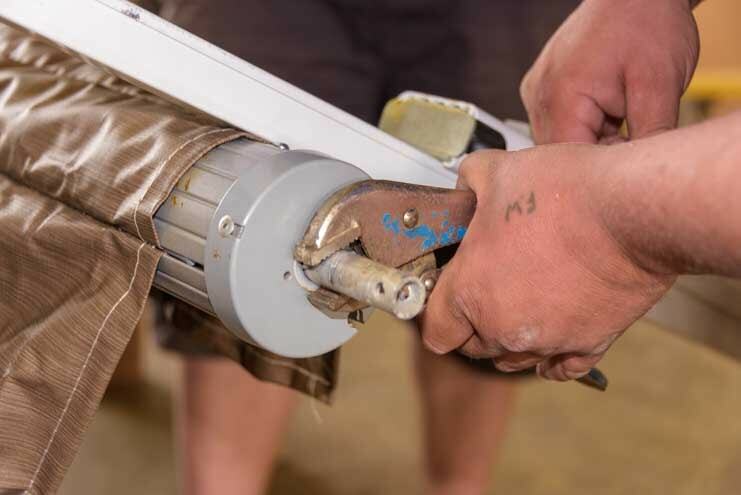 This time we decided to replace both axles with the Dexter brand. Unfortunately, our extended RV warranty did not bail us out on this occasion, but the $3,000 expense of having both axles replaced and correctly aligned with Dexter axles was well worth it, as our tires have been wearing very evenly ever since. 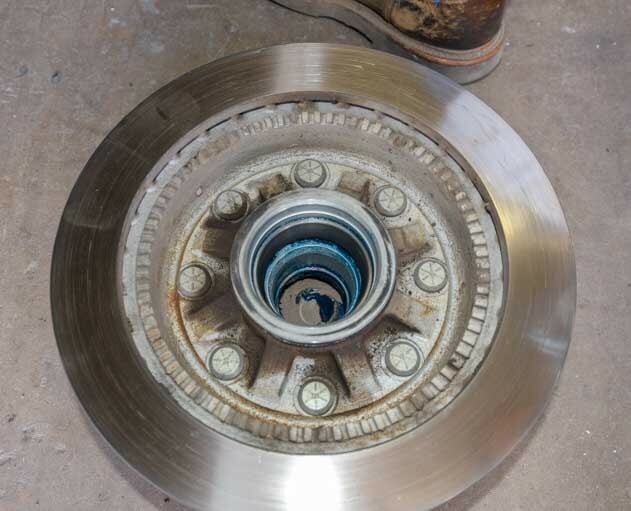 In addition to axle failures, our fifth wheel trailer’s suspension failed upon our approach to Arizona from New Mexico. 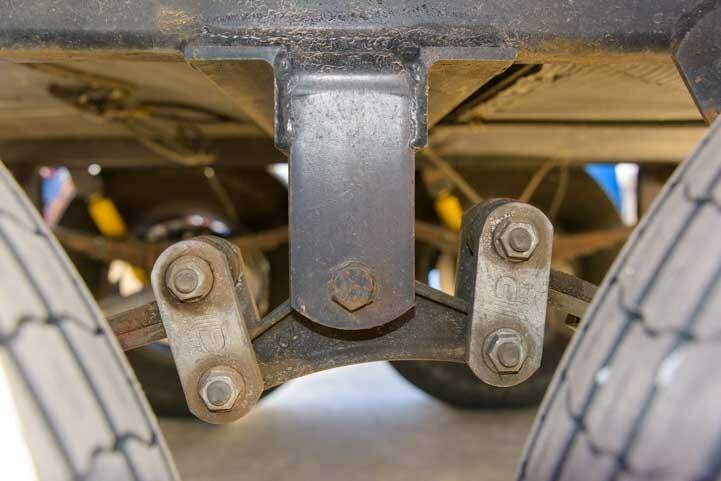 We had the entire suspension overhauled, and fortunately our extended trailer warranty covered the repair (blog post about that experience here). This experience made us realize just how important the suspension is on a trailer. 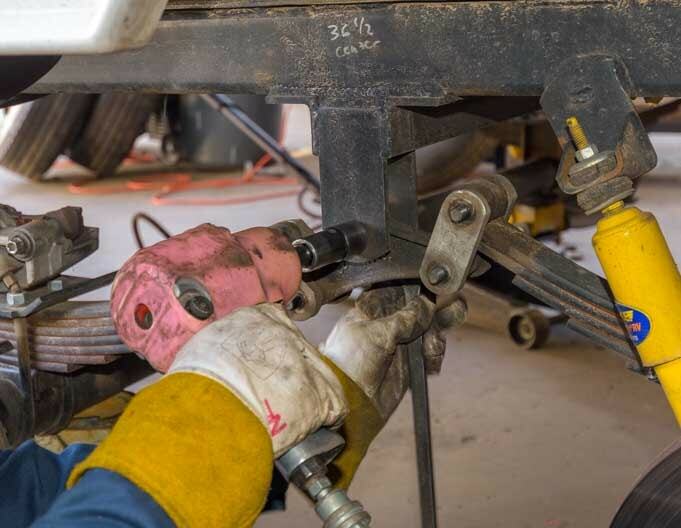 We replaced our failed fifth wheel suspension system in Arizona. 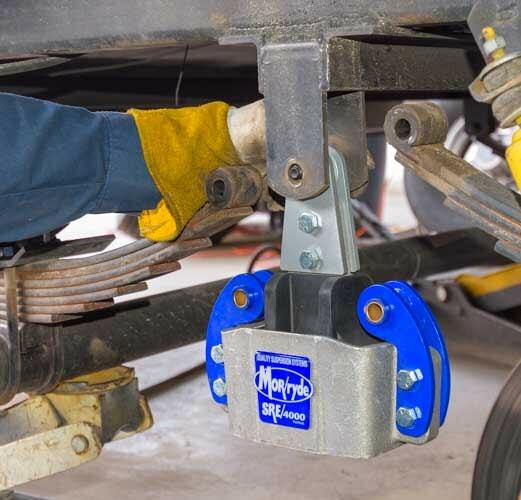 Most fifth wheel trailers come with a conventional leaf spring and gas shock suspension system. 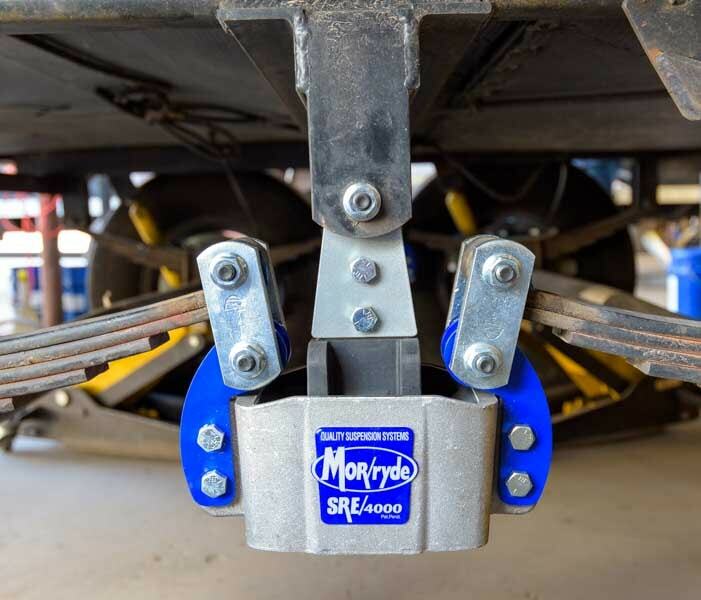 However, some fifth wheels come with an axle-less rubber suspension system from Mor/Ryde. 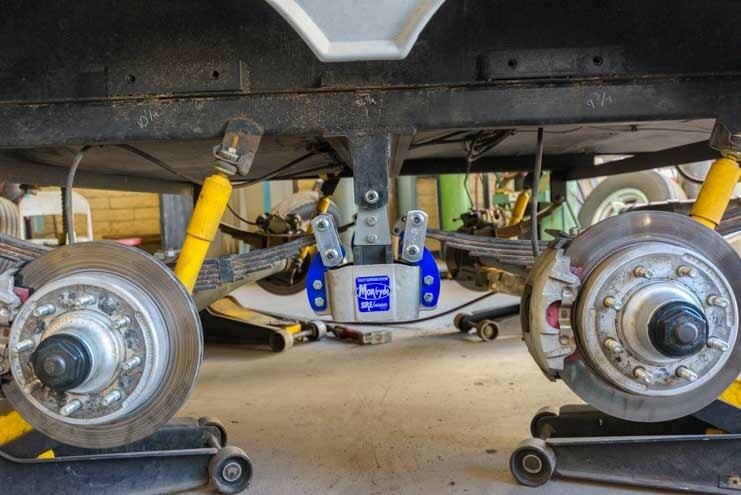 Many people love and swear by the soft ride of this suspension. 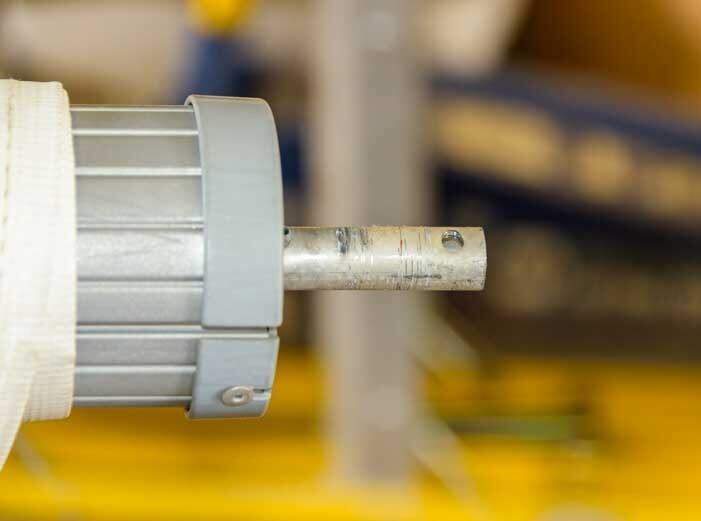 Over time, however the rubber does wear out and needs to be replaced (as do conventional shocks). 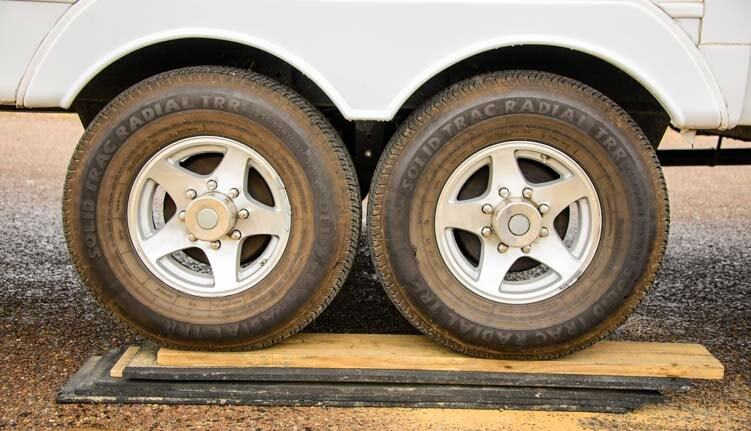 The weight rating on the tires is an important aspect of the overall GVWR rating of a trailer, and upgrading the tires is an easy way to boost the GVWR and increase the CCC. 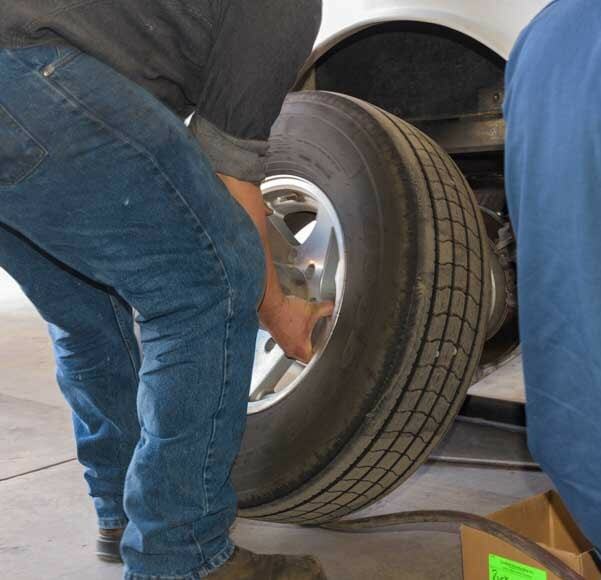 Of course, the legal rating for the trailer will always depend on how the trailer was built at the factory, but by upgrading the tires you can quickly give the trailer much needed support if you are approaching the limit. Tire ratings vary on most fifth wheels between E-rated (10 ply) tires for lighter trailer to G-rated (14-ply) for the heavier ones. Some of the heaviest trailers have H-rated (16-ply) tires but those require wheels that can handle higher air pressure. 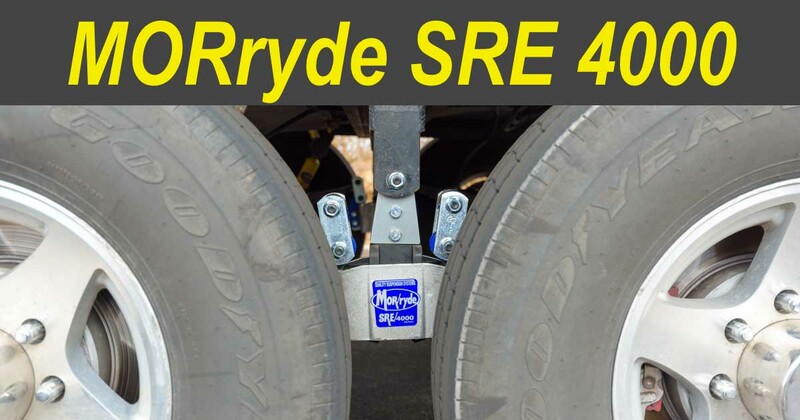 Check the tire ratings on a prospective full-time fifth wheel as well as the axle brand and axle weight ratings. If they are already big and beefy, you will save yourself needing to upgrade them later. On the other hand, if you love the trailer but those things are a little skimpy, budget in an upgrade when you contemplate the purchase price and its impact on your bank account. 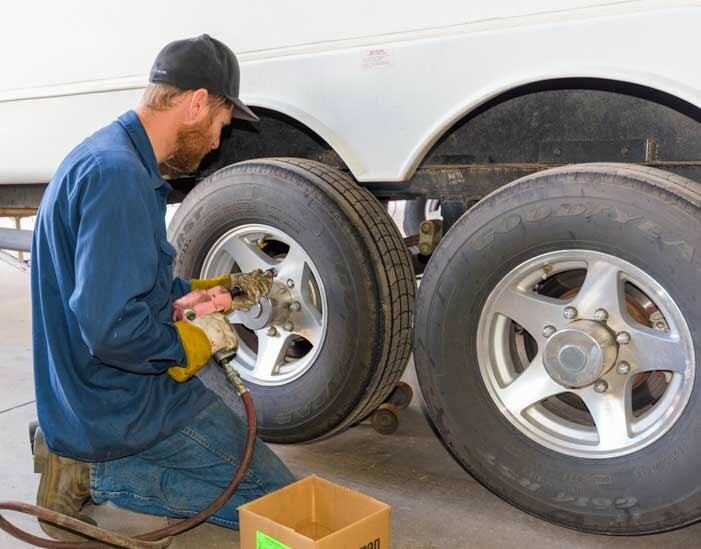 We upgraded the E-rated (10-ply) tires that came on our trailer with G-rated (14-ply) tires. When we swapped axle brands, we stayed with the 7,000 lb. axle rating because we had upgraded our trailer’s electric hub brakes to electric over hydraulic disk brakes, and the bigger 8,000 lb. axles required different brakes. 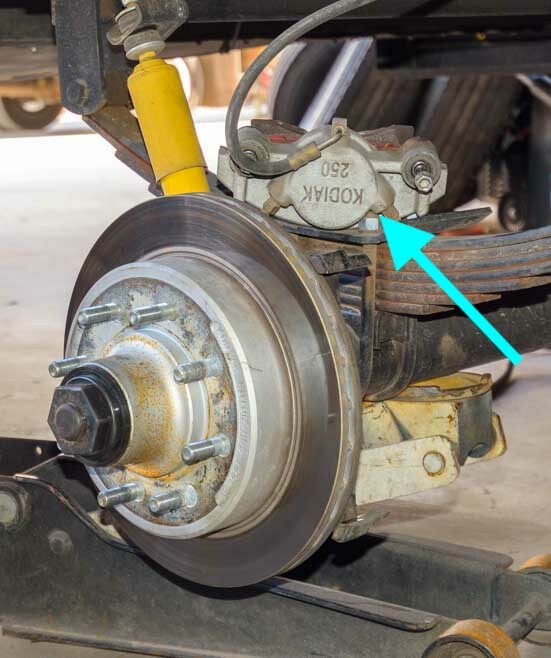 Most fifth wheel trailers come with electric drum brakes. The stopping power is so-so. More expensive brands of fifth wheels offer electric over hydraulic disk brakes as an option. 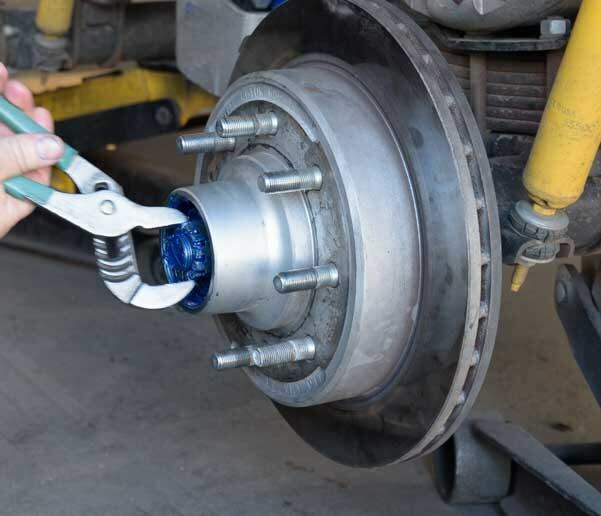 You can also replace the electric drum brakes with electric over hydraulic disk brakes at a later date. We upgraded our electric drum brakes with electric over hydraulic disk brakes, and what a massive difference in stopping power! The upgrade costs about $3,000 or so, but we felt it was worth every penny. Our blog post about that upgrade is here. 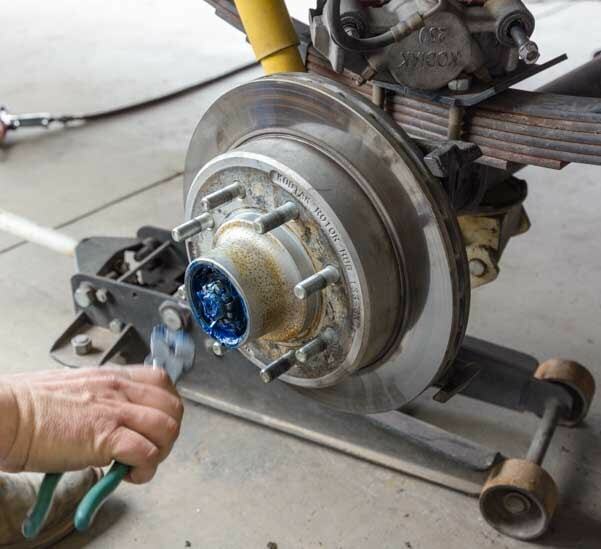 If you think you might upgrade the entire under carriage of your trailer — axles, brakes and tires — because you are at the outer limit of its CCC, you might consider going to the next size axle. We did our upgrades piece-meal as things broke or ore out, but if we’d done it all at once we might have gone with 8,000 lb. axles and corresponding brakes. 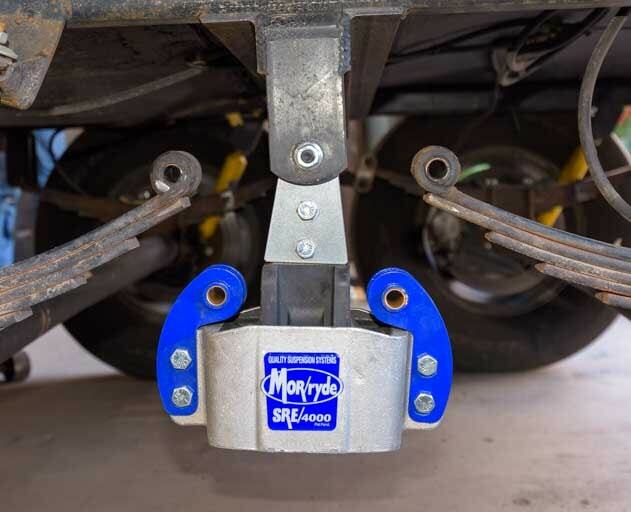 Conventional electric landing jacks on the front of the trailer are less expensive than hydraulic self-leveling jacks, and they are more commonly found on the more affordable brands of fifth wheel trailers. 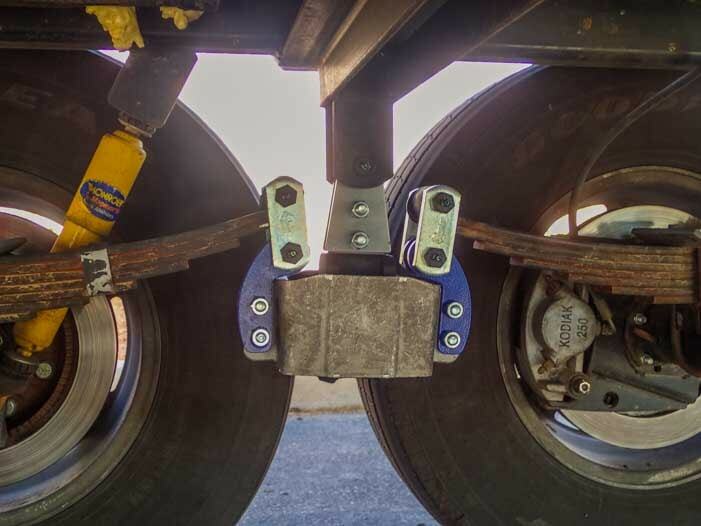 Hydraulic leveling jacks appear on higher end fifth wheels as standard features or as an option. 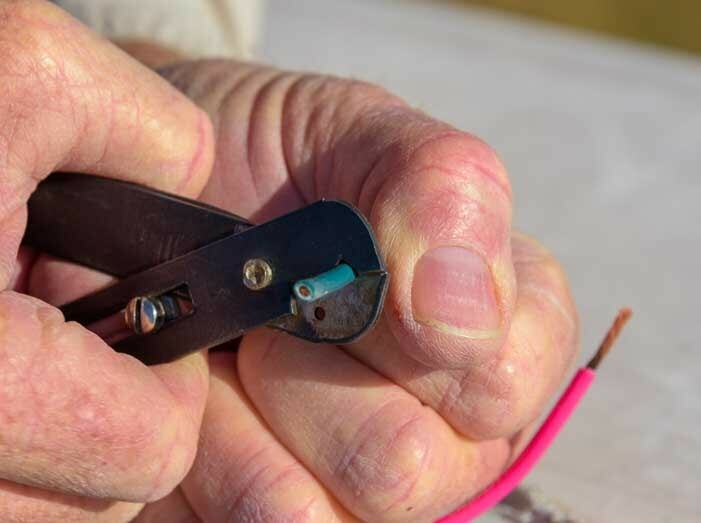 We have been happy with our electric landing jacks over the years, and even though we did have to replace them at one time, it was a relatively easy DIY job that Mark was able to do while boondocking in the desert! Without a hydraulic leveling system, on extremely unlevel ground we put blocks under the landing legs. 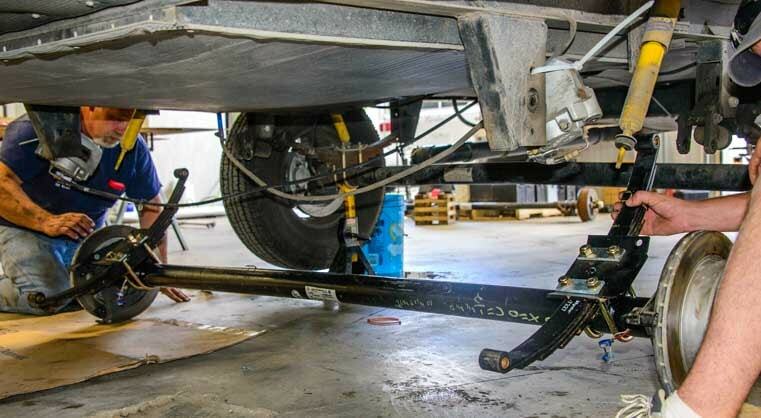 The disadvantage of electric landing jacks is that the side-to-side leveling of the trailer has to be done by sliding something under the wheels to prop up one side of the trailer, and sometimes we have to prop up the front end of the trailer too. 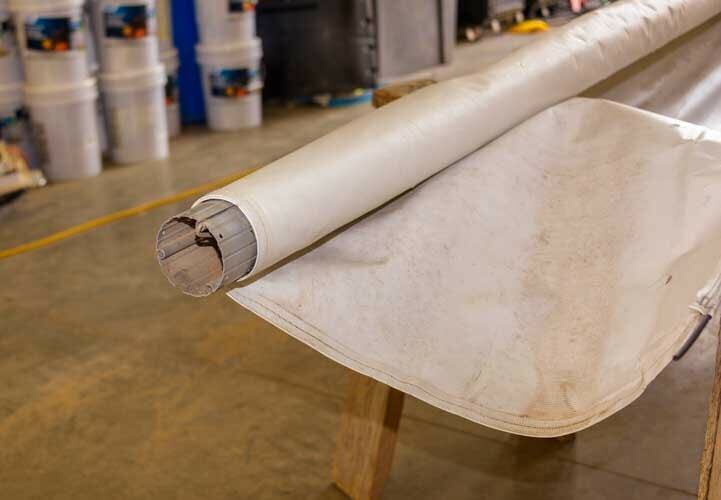 We carry 5′ x 1′ x 1″ strips of a sliced up heavy duty rubber mat for this purpose. We used to carry 5′ long 1×8 pine boards. Lots of folks carry the plastic leveling platforms. 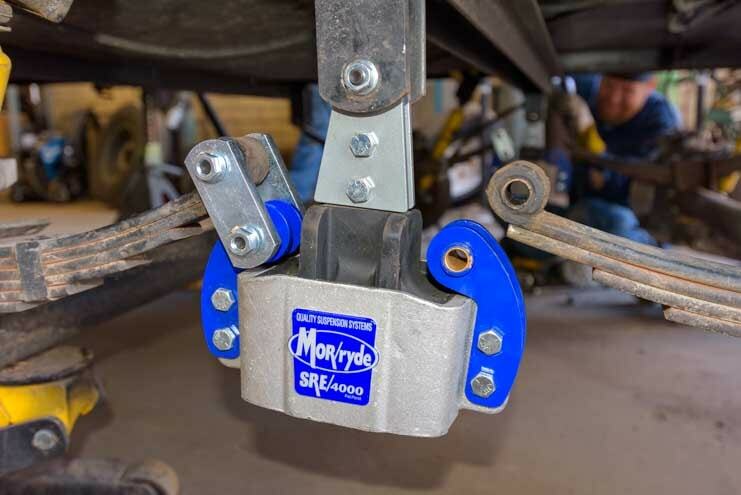 Hydraulic leveling jacks can do most or all of the leveling without the need for anything being placed under the tires. Just hit the button and watch the trailer level itself. In the most off-level situations it may still be necessary to prop up one side of the trailer with something under the wheels. Usually all we need is one or two mats under our wheels. In rare cases we have to stack higher! 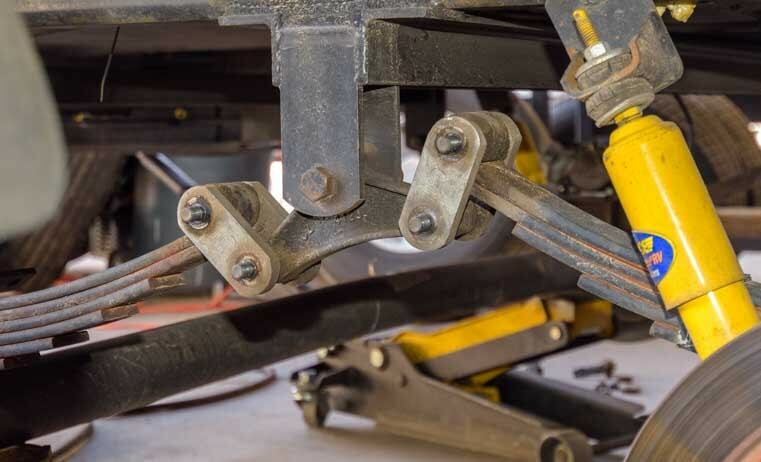 Another great benefit of hydraulic leveling jacks is that if you need to jack up one side of the trailer to work on the tires, wheels or suspension, you can use the hydraulic leveling jacks instead of a portable jack placed under an axle. It’s safer and easier. 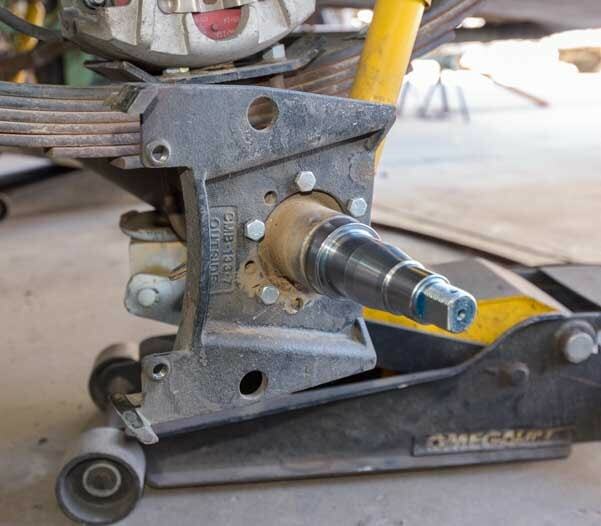 The only disadvantage of hydraulic leveling jacks is simply that they are complex and might fail. Occasionally (though extremely rarely) the legs have been known to fall down while the trailer is being towed. Of course, technology improves with every year, so these kinds of problems are less and less common. 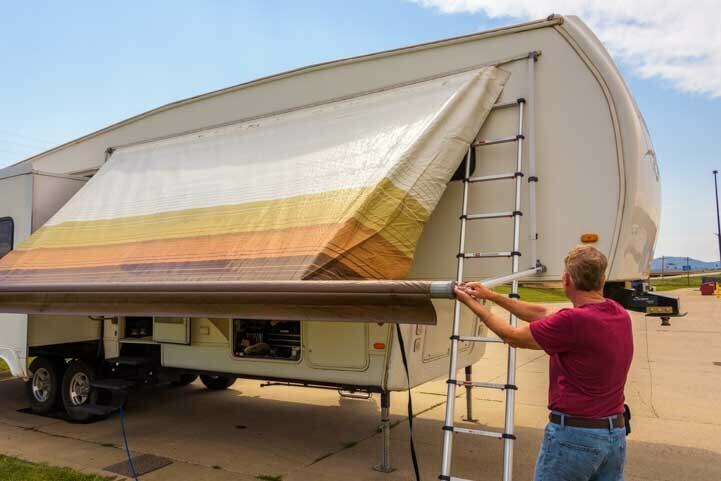 Lots of trailers are billed as “Four Season,” but in reality, you can’t compare living in an elevated box with 2″ to 3.5″ walls with living in a house that stands on a foundation and whose thick walls are built with layers of drywall, Tyvek, plywood and siding. That being said, “Four Season” coaches are generally better insulated than others. Just don’t expect to be totally warm and cozy and free of condensation when there’s a blizzard and temps stay below 0 F for a few days! but RVs are not really made to be “four season” the way that houses are. 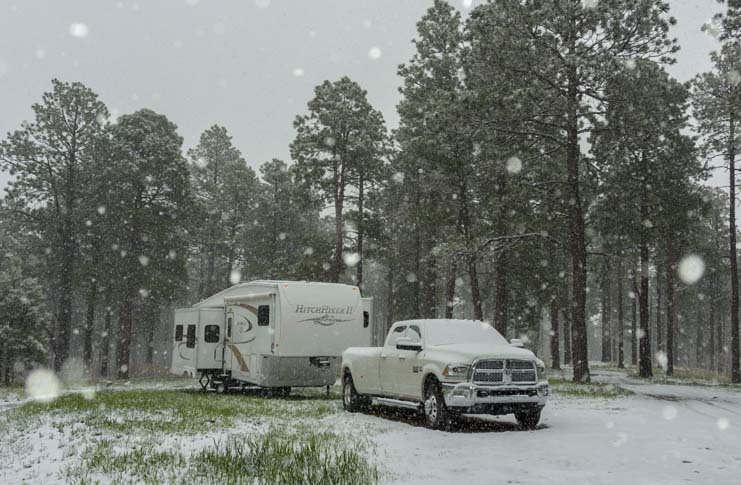 Winter RVing tips – Staying Warm! 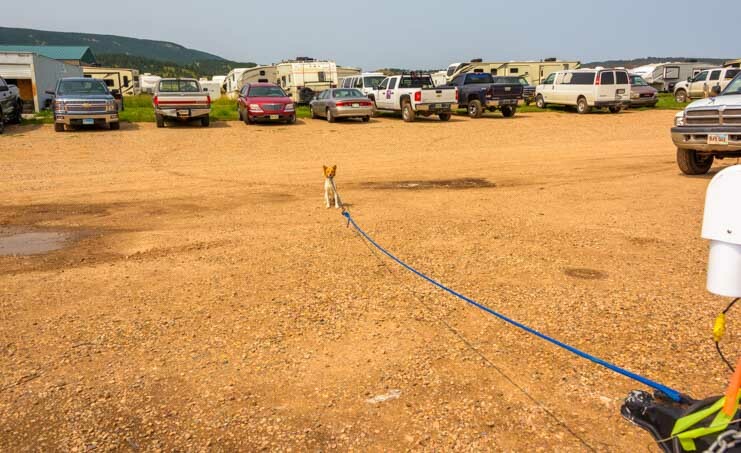 Summer RVing tips – How to Beat the Heat and Stay Cool When It’s HOT! 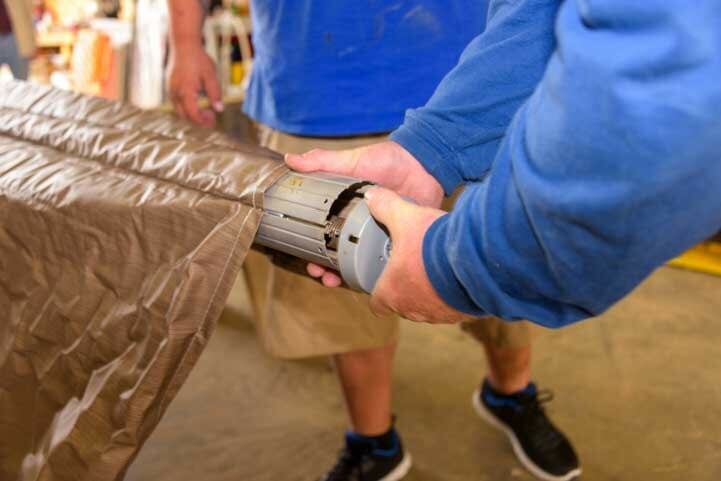 There are various ways to insulate an RV and there are pros and cons to the different types of insulation that RV manufacturers use. Some higher end fifth wheels are built with conventional wooden studs and fiberglass insulation as this may provide greater insulation. Wooden studs are less apt to conduct warm air to the outside than aluminum framing is. On a cold winter morning it is easy to see where the aluminum framing is on an RV if you go outside because you can see the outline of the aluminum framing on the trailer wall. Condensation forms inside our windows on a particularly moist and freezing winter day. 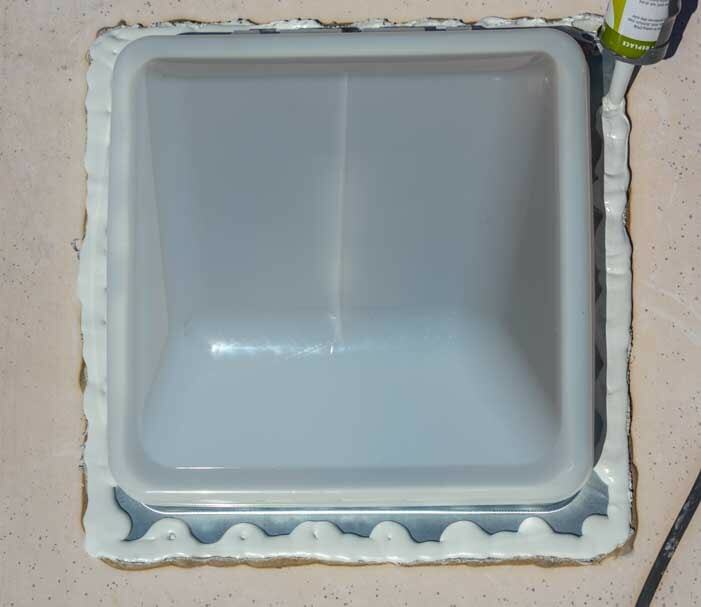 However, fiberglass insulation has been known to fall down off the studs over the years, leaving the tops of the walls uninsulated. Usually, the front and end cap and the areas between the roof trusses are all insulated with fiberglass insulation as well. 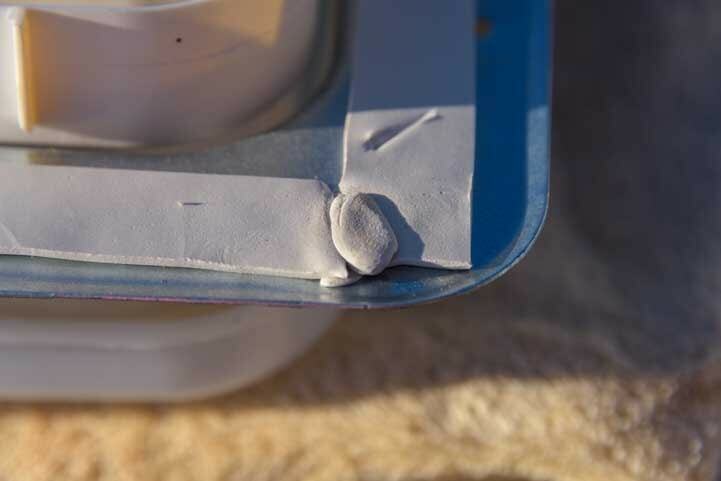 Most fifth wheels are insulated with styrofoam, and the styrofoam used varies in quality. The use of “blue board” polystyrene styrofoam made by Dow Chemical was one of the big selling points in the NuWa Hitchhiker brand of fifth wheels like ours (NuWa no longer builds trailers). We’ve also heard this product referred to as “Blue Dow” foam. When we did a factory tour at NuWa before we bought our trailer, we were told that the folks there had tested the strength of the blue board by driving a truck over a piece that was suspended by its two sides, and it didn’t break. We were also each handed a piece and challenged to break it. We couldn’t. 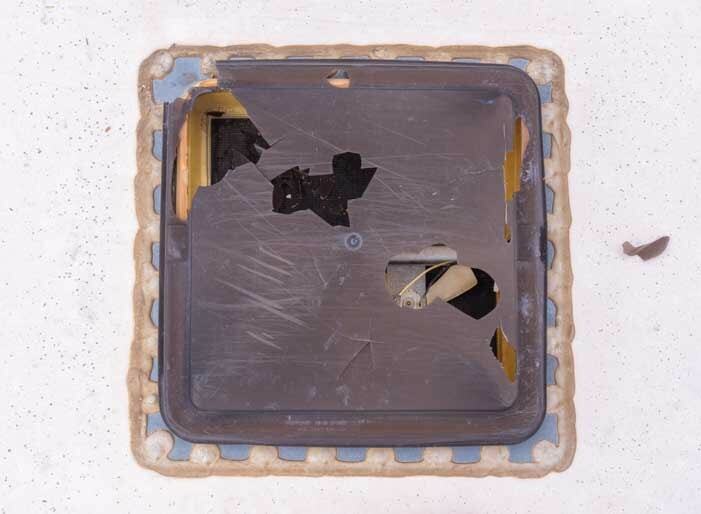 Interestingly, it may be this very strong styrofoam in the walls that kept a Hitchhiker fifth wheel intact recently when it rolled over at 60 mph on the interstate (blog post about that here). 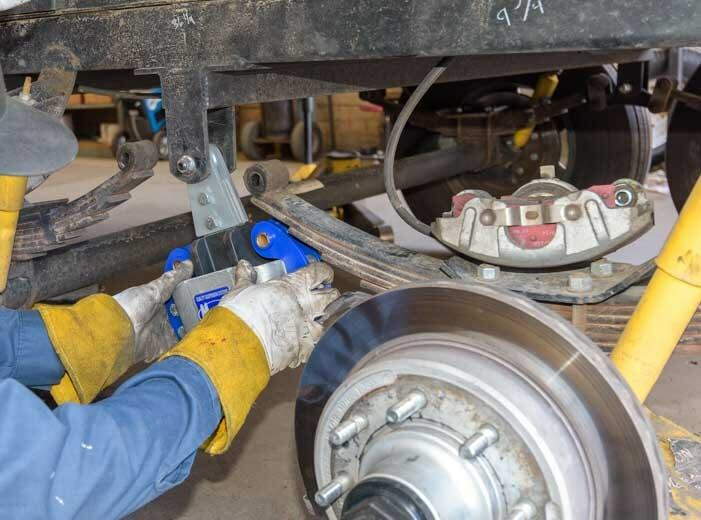 Besides providing strength to the fifth wheel frame, Dow blue board foam has a very high R-factor. A few high end fifth wheels are built with this kind of insulation nowadays. 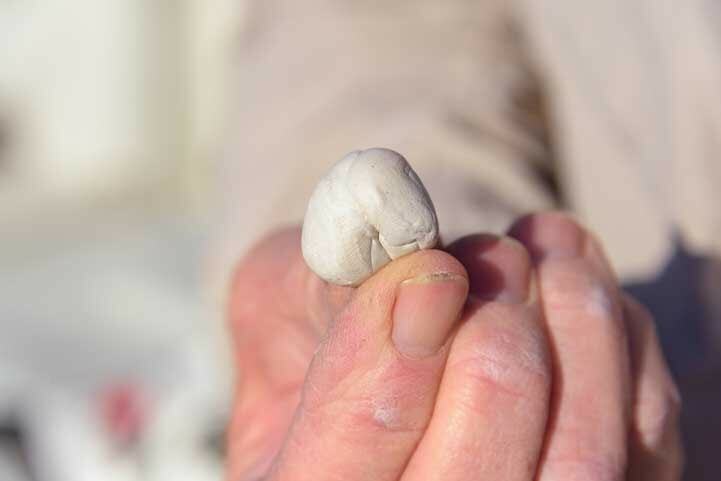 Most, however, are built with a weaker and less insulating kind of styrofoam. 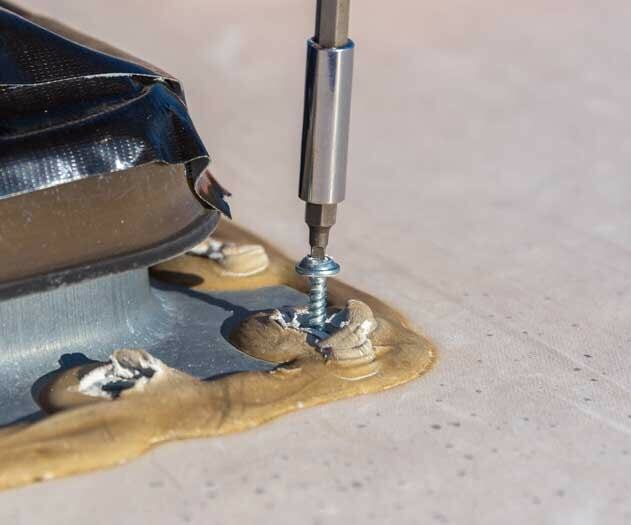 When looking at the insulation R-factors that are advertised by the RV manufacturers for the walls and roof of a fifth wheel, it’s worthwhile to keep in mind that the number may be for the most heavily insulated part of the wall or roof. 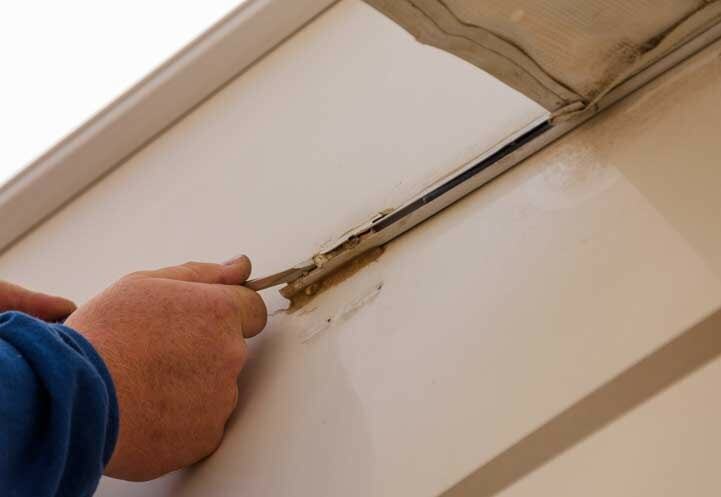 RV windows, doors and roof hatch vents have very low R-factors for insulation, and that is where most of the heat is lost. 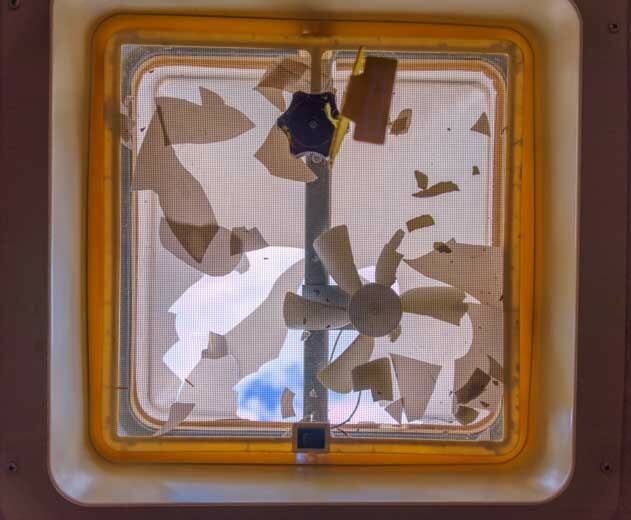 How much heat is lost through RV windows? Just look at what percentage of a fifth wheel wall is actually windows! 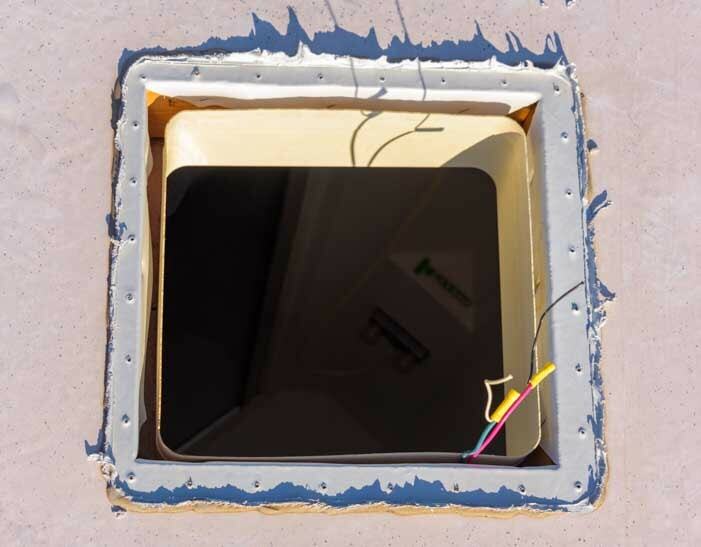 Also, some fifth wheel slide-outs are built with thinner walls and less insulated roofs than the main body of the fifth wheel. Ours is. Again, what percentage of the fifth wheel’s walls and roof are part of the main structure and what percentage are slide-outs? Fifth wheel trailers are built with various materials as the exterior surface of the walls and roof. Lower end trailers have an exterior fiberglass finish of filon. This is what was on our first full-time travel trailer. It doesn’t shine and is a little harder to keep looking spiffy. 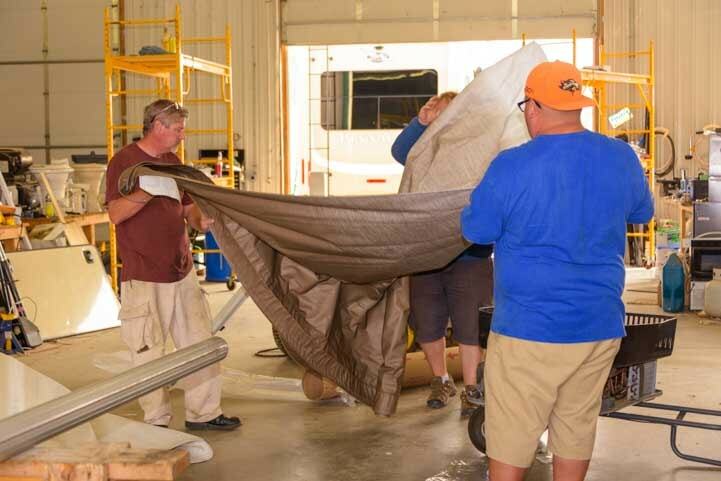 Maintenance, like washing and waxing the massive exterior of a big RV, is just part of the lifestyle. 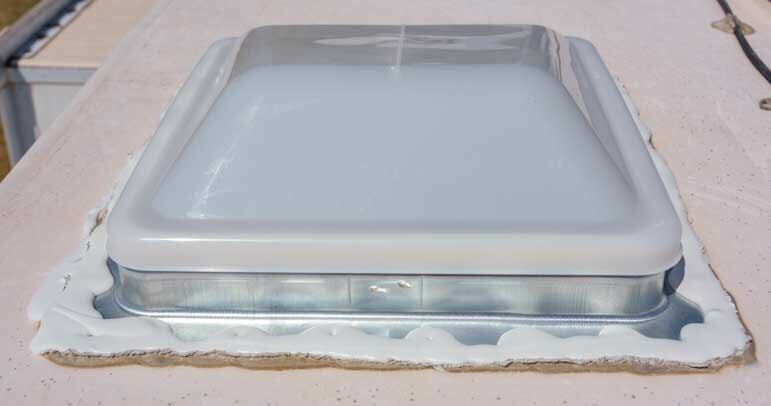 The next level up is a fiberglass gelcoat exterior. This is shiny and can be maintained to a glossy finish by waxing the trailer twice a year. Unfortunately, the pretty swirly stickers that give fifth wheel trailers their colorful look will begin peeling off after about 4-5 years. 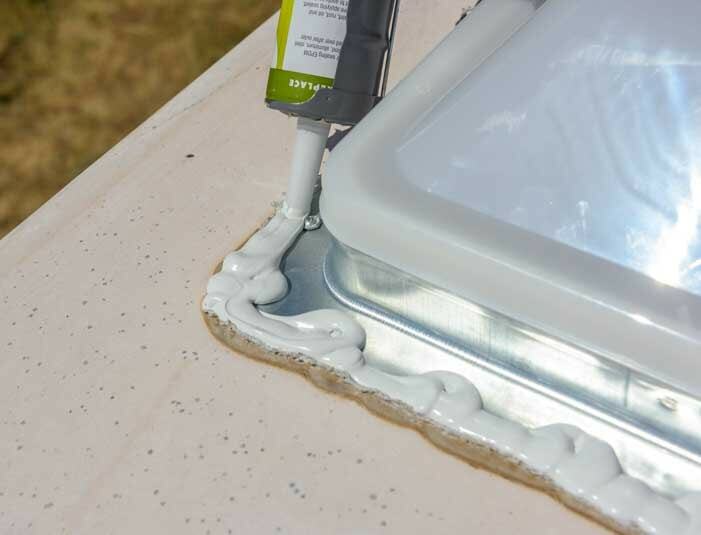 The highest level finish for a fifth wheel trailer is automotive paint. This is an extremely durable finish and the swirling paint patterns will never peel off. It is also very expensive (figure on about $10k) and is found only on the highest end fifth wheel trailers. 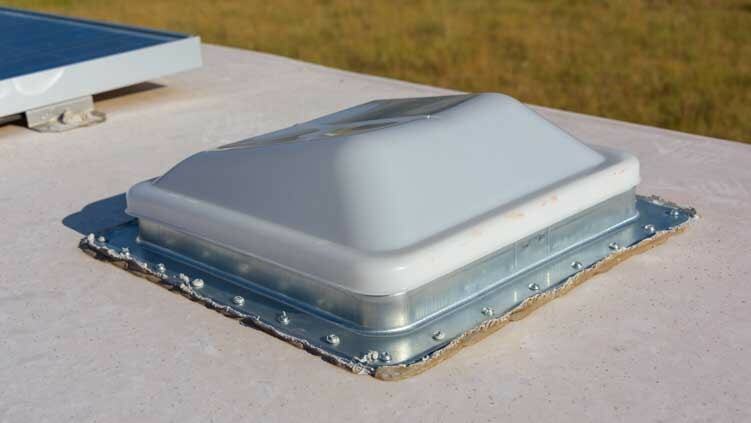 Most fifth wheel roofs are “rubber” roofs. These usually come with a ten year warranty, and they are pretty much ready for replacement at the end of ten years! 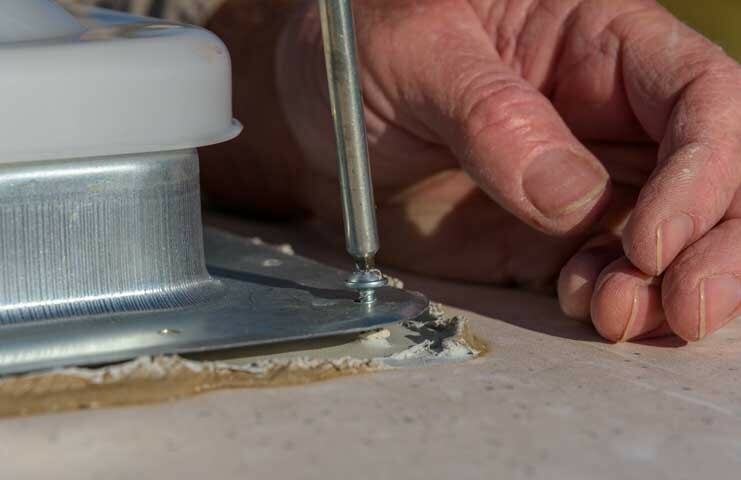 Fiberglass roofs are more durable. 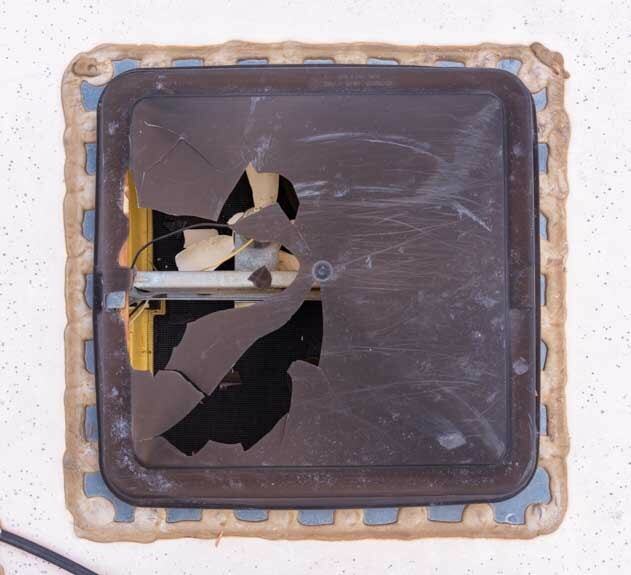 If you are going to install solar panels on the roof, you may need to be a little more careful with a fiberglass roof to be sure you don’t crack it when you drill into it. Rubber roofs can be made of EPDM or TPO. As EPDM roofs begin to age, they start shedding a lot of dust, and every time it rains this creates streaks down the sides of the trailer. Cleaning the roof often helps reduce the streaking, but it’s very hard to eliminate the problem all together once the roof begins to deteriorate a few years into its lifespan. TPO roofs do not have this problem. Other than these basic structural features, the rest of the decision is pure fun fluff stuff. The most important thing to ponder when you’re shopping for your new rolling home is how you anticipate living and traveling in it. What is your camping style? That is, how do you want to camp and where will you travel? Roads are bigger and straighter in the western states than in the eastern states, so bigger rigs are easier to travel in out west. Many privately owned RV parks accommodate “big rigs” across the whole country. However if you are more into “camping” in natural settings, the sizes of campsites in government run campgrounds vary a lot. Some RVers love boondocking. Others don’t. 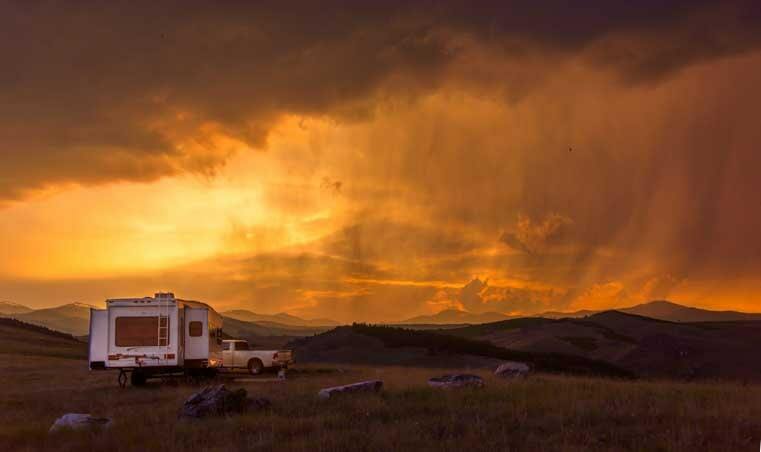 Knowing your own personal camping style helps a lot when it comes to buying a full-time rig. States Park campsites are often quite large and frequently come with hookups, but they can be pricey too and there are rarely discounts for seniors or for long stays. 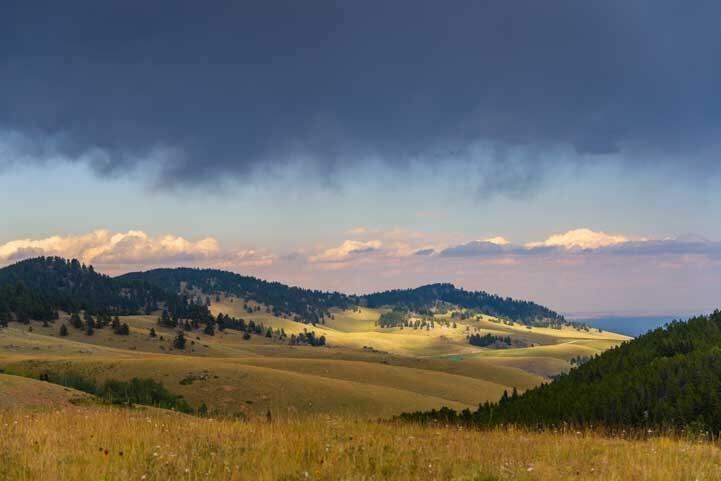 Campsites in the National Parks and National Forests are often very small, often have no hookups, and may therefore be slightly cheaper, especially for holders of the Federal Lands Senior Pass. So, will you be dry camping a lot or will you get hookups most of the time? 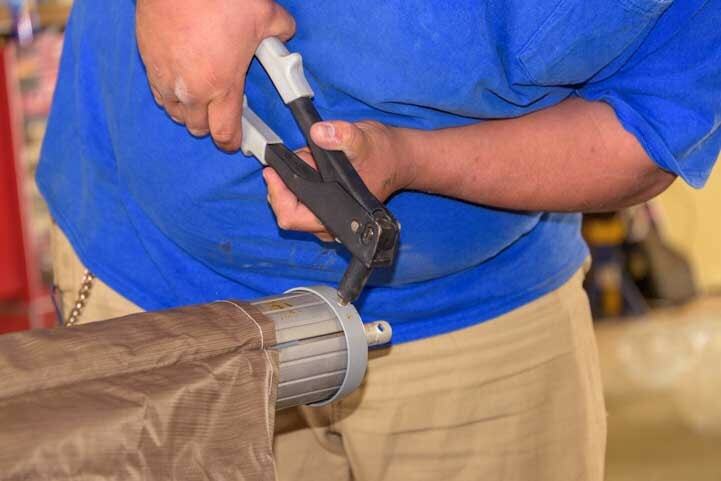 This makes a difference in what kinds of holding tank capacities you’ll need. If you’ll be getting hookups most of the time, then there is no need for big holding tanks. However, if you’ll be dry camping a lot, then big holding tanks will mean you can stay put a little longer before you have to go to an RV dump station . Our fresh water tanks and hot water heater are 70 gallons combined, our two gray water tanks are 78 gallons combined, and our black tank is 50 gallons. This has worked well for us dry camping every night for the better part of ten years. We do carry 25 gallons of fresh water in the back of our truck in jerry jugs, but we don’t often need to use that water since we typically stay in places for less than two weeks before moving on, which is about how long our holding tanks last. One nice feature if you are going to boondock a lot is to have an easy way to refill the fresh water tanks. 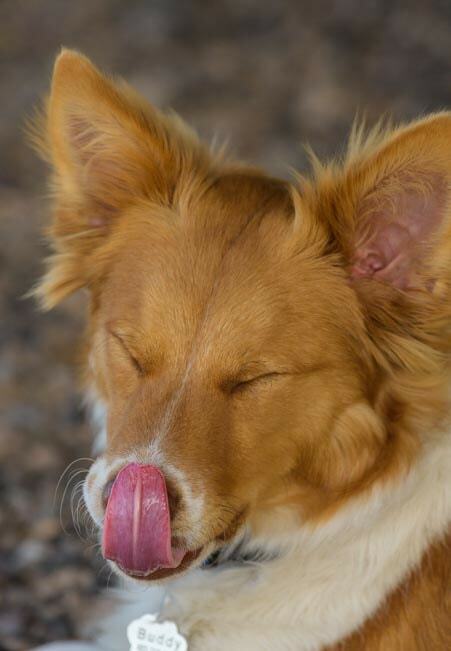 We have a gravity fed fresh water intake that we can fill from a fresh water hose or from our jerry jugs. We have a gravity based fresh water intake on the side of our trailer. Unfortunately, it is rather high up (and it doesn’t need to be!). 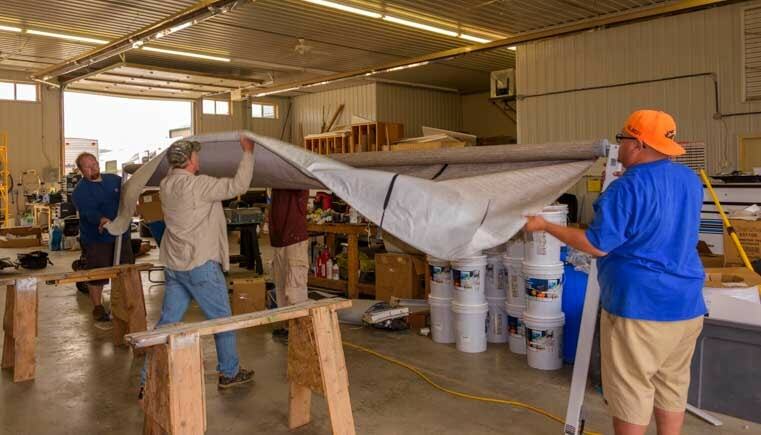 The handy thing about this is that with our trailer the ratio of fresh water capacity to gray and black capacity means that we run out of fresh water before we fill up the gray or black water tanks. Being able to top off the fresh water lets us camp in one spot a little longer before we have to pack it up to go to an RV dump station. 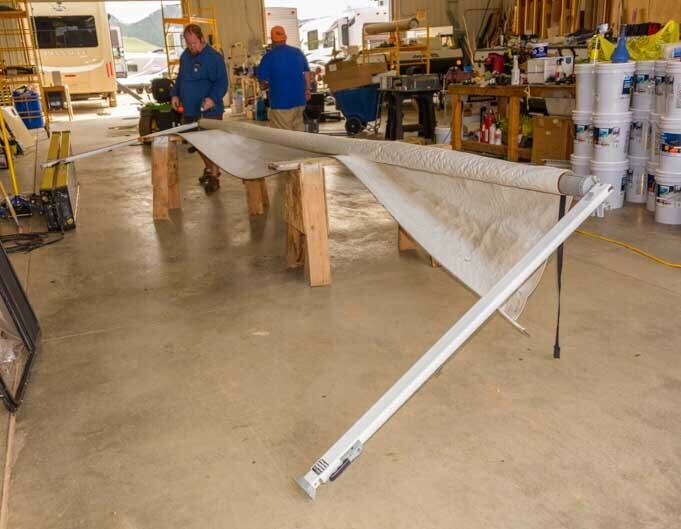 If you are going to be dry camping a lot, you may want to consider installing a solar power system, and there are a few things to keep in mind about that as you shop for a full-time fifth wheel. 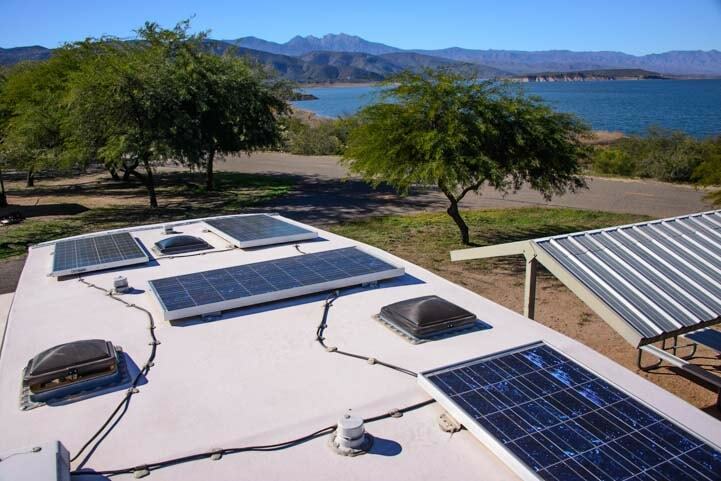 Solar power doesn’t have to be a big, expensive and difficult thing to add to an RV (here’s an article summarizing several types of RV solar power systems). 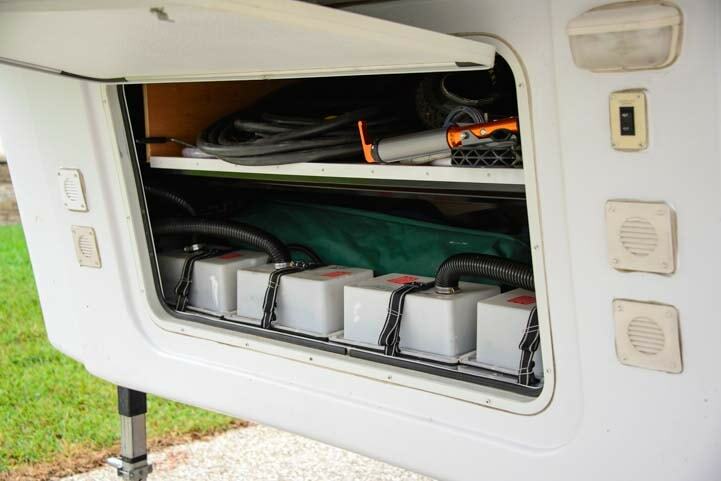 A portable solar power suitcase that includes a pair of solar panels and a solar charge controller and cables to connect to the batteries all in one package is a nifty way to have solar power available without installing a permanent system on the roof and in the RV basement. 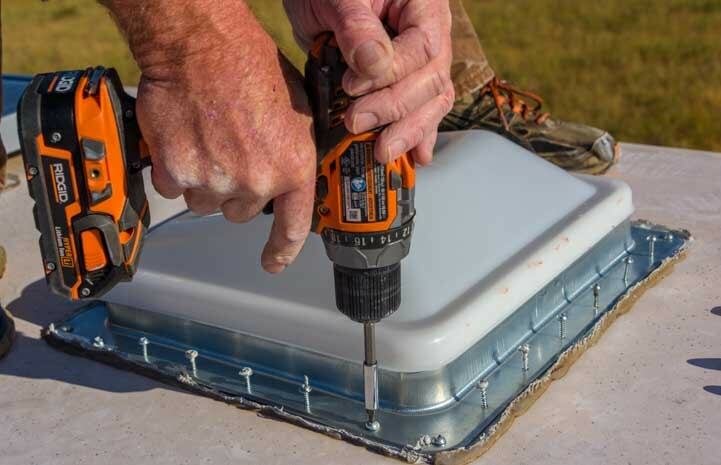 Simply set up the panels on the ground and connect them to the trailer batteries whenever you need to charge the batteries up. 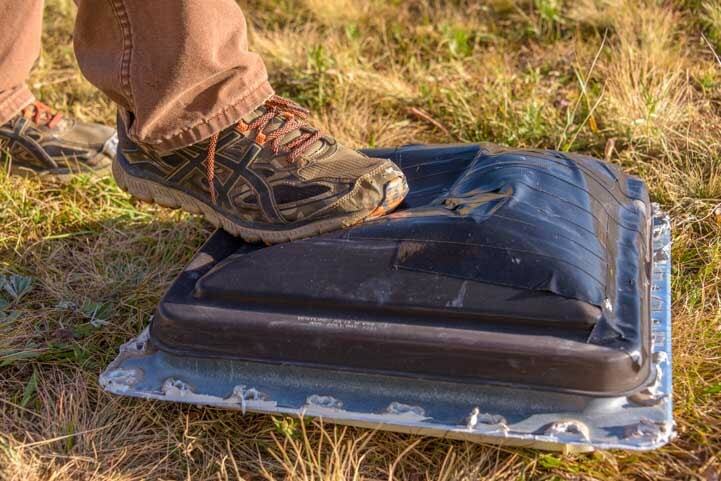 The “suitcase” feature makes it easy to stow the system when not in use. 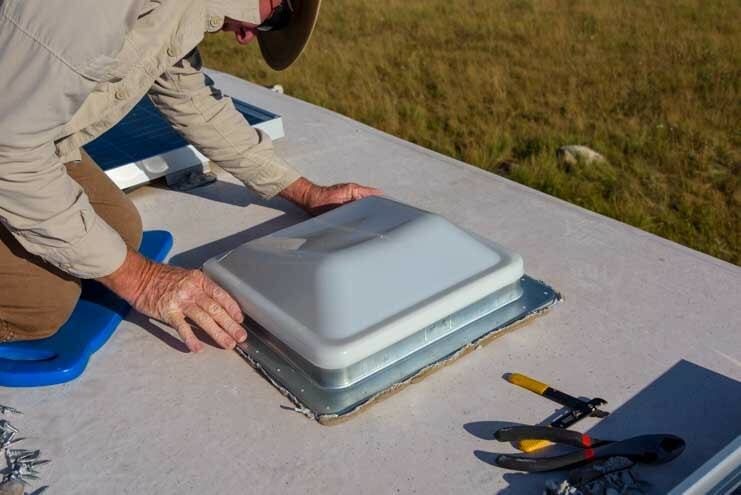 However, most folks who live in their RV full-time and also boondock frequently prefer to install solar panels on the roof permanently and install a solar charge controller near the batteries and install a big pure sine wave inverter too. 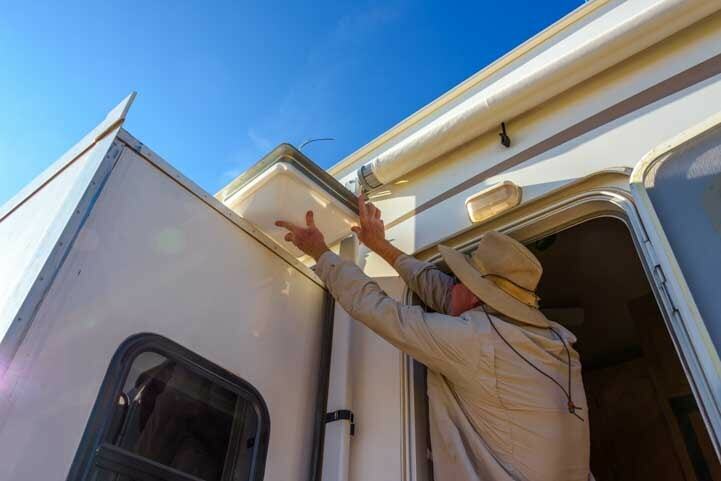 Full-time RVers who dry camp a lot usually end up installing solar panels on the roof. If this is in the back of your mind, you might get excited when you see a fifth wheel (or other RV) advertised as “solar ready.” Unfortunately, in many cases this is a very misleading term. 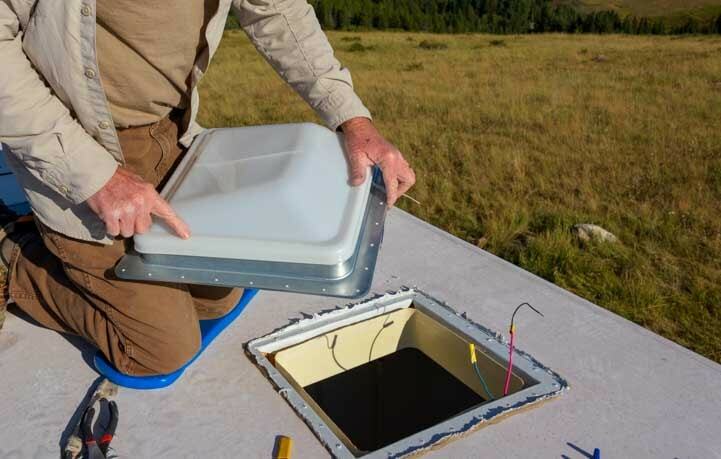 A solar power system that will let you live without electric hookups for days on end will be at least 200 watts and more likely 500 watts or more. 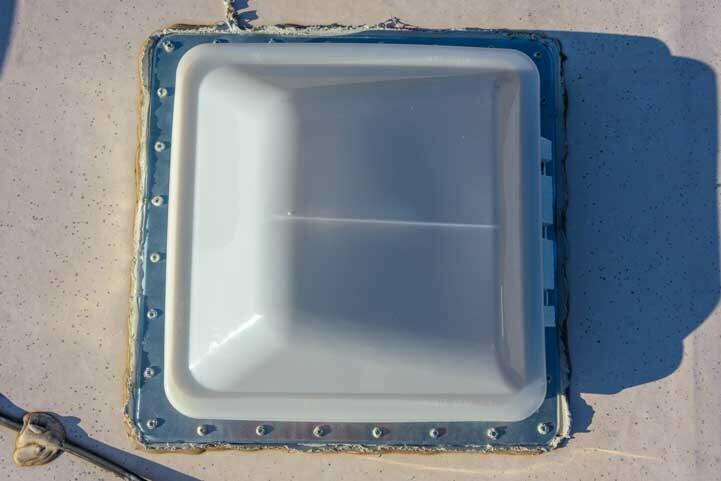 The cabling necessary to carry the currents these panels produce is generally 8 or 10 gauge wire. 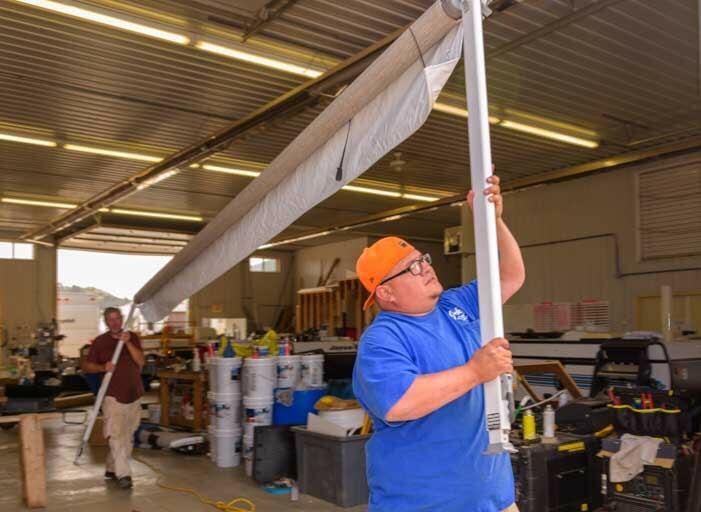 If a rig is billed as “solar ready,” find out how many watts the prospective solar system could support and check out the size of the cable that goes to the roof. 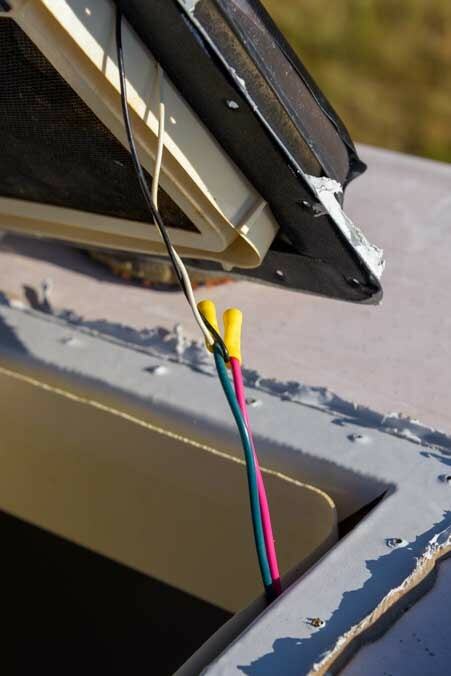 “Solar ready” may simply mean that a skinny cable has been run from the batteries to the roof to support a 50 watt panel. This is great if the batteries are fully charged and you are leaving the rig in storage outdoors for a few months. However, it is not sufficient to live on comfortably. 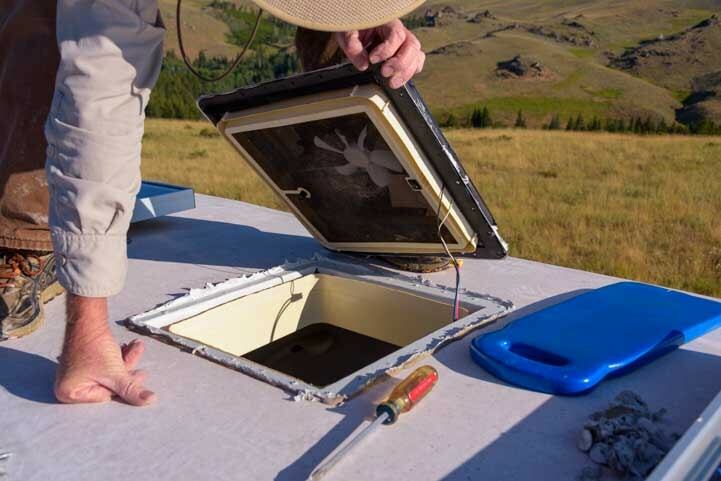 Also, if you plan to install a full-timer solar power system, check the battery compartment. How many batteries are there? What size are they (Group 24? Group 27?)? How many batteries can you add in the compartment? 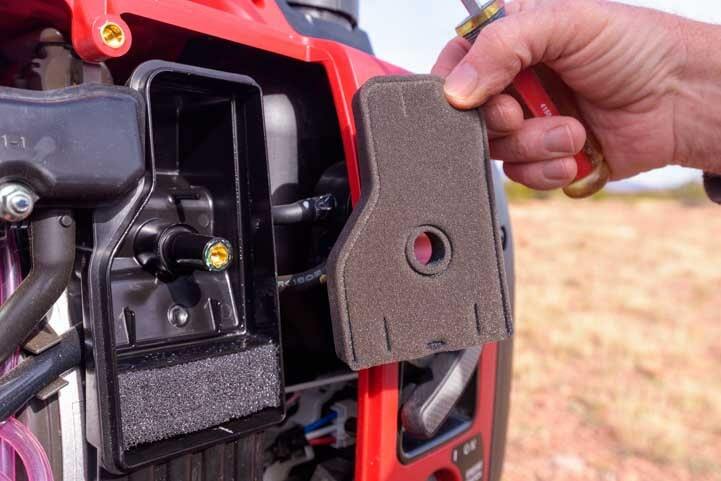 We had the battery compartment customized to support four golf-cart sized batteries. 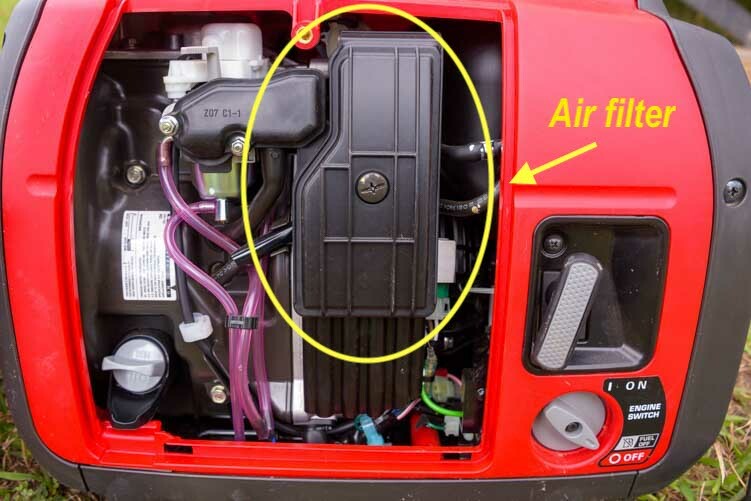 A good sized battery bank for boondocking for long periods is four 6-volt golf cart sized batteries (Group GC2). 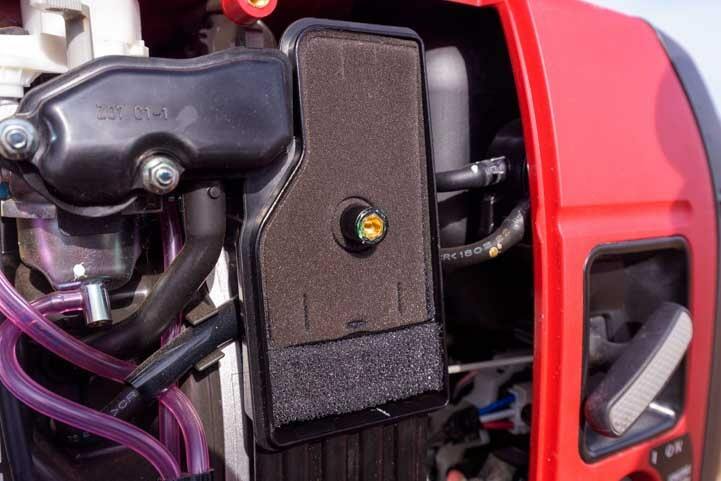 If the battery box in the fifth wheel you are looking at can’t hold that many batteries, think about where else you might put them and whether there is ample support (they are heavy) and venting (wet cell batteries need to be vented). 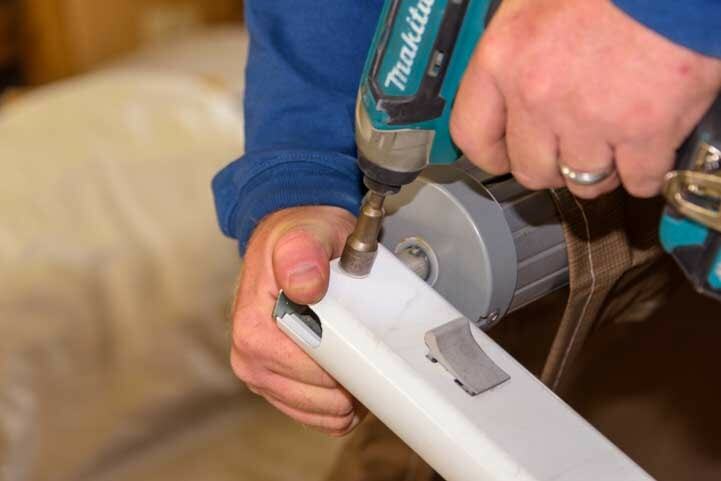 Of course, a basement compartment can be beefed up with a piece of angle iron welded onto the frame and/or vents and conduit going to the battery boxes. 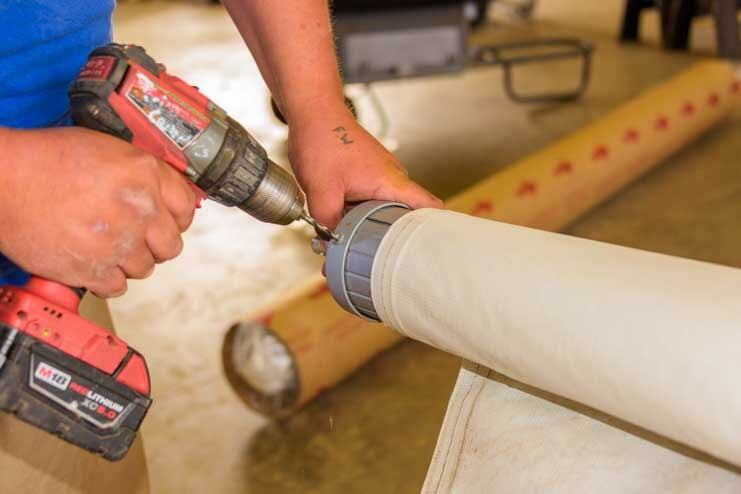 While you are crawling around the basements of prospective new rolling homes, try to find all the major components that might fail and might need to be replaced. 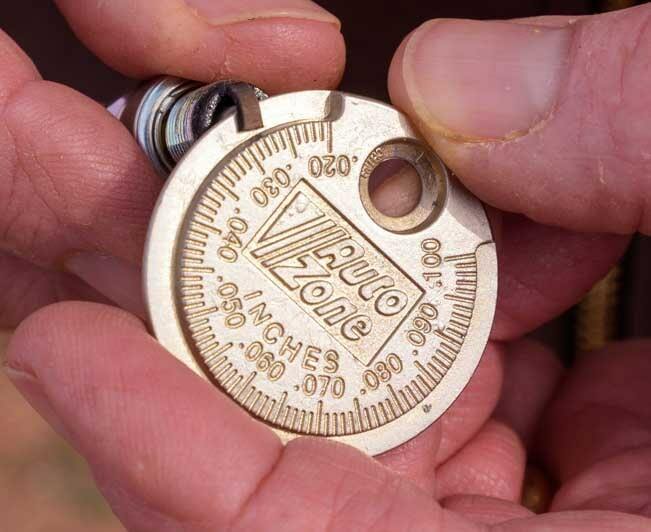 If you are a DIY RVer, this is critically important. 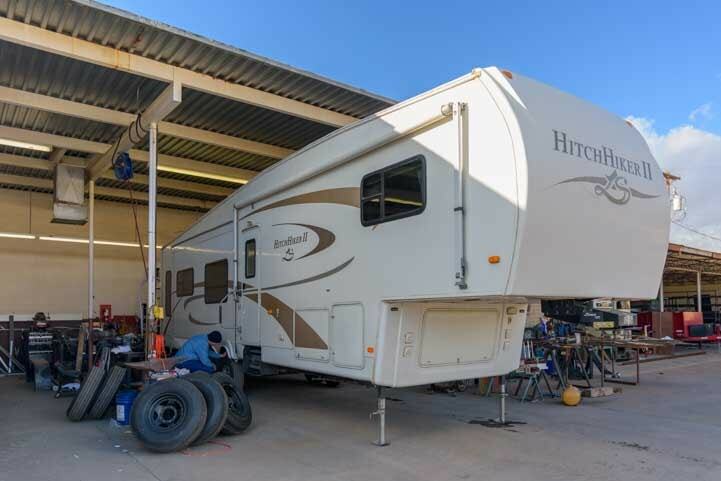 However, even if you are going to hire out the repair jobs to various RV shops around the country, their jobs will be much easier and cheaper if the systems are easy to access. It isn’t “pretty” but it sure is nice to have easy access when it’s time to replace the water pump! Mark replaced it so fast he’d finished the job before I got pics of his work! 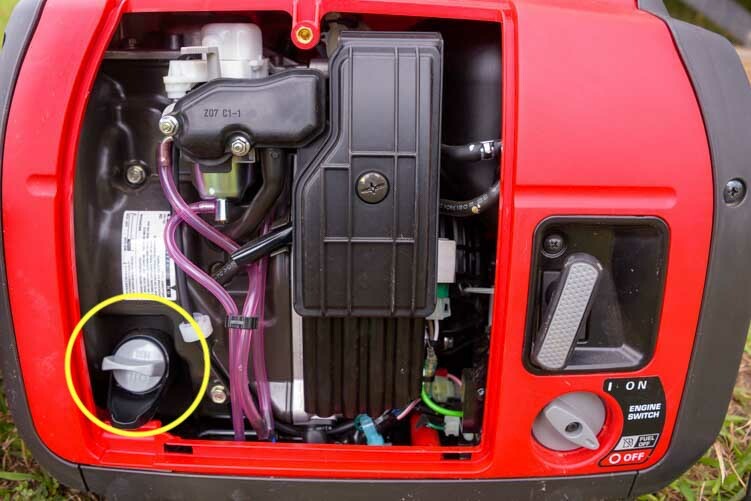 For instance, see if you can find the water pump, hot water heater, power converter, inverter (if there is one), etc. We once met a fellow with a beautiful brand new travel trailer, and Mark spent an hour with the guy trying to find the power converter. It was hidden behind a fixed wall somewhere and they never did find it! When you give up the luxuries of hearth and home in a stick-built house to wander around the country in an RV, you want to be comfortable. Even though you may be just fine with “roughing it” when you go camping on week-long vacations, it is different when you don’t have a “real” home to go home to. For us, the move up from our vacation-purposed popup tent trailer to our full-time 27′ travel trailer was such a big step that the travel trailer looked truly luxurious. It had a sofa, dinette and bed in the living area, all of which were good places for relaxing. It seemed just dandy. However, after spending many long hours in it during our first winter, we realized that we wished we had true recliners to relax in. That simple desire is what spurred us to hunt for (and find) our fifth wheel trailer! If you have been sleeping in a king size bed at home, switching to a queen bed on the road may be a big challenge. It was for us! It’s a shock to find out the love of your life has so many arms and legs! We have never seen a full width king size bed in a fifth wheel trailer except in a custom design. 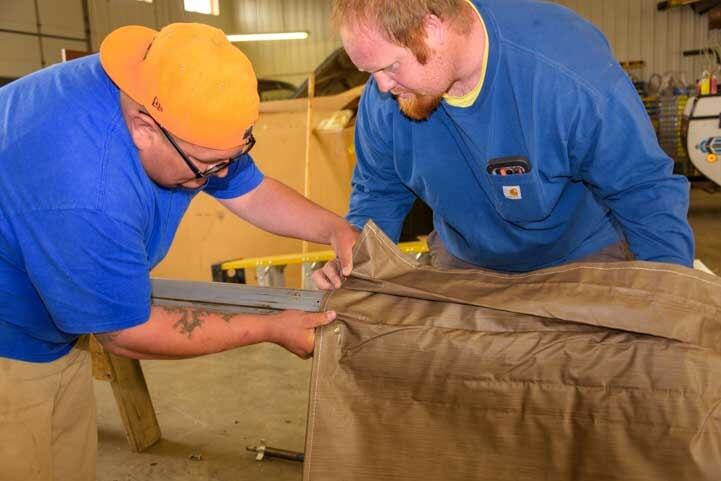 This is something to keep in mind if you think you might upgrade your trailer’s factory installed king mattress sometime down the road. Will the new residential king mattress, which is wider than the old mattress that came with the rig, fit on the platform without being squished? 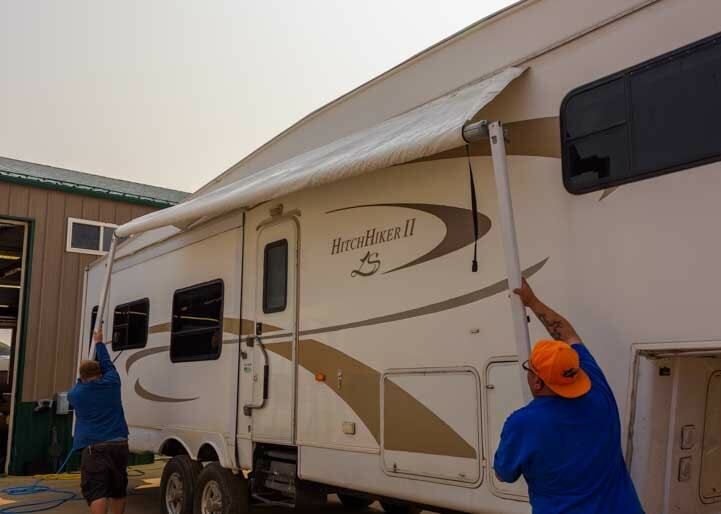 One of the things that we tend to think about when we stand in a beautiful, spacious fifth wheel trailer on a dealership lot is how functional the rig will be when all the slide-outs are closed. Some folks never go in their trailers without opening the slide-outs, but we do it all the time at rest stops and at the grocery store. 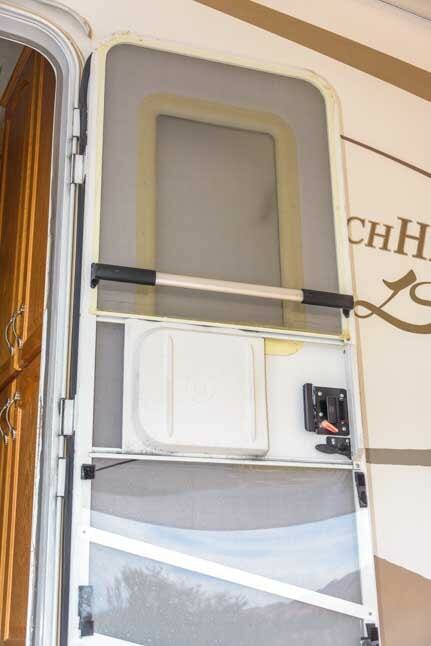 Ask the salesman to close the slide-outs on your prospective new full-time fifth wheel and find out which things in the kitchen, living room and bedroom you can no longer access. 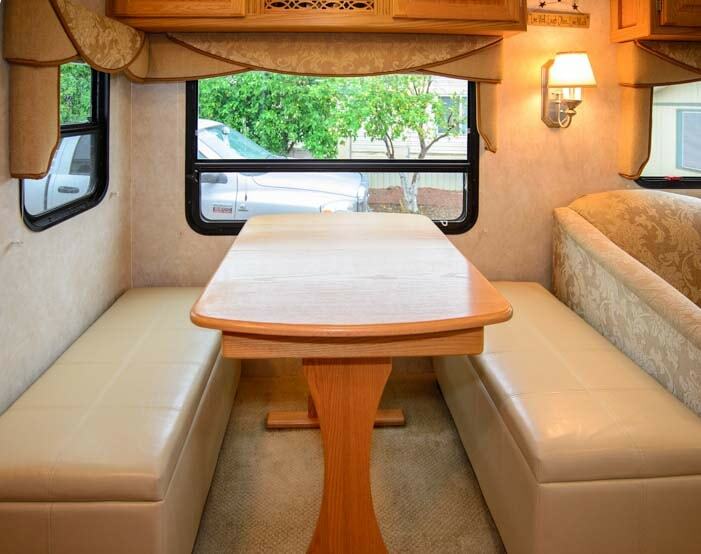 The open floorplan of our ’07 NuWa Hitchhiker II LS 34.5 RLTG Fifth Wheel trailer. Can you get into the fridge for a beer? Can you access the pantry for goodies to make a sandwich? Can you microwave something or boil water in a teapot on the stove? Can you wash the dishes after lunch? Can you use the bathroom? Can you get into the bed? Can you sit on a chair in the living room or at your dinette? 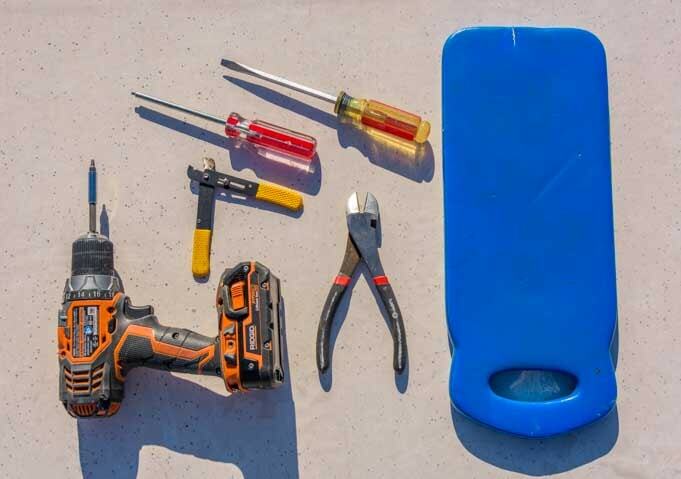 These may sound like goofy questions, but when you live in an RV full-time it is surprising how often you may want to use the rig without having to open the slide-outs. 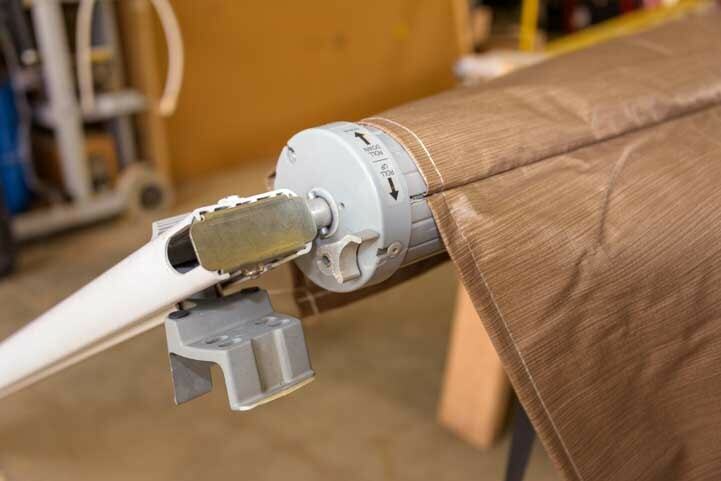 If you roll a shopping cart loaded with groceries up to your front door at the supermarket, can you put them all away without opening the slide-outs? If you visit a friend and park your rig in front of their house for a few days, can you access your clothes and bed so you don’t have to stay in their spare bedroom? We can bake bread when the slides are closed. Not crucial, but it’s nice to have access to the entire kitchen. We are fortunate with our fifth wheel’s floorplan because we can access almost everything without opening any of the slide-outs. The only things we can’t get to are the two recliners in the back of the rig and our dresser drawers (opening the bedroom slide 6 inches is enough to get into those drawers). We have actually lived in our trailer with the slide-outs closed for several weeks at a time. It’s skinny, but it’s doable. Unfortunately, the super popular island kitchen floorplan designs generally don’t allow for full use of the kitchen when the slide-outs are closed. However, there are loads of open floorplan designs that were popular a decade ago, like ours, that the RV designers may eventually revive. After all, there are only so many possible floorplans for a fifth wheel trailer! 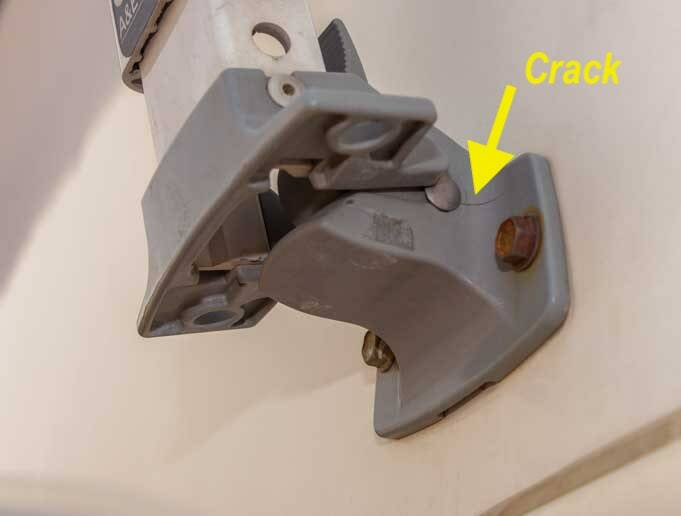 RV refrigerators that run on both 120 volt AC power and propane gas are being replaced in many fifth wheel trailers with residential refrigerators that run exclusively on 120 volt AC power. With some fifth wheel brands you can order the rig with either type of refrigerator. In other cases you can only order it one way and you would need to do the replacement yourself after you’ve bought the rig. RV refrigerators are wonderful because you can dry camp in your RV for months or years on end and have refrigerated food the whole time. All you need to do is keep the propane tanks filled. 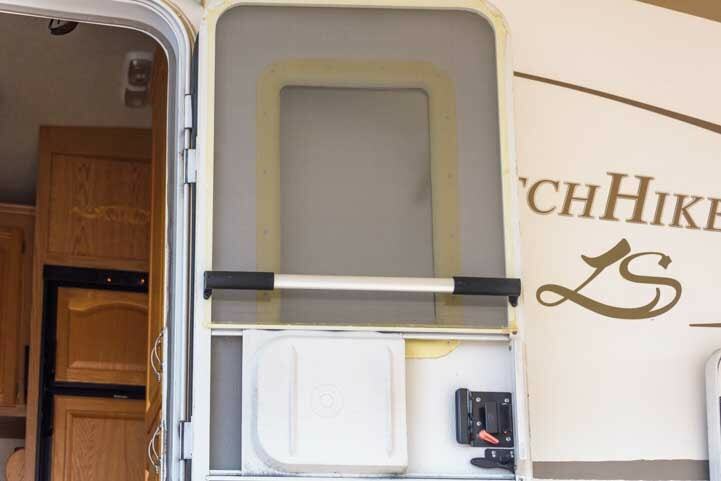 Our 8 cubic foot RV refrigerator uses about 30 lbs (or 7 gallons) of propane every three weeks. RV refrigerators have a few negatives, however. 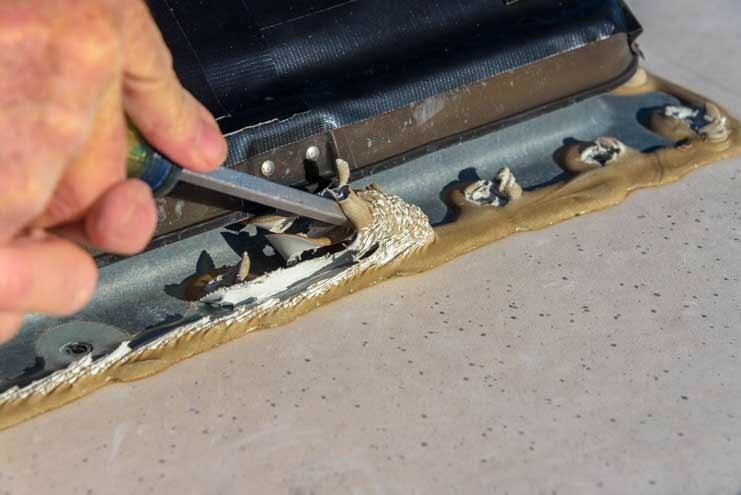 One downside to RV refrigerators is that they are not self-defrosting. You need to defrost them. 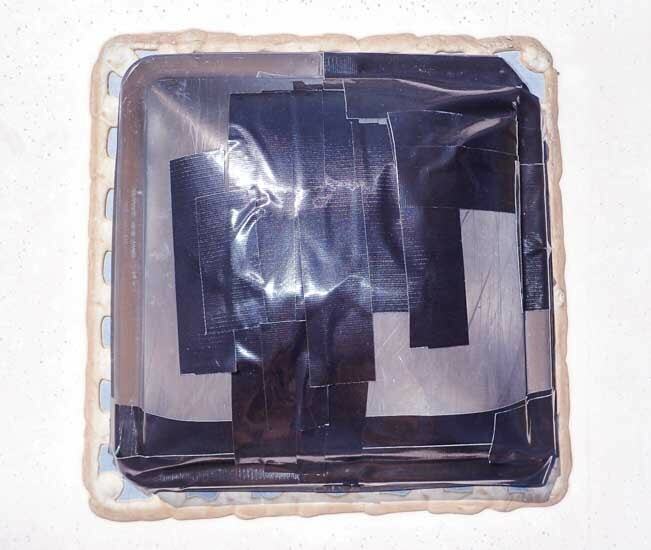 After decades of living with a frost-free refrigerator, it is a shock to go back to the olden days (if you were around then) of having to defrost the RV fridge every month or so. However, my amazing hubby Mark has perfected the art of defrosting and he can now pull it off in about 20 minutes. So, it’s not that bad a chore if you stay on top of it (and if you have a wonderful partner who is willing to do it for you!). See the blog post about quickie fridge defrosting here. Mark has simplified the refrigerator defrosting process so much it takes him only 20 minutes. Lucky me! 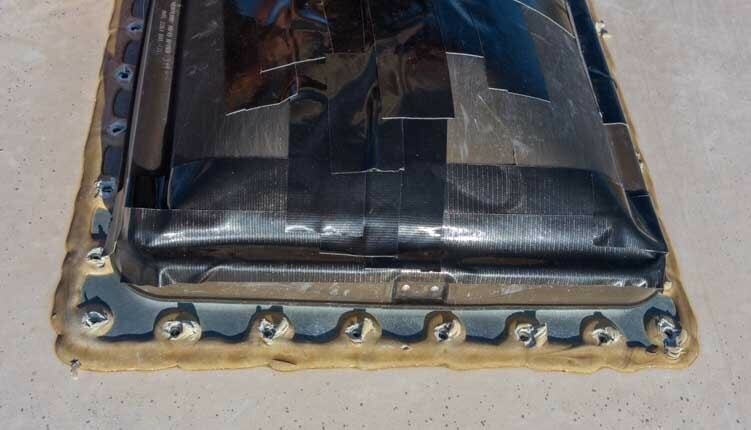 Another disadvantage is that they don’t modulate the temperature in the fridge with much precision and they aren’t particularly well insulated or energy efficient. We keep a small thermometer in the fridge so we have a feeling for what’s going on. 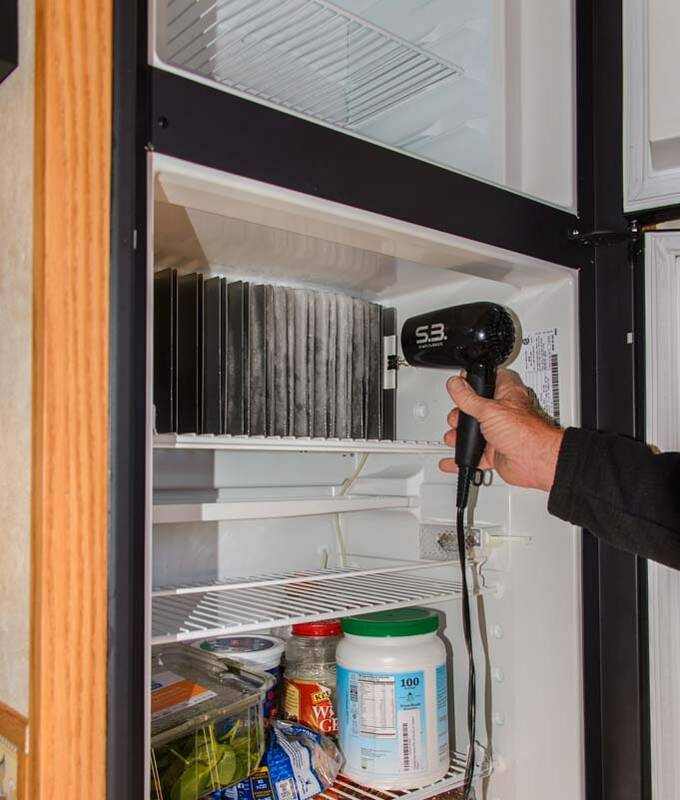 The temp inside varies greatly depending on whether the wall behind the fridge is in the sun or shade and whether the temp inside our rig is 40 degrees, as it is on some winter mornings, or 90 degrees as it is on some summer afternoons. Our fridge is usually on level 4 or 5 (the coldest two settings) because we like our beer to be ice cold. However I do sometimes find my yogurt has frozen a bit on the edges. 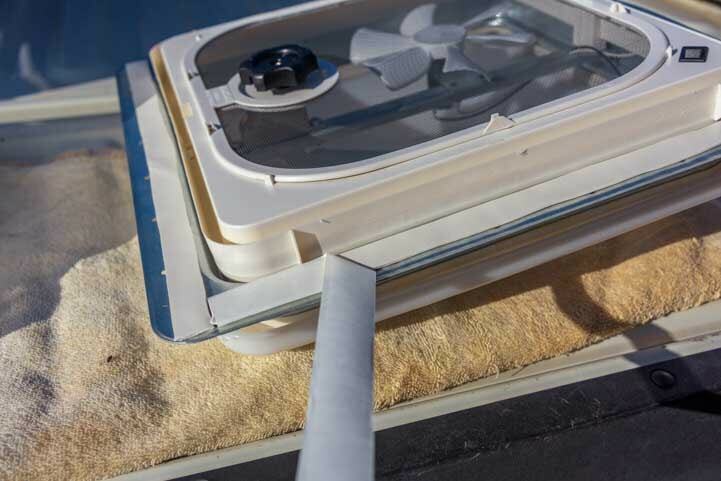 RV refrigerators also have a shelf life. It is about 8 years! We found that out the hard way when our RV refrigerator died and we had to get it replaced. Luckily the replacement was straight forward and was covered by our extended RV warranty (blog post about it here). Our new RV refrigerator is slid through our dining room window on a fork lift. The biggest surprise when we got our RV fridge replaced was we found out the warranty companies expect those fridges to last only 8 years. Of course, they figure that into the cost of the warranty, as they should. So, even though we were shocked that ours died, our warranty company wasn’t surprised at all. 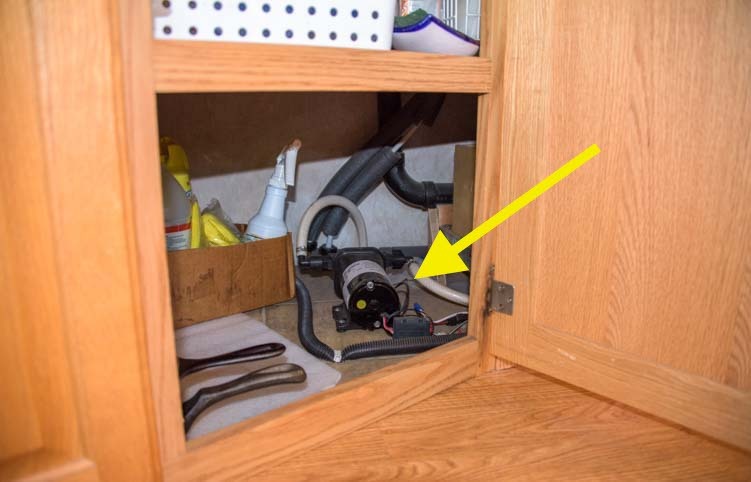 Perhaps the most damning thing about RV refrigerators is that they run on propane and they have been known to catch fire and torch entire RVs. A burning RV burns to the ground in seconds because of the propane tanks and manufacturing materials. There was a rash of RV refrigerator fires about a decade or so ago which is part of what pushed the industry towards building RVs with residential electric refrigerators instead. 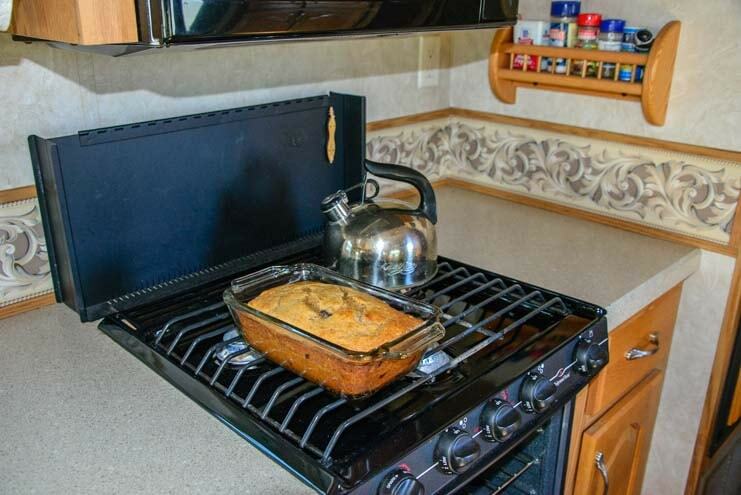 However, RV life isn’t totally rosy with residential refrigerators either, especially if you want to boondock or dry camp for extended periods of time. While a residential refrigerator may be a highly efficient Energy Star appliance, it may not have a solid locking mechanism to keep the doors closed in transit or rails to keep the food on the shelves while in transit (check on that). And it will require a lot of power to run while the rig is not plugged into a power pedestal. A 12 to 14 cubic foot residential refrigerator requires a little over 300 kwh per year to run. This is about 0.8 kwh per day, or, very roughly, about 80 amp-hours per day. In the winter months when the sun rides low in the sky and is up for a short period of time, an RV will need about 400 to 500 watts of solar panels and 450 amp-hours of batteries just to run the refrigerator. This is about what it takes to run everything else in the RV! An 18 to 22 cubic foot refrigerator will require even more. This is not to say that it is impossible to install a big enough solar power system to run a residential refrigerator — we’ve had readers contact us to say that they have done it and they’re loving it! — but the expense and weight of the batteries and of the solar panels is something to consider before signing on the dotted line for that beautiful new fifth wheel trailer with its residential fridge. 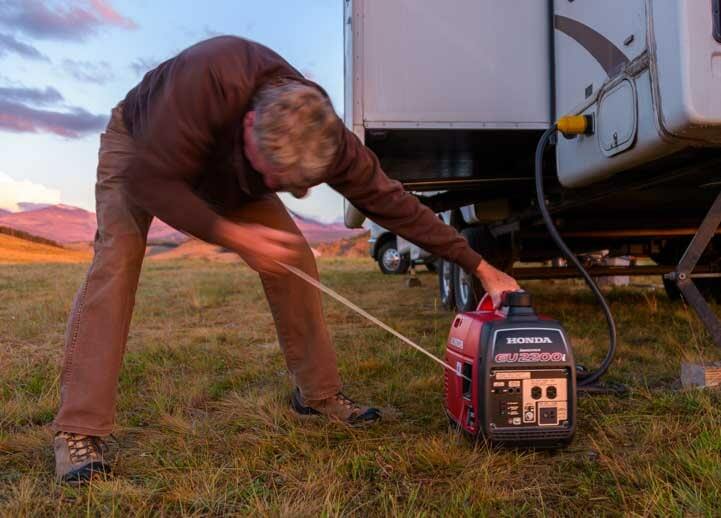 Also, even if boondocking is not your style, be sure that the battery bank and the inverter that support the residential refrigerator when not hooked up to electrical power are sufficiently big enough to keep the fridge running as you drive. We have heard of 1,500 watt inverters just not making the grade with a big residential fridge (2,000 watts was needed). Or, just turn the fridge off and keep it closed until you get where you are going. Of course, residential refrigerators are not designed to be turned on and off frequently. Lastly, the fabulous thing about a big, shiny, 22 cubic foot stainless steel residential refrigerator is that it can hold a ton of food. There will be no more turf wars between the beer and the veggies (gosh, would we ever love that!). However, all that food weighs a lot, and big fridges often become storage places for old containers of food you’ll never eat. If you are buying a full-time fifth wheel that is skinny on its Cargo Carrying Capacity, then a huge refrigerator that can hold lots of food may push you into possession wars between food, tools and clothes in the closet. On the bright side, a residential refrigerator is much less prone to failure than an RV fridge, and in the rare event that you have to replace one, it could easily cost thousands less than an RV fridge. I Like the Fifth Wheel But I Don’t Really Like That Couch! 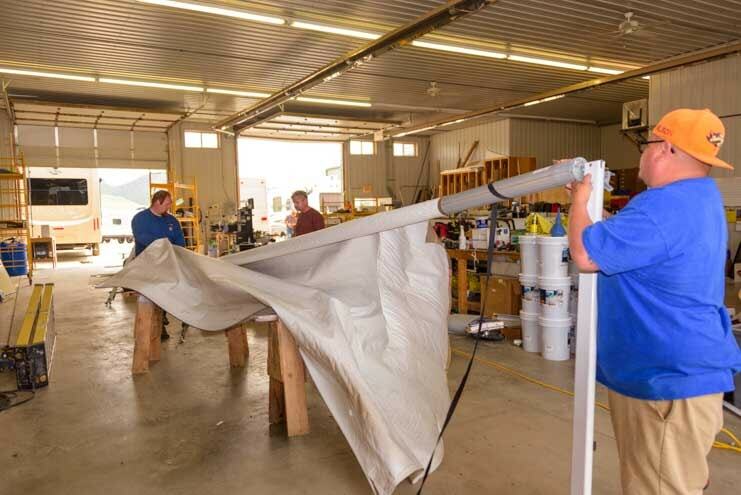 While it’s ideal to find a rig that has furniture you totally love, a fifth wheel trailer is just a box — floor, walls and ceiling — and any residential furniture can be put in that box. We have replaced both our dinette chairs and our recliners in the course of living in our fifth wheel all these years, and last week we replaced the couch! The old chairs were elegant, but these cushy benches are much more comfortable. Plus they give us more storage space! 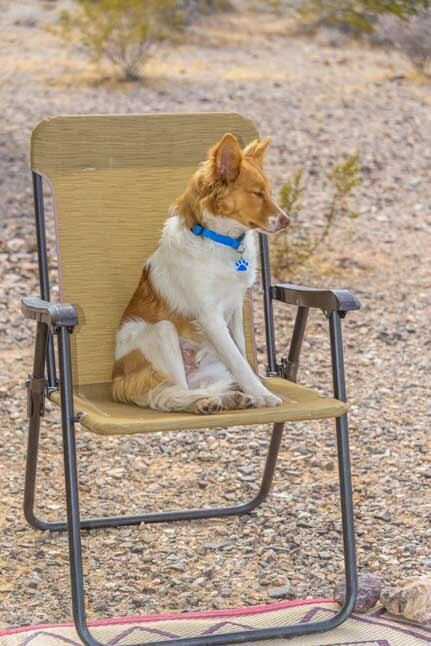 Add Storage and Seating Capacity at your RV Dinette! Can You Sell Old Stuff on Craigslist in the RV Lifestyle? Replacing our Recliners! We also replaced our mattress with a fancy Simmons Beautyrest mattress. 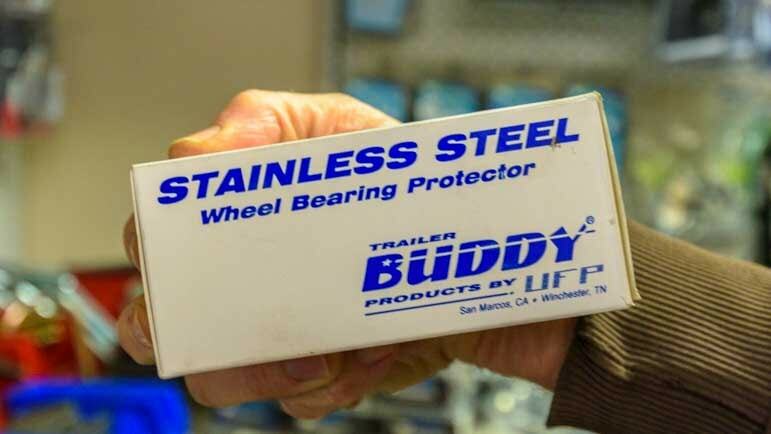 After all this discussion of what to look for in a fifth wheel trailer for full-time living, it is important to remember that the brand new fifth wheel you buy today will be worth about half of what you paid for it ten years from now. If it is well maintained it might be worth a smidge more. If it isn’t, it may be worth less. What’s worse, the fact that it was lived in full-time rather than kept in a garage and never touched will turn many prospective buyers away or make them hit you up with a low offer. Hmmm…. 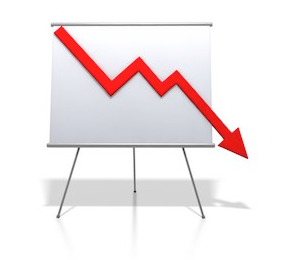 An RV’s value declines with time. On the flip side, going RVing full-time is a dream, and it’s hard and maybe even unfair to put a price on your dreams. If you have the funds and you can spend a lot on a rapidly depreciating fifth wheel trailer without crippling your finances later in life, definitely go for it. 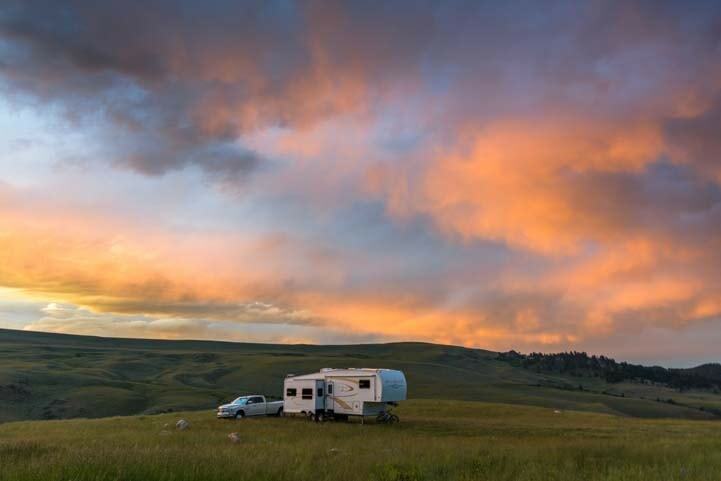 What could be better than casting off on a dreamy new lifestyle in a dreamy new RV? No matter what you buy, negotiate hard. You are in the driver’s seat — until you are in the driver’s seat! Many mass-market manufacturers anticipate selling for about 70% of MSRP. Others are closer to 80%. If you go custom, well, you’re be paying for the very finest of the finest. So, the focus will be on getting exactly what you want rather than haggling over the price. With a custom rig you get what you ask for… so be knowledgeable and smart about what you ask for! 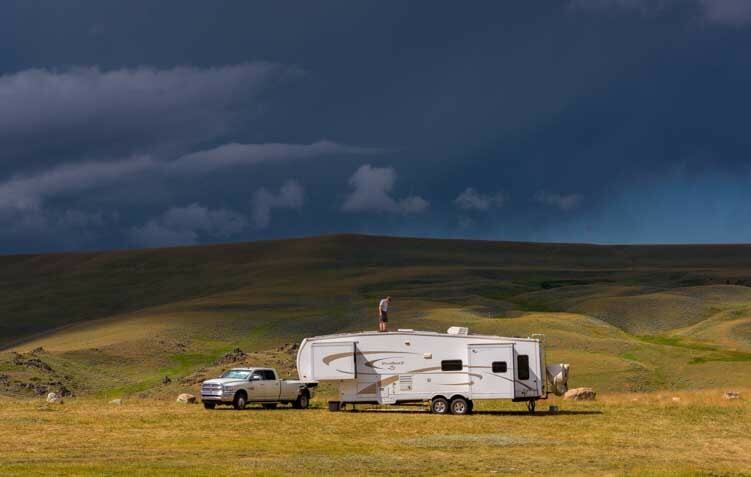 If you aren’t sure of you future finances, and you aren’t sure if you’ll like the full-time RV lifestyle, and/or you aren’t sure if you’d prefer a fifth wheel or a Class A motorhome as your house on wheels, consider getting a cheaper model or a used trailer to start. The rig you live in is just part of the equation of putting together that champagne lifestyle of full-time RV travel. The real reason most folks run away in an RV is because they want to get out and see something of this continent, get to know the different regions of our country and of our neighbors’ countries, and knock a few travel destinations off their bucket list. The options of places to visit are limitless, and we’ve got 10 years worth of travel tales on this website that tell the stories of what we’ve seen and where we’ve been since 2007. 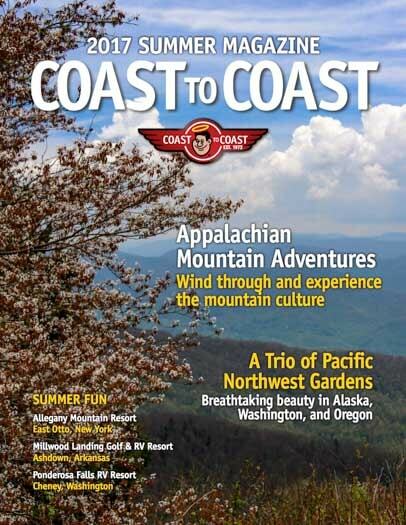 I’ve also written a lot of articles for Trailer Life Magazine showcasing different parts of the country that make for an enjoyable RV destination. 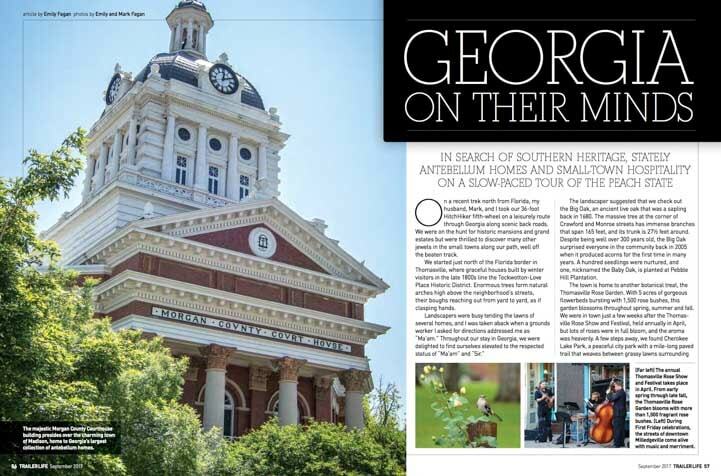 The Antebellum Trail in Georgia is a terrific RV route for folks heading north/south through Georgia. 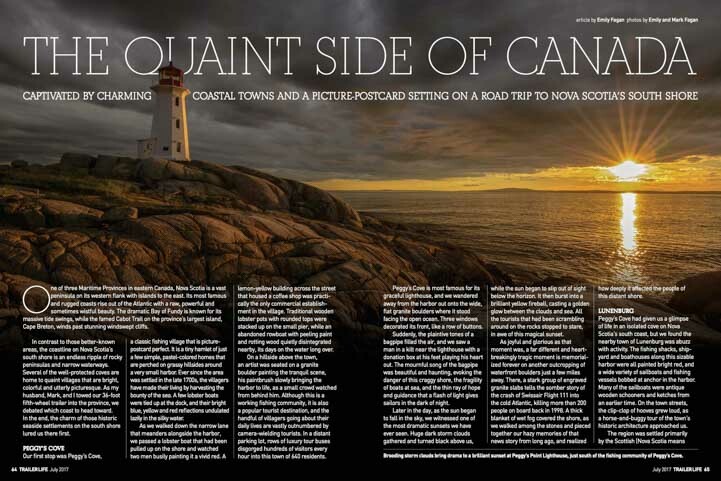 A few of these feature articles have turned up in Trailer Life over the past few months and can be read at these links: Georgia on Their Minds, The Quaint Side of Canada, and Downeast Maine. 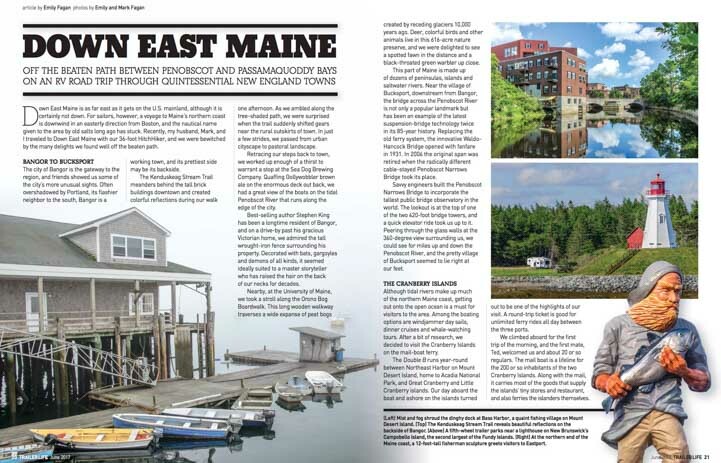 Images of the first two pages of each article are below. I also have a bi-monthly column on the back page of Trailer Life that showcases a beautiful photo of a gorgeous spot along with a few words about what makes that place special. 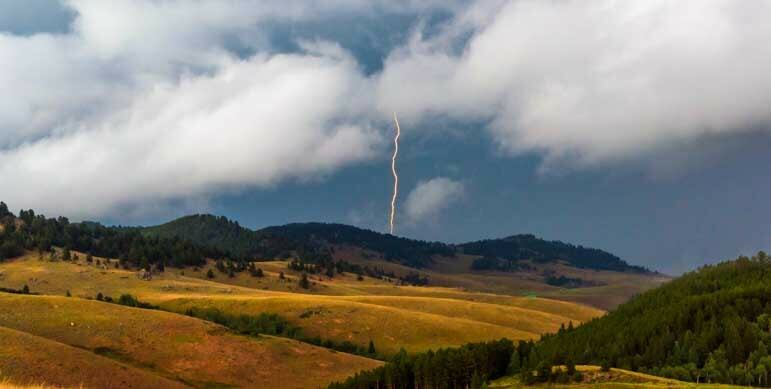 My most recent columns have focused on: The Rocky Mountain Beach Town of McCall Idaho and a Forest on Fire – Fall Colors in Colorado. 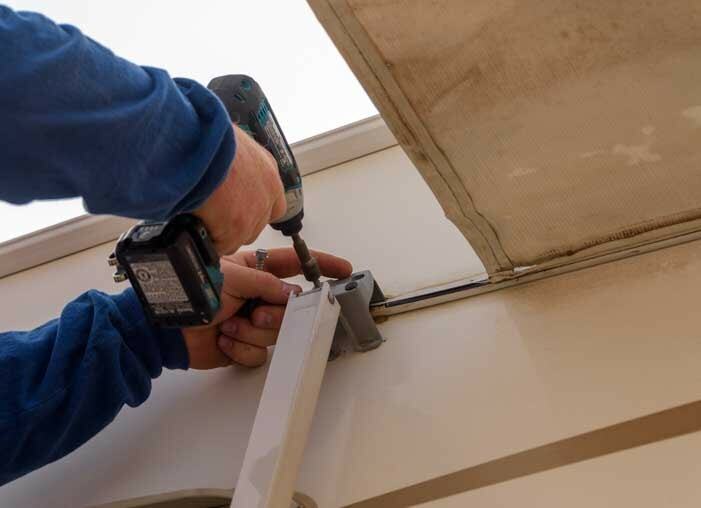 Trailer Life Magazine is a monthly national magazine and it offers not only mouth-watering photos and stories of places to take your trailer, but it also devotes a lot of pages to technical issues that trailer owners face. The technical editorial staff at Trailer Life is both very knowledgeable and very meticulous about ensuring what they discuss and review is accurate. 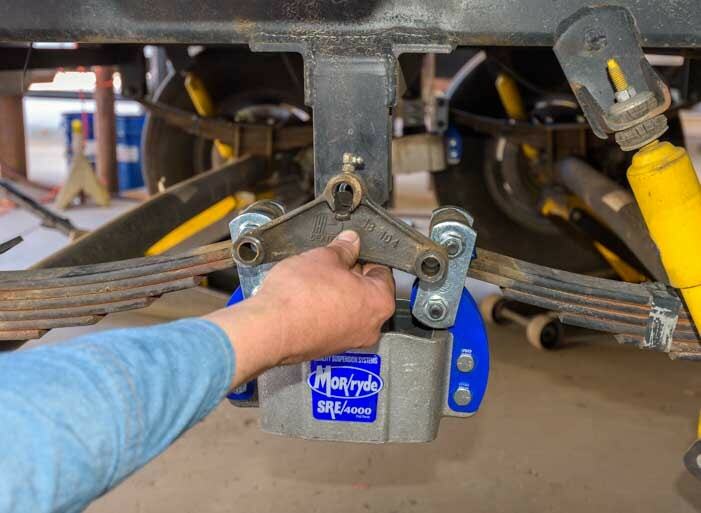 I have written a lot of technical articles for Trailer Life, from discussing RV roof maintenance to RV dump station tips to an article about the 2016 Dodge Ram 3500 dually truck and one about the new puck based OEM fifth wheel hitch from B&W Trailer Hitches. I have always been amazed at the extensive review process and discussion process that each of these technical article has undergone. Every little minute detail is reviewed for accuracy, sometimes spawning some lively debates. There are a gazillion RV blogs out there that make for super fun reading and research and learning, but there is something to be said for a magazine that has been in print for over 75 years. Some people on the team have been with the magazine nearly half that time! Trailer Life is hard to find on newsstands these days. New Camping World members receive a few issues as part of their membership (or they can get Motorhome Magazine if driveable RVs are more to their liking). If you get an annual subscription at the link below, you’ll see the article I’m working on about “first-timer” fifth wheels when it comes out! 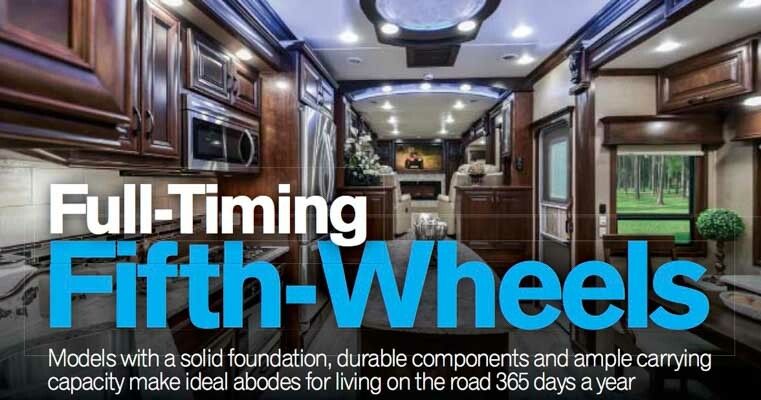 Have you been shopping for a full-timing fifth wheel? We’d love to hear your thoughts! There are loads of fifth wheels on the market that would make a fine full-time home. Enjoy the search! If you found this article useful, please help support us by making a contribution using the Donate button below or by using any of our links to Amazon the next time you shop for anything online! The RV Lifestyle and Living in an RV Full-time – Index of article links about the RV lifestyle. 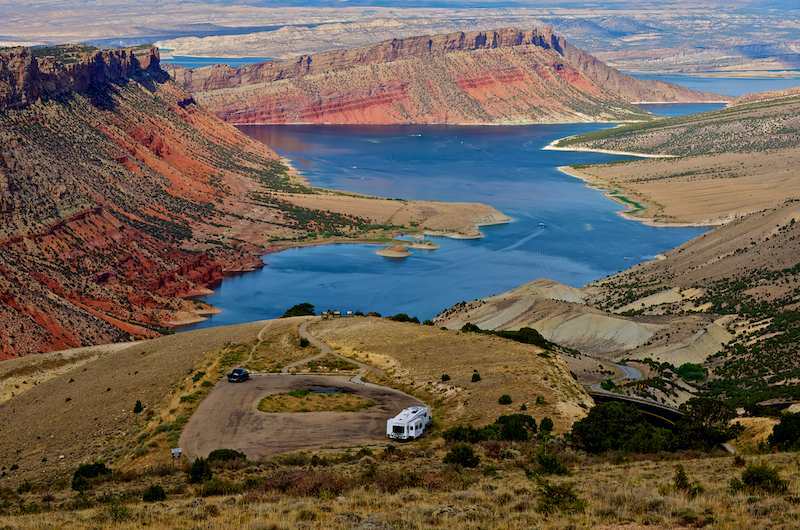 It was a steep climb to get to this gorgeous spot in Flaming Gorge, Utah. The book Mountain Directory West for Truckers, RV and Motorhome Drivers is a terrific resource. Every mountain pass in the west is described in detail, including grades, turns, how many miles you will drive at each grade and whether the road has steep drop-offs or wide shoulders and other helpful info. This book (and its companion eastern states edition) is available in a print edition or as an eBook. Steepness is described in terms of grades: 5% grades are not bad; 10% grades are very steep. The tightness of the switchback turns are described by the speed limit: 25 mph turns are a bit tight; 15 mph turns are very tight. Once you’ve got a handle on the nature of the pass you’re considering, it also helps to get some first-hand feedback from drivers who’ve done it. As we travel we often ask locals about upcoming roads that concern us. Folks at visitors centers, chambers of commerce, local stores and libraries can give you a sense of what the drive is like, and this will help you decide whether you want to tackle the climb. For the steepest climbs and most scary seeming roads, we driving the road in our truck without the trailer first. Then we know exactly what to expect when we drive it with our trailer attached! At the bottom of a big pass, even if it’s a hot day, we turn off the air conditioning. If the pass is a long one, we also turn on the heat — full blast — to draw heat off the engine. This is tough on the passengers on hot summer days but keeps the engine happy. If you need to pull over to let the engine cool down, keep it idling so it can continue to circulate anti-freeze through the radiator. The electric fan should kick on to circulate air through the radiator as well. You can also turn the heater on with the fan on high to help draw more heat off the engine even faster. Depressing and letting off the gas pedal will engage the exhaust brake. If the descent is steep, dropping into 2nd gear will slow the vehicle down further. If it is very steep, switching into 4×4 Low and driving in 1st gear can slow the rig to 5 mph and make it possible to creep down a crazy steep mountain in a controlled fashion. We’ve done it and it works!! As I mentioned, we aren’t experts, but these few simple things have made a big difference for us. Good luck with your mountain driving, and don’t be afraid to take the scenic route, even if it involves some steep climbs and descents! New to this site? 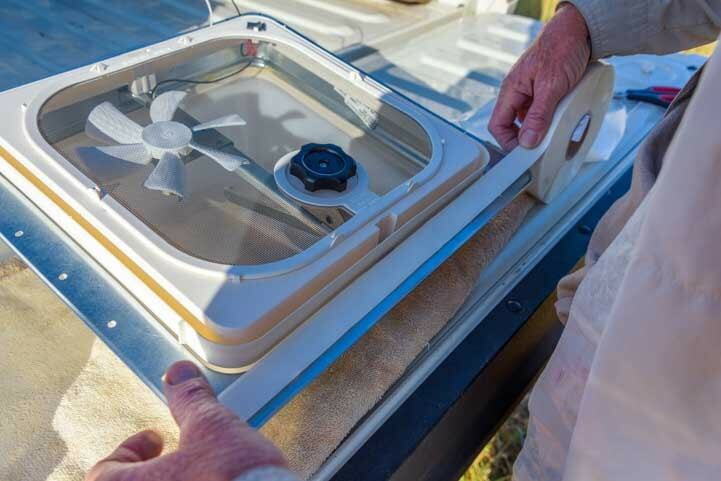 Check out RVing Lifestyle and Tech Tips at the top of the page for detailed info about installing a vent-free propane heater, living the full-time RV lifestyle, how to go boondocking, the costs of full-time RVing and more. Please visit our Home page and Welcome page for RVers to learn more about us and discover all the other good stuff available to you on this blog.